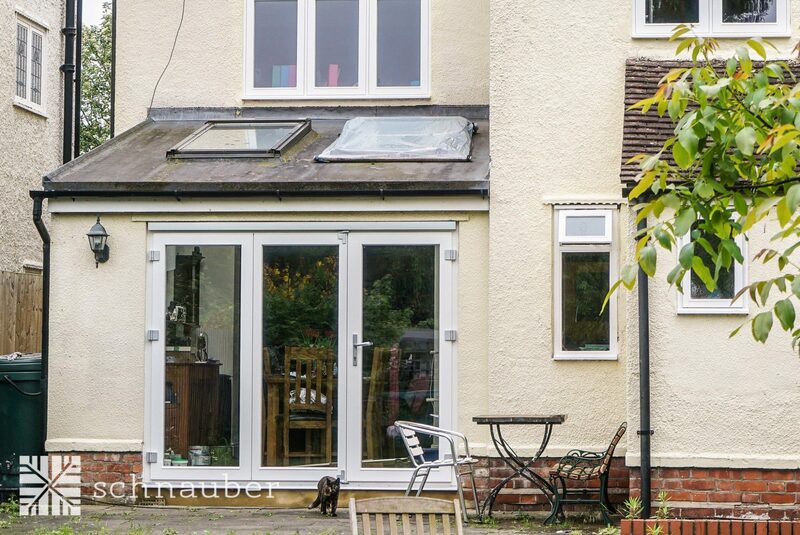 Passive House is a voluntary standard popular in Europe. 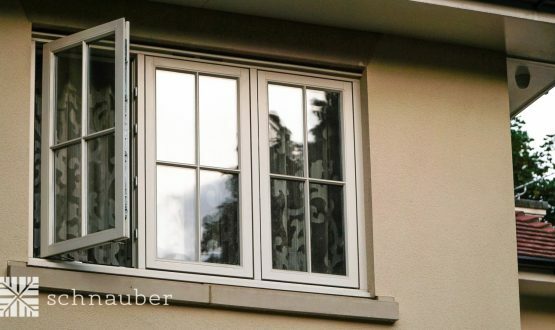 The Passivhaus House Institute recommends that all Passive House windows should have a U-value of not more than 0.8W/m2K. 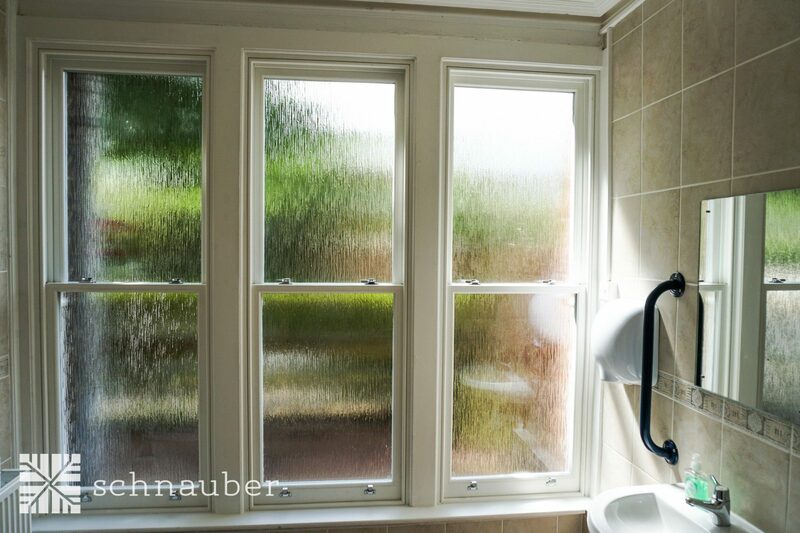 At Schnauber, we specialise in customising timber Passive House windows. 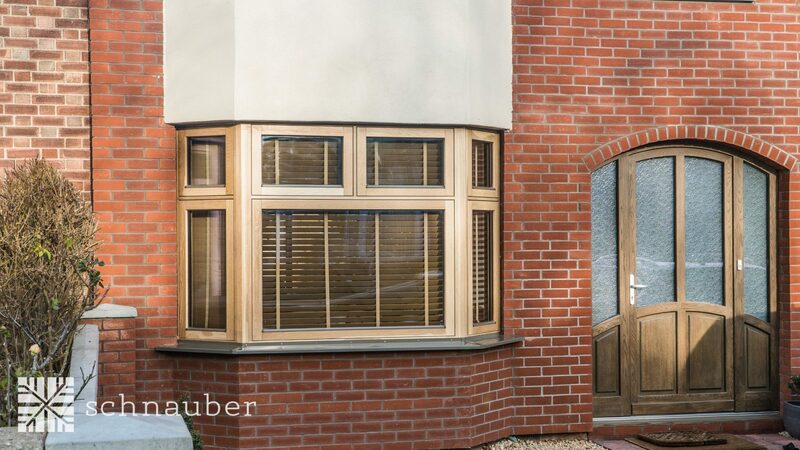 All our timber Passive House windows are extremely energy efficient and Passivhaus-certified, meeting all the requirements of German Passivhaus House standards. 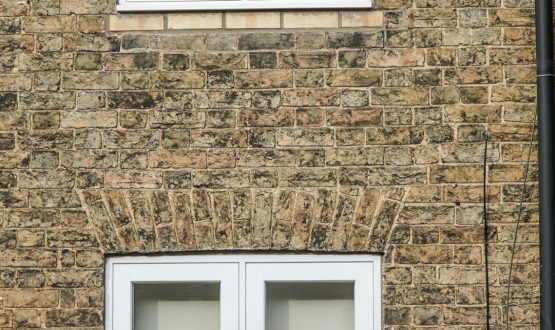 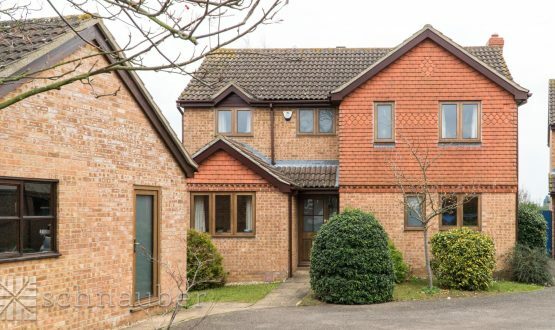 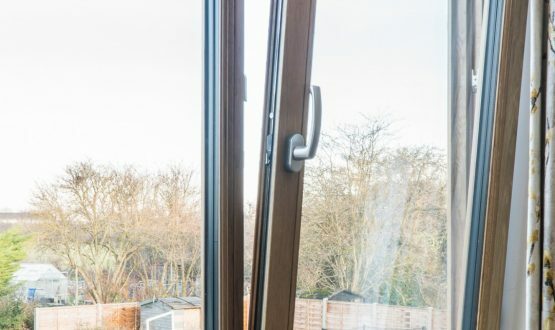 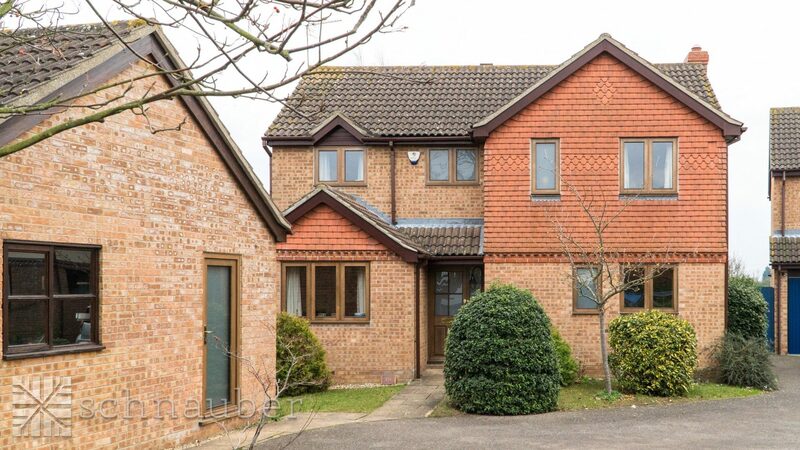 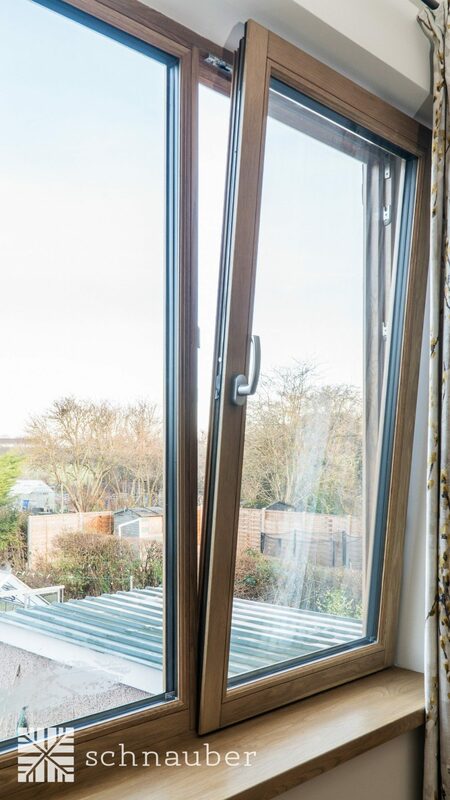 The windows have been expertly designed to reduce energy consumption and come with maximum airtightness and thermal insulation characteristics. 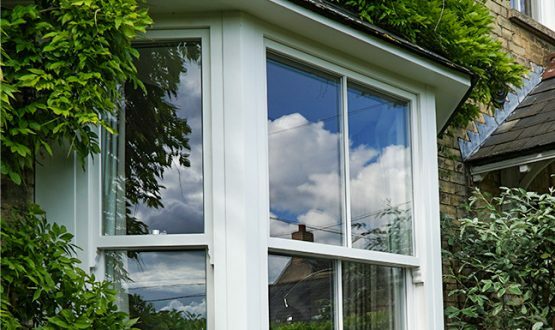 We fill our window frames with krypton or argon to prevent heat transfer and we use glasses with no thermal bridges to provide a consistent temperature during the summer and winter. 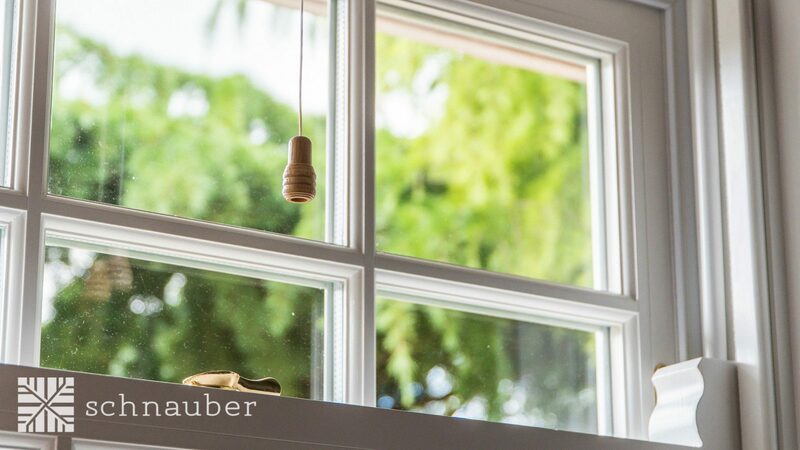 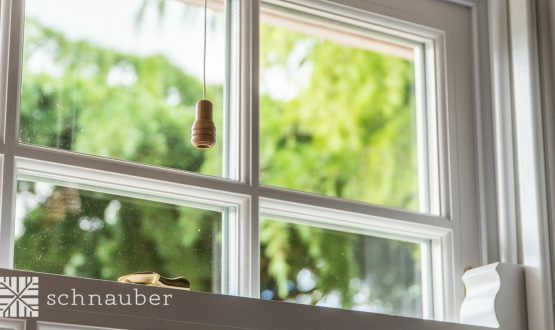 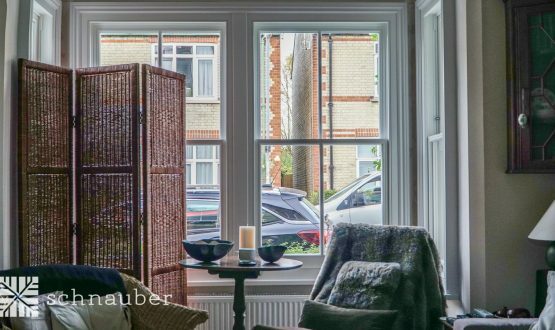 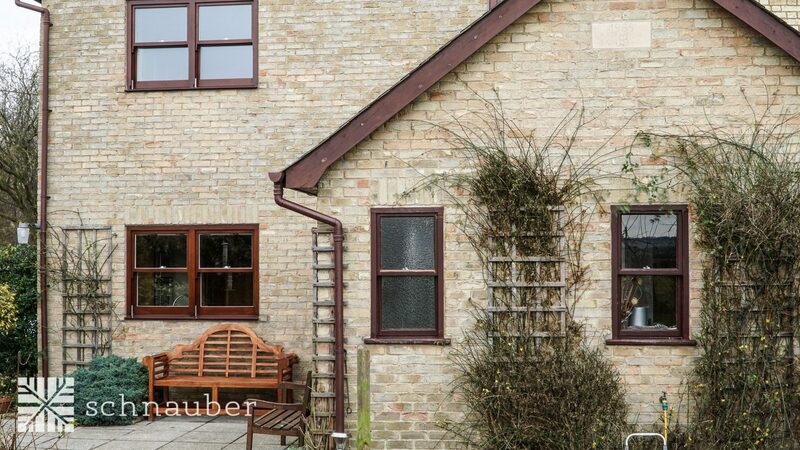 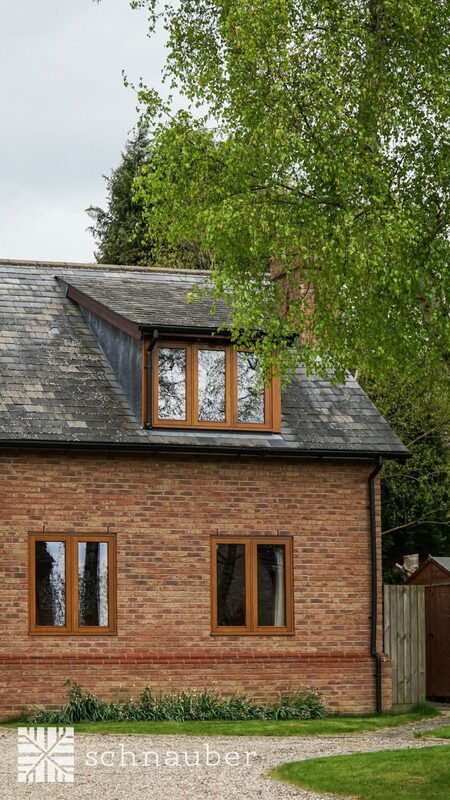 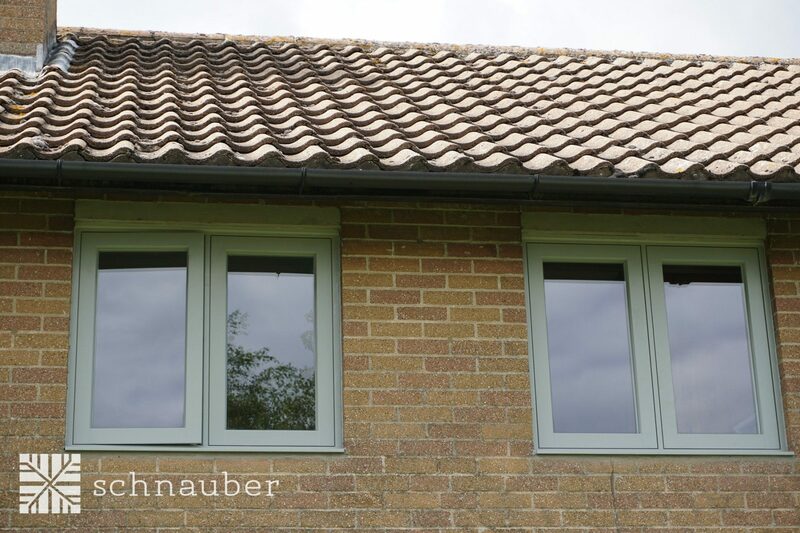 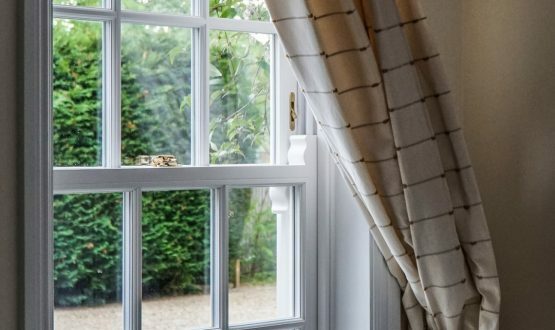 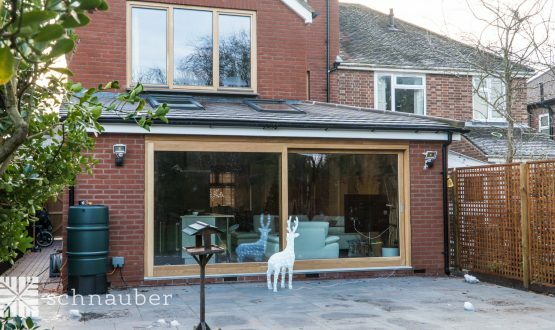 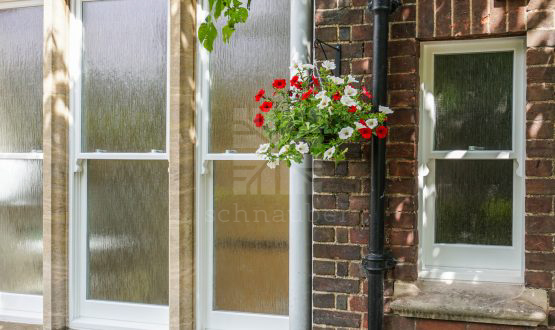 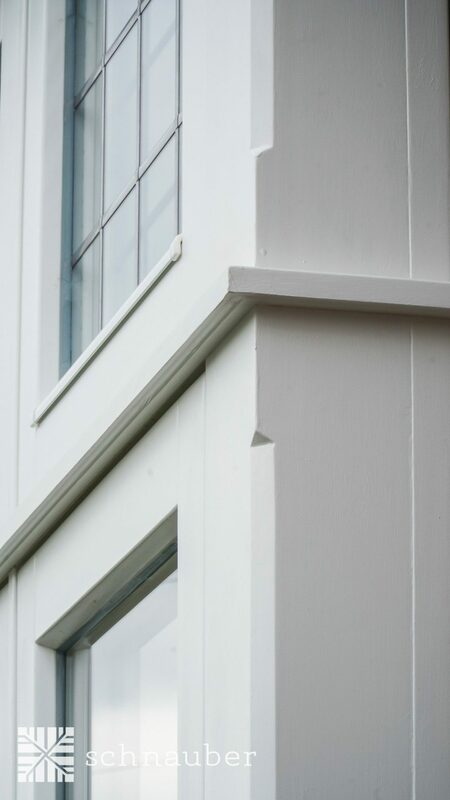 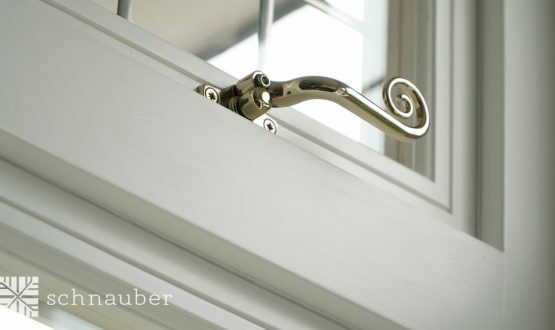 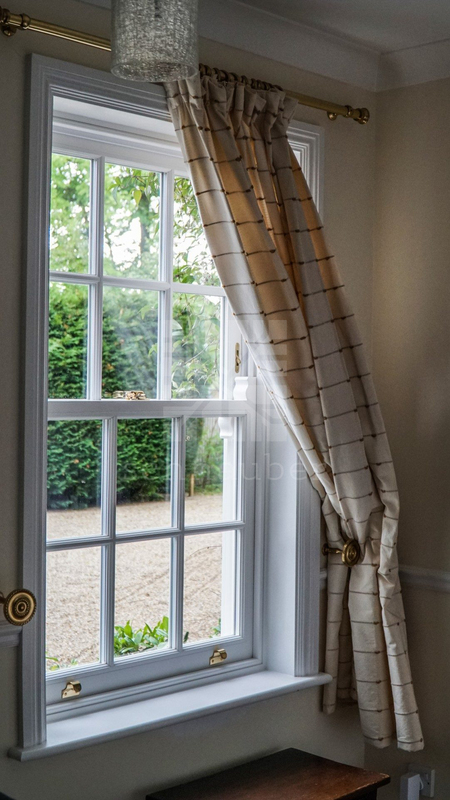 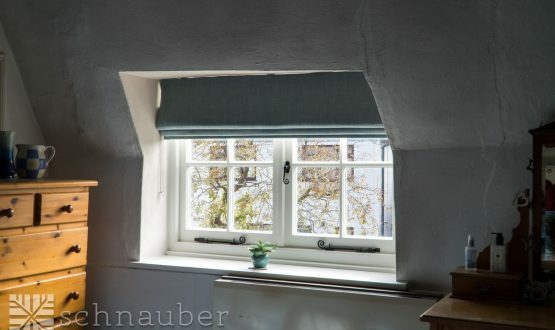 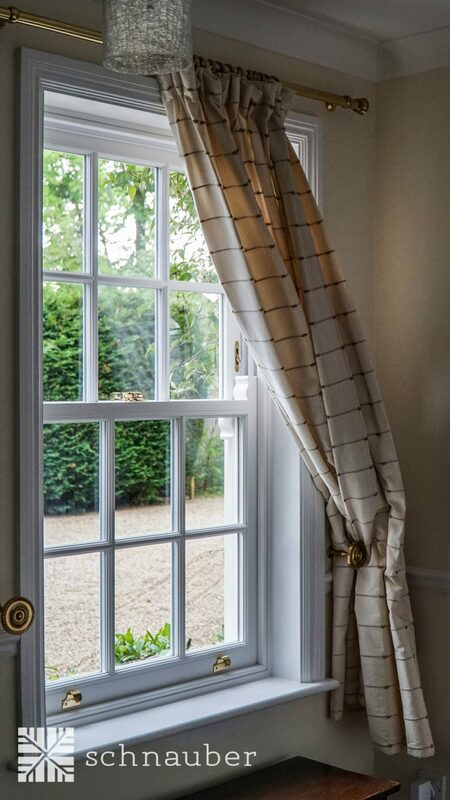 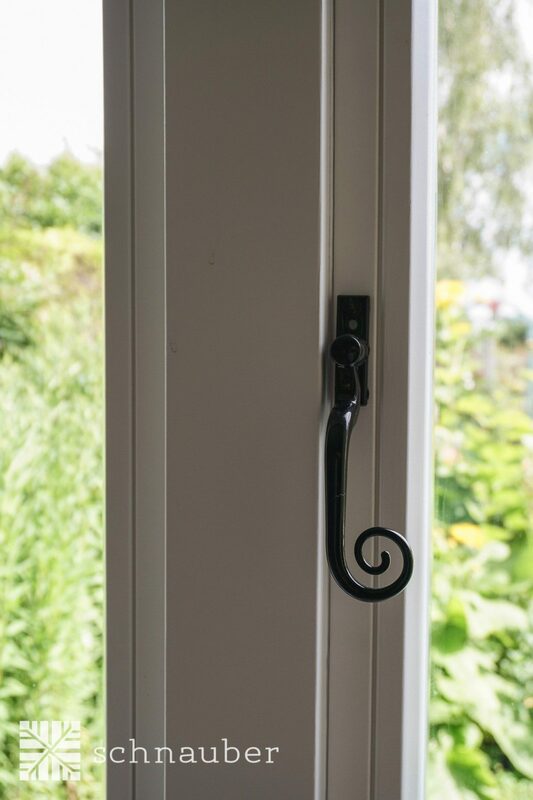 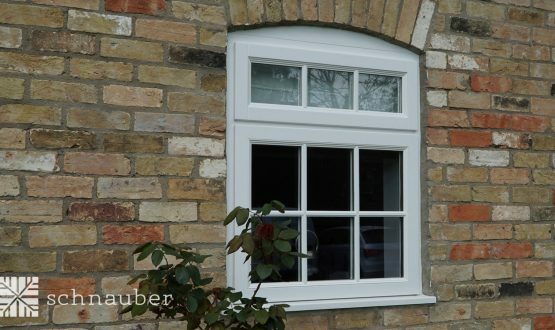 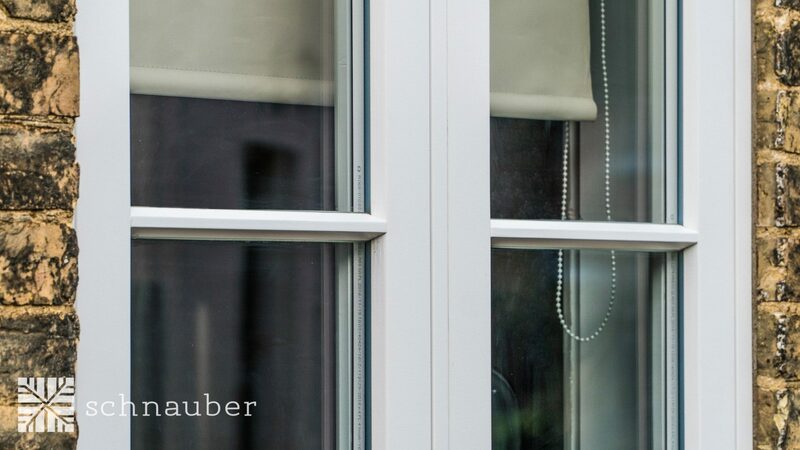 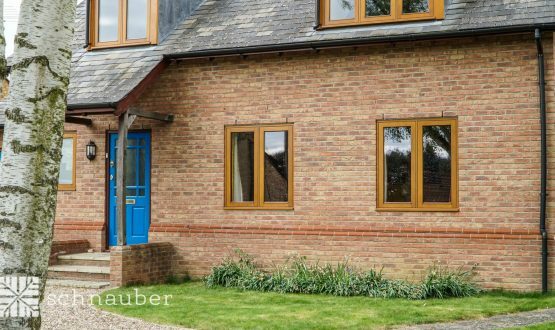 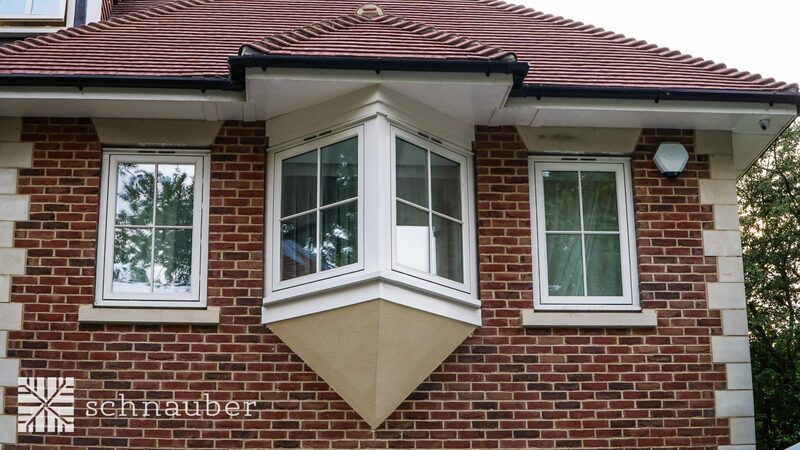 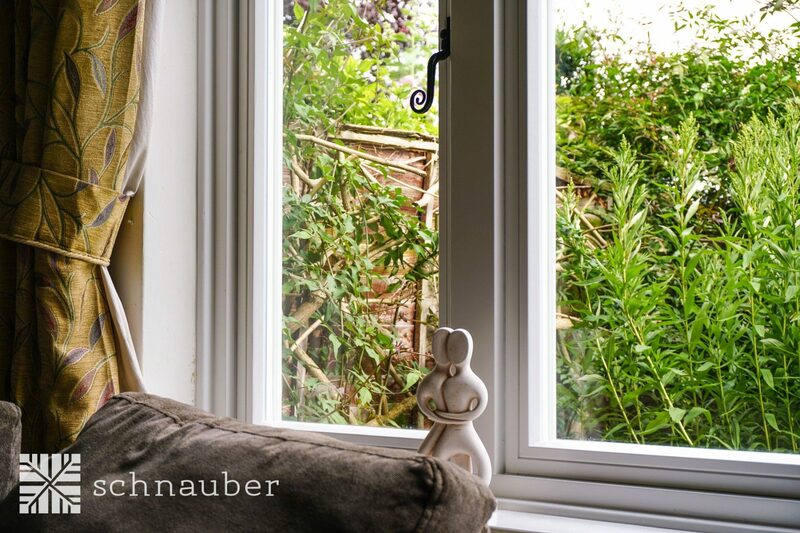 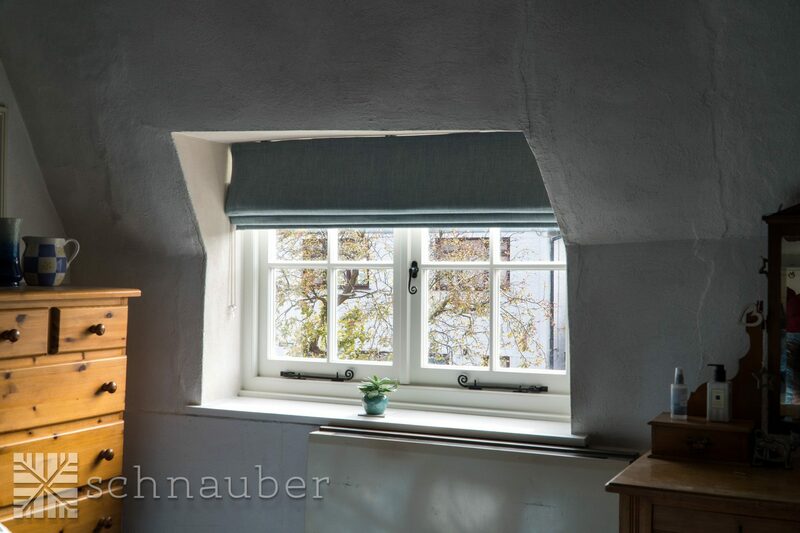 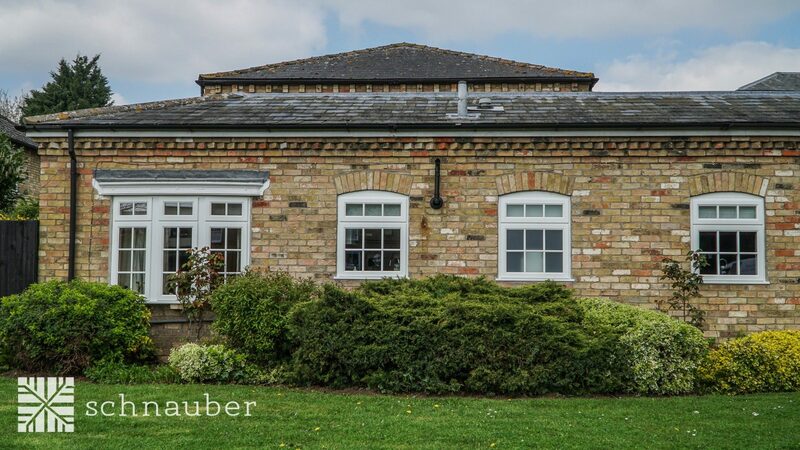 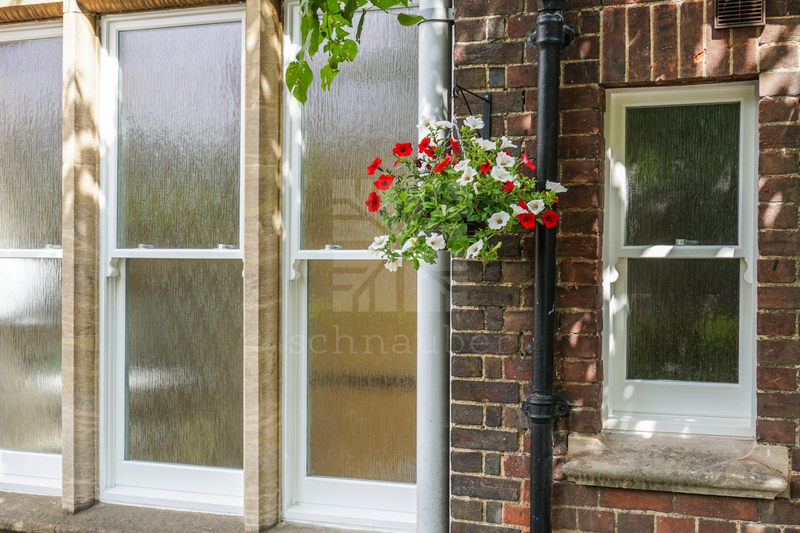 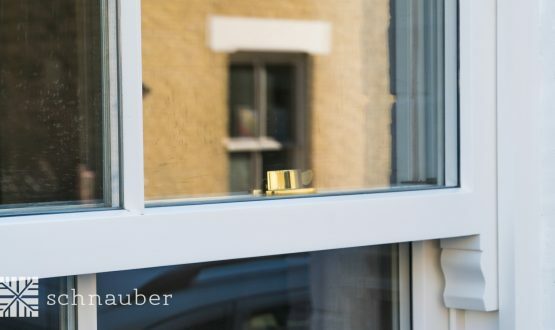 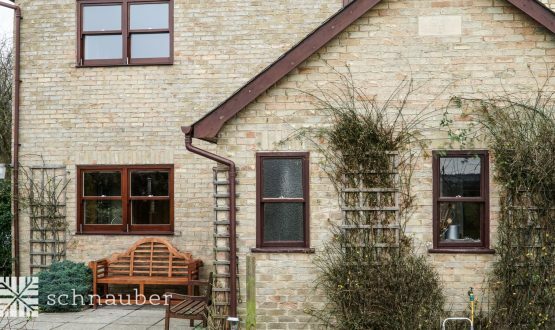 Over the years, we have perfected the art of using German craftsmanship to add a touch of elegance and luxury to our timber Passivhaus House windows. 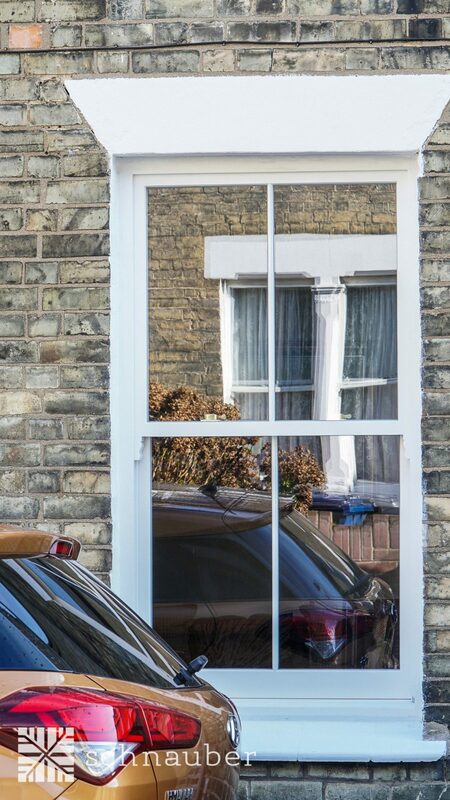 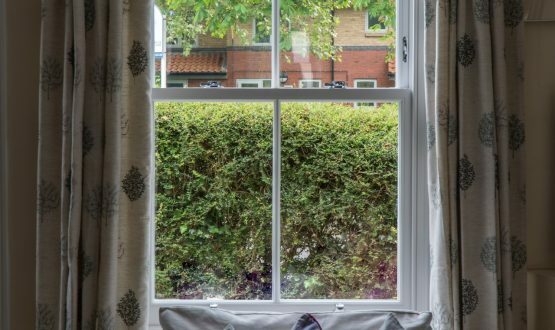 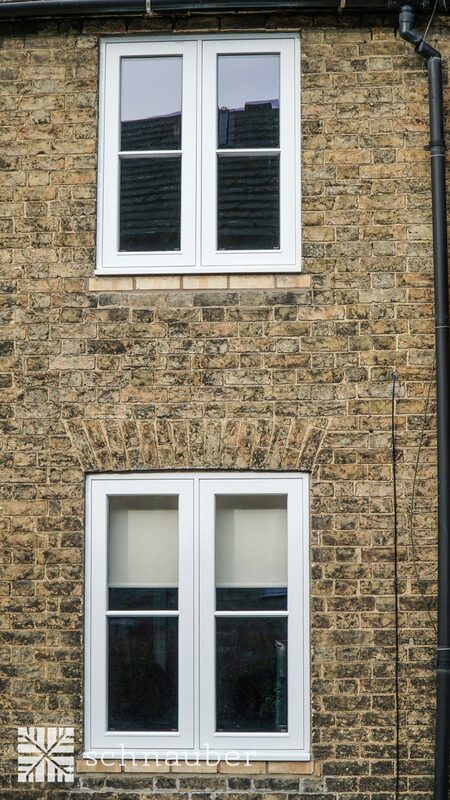 We use triple glazing with inside thermal insulated core as standard to produce exceptional thermal performance windows. 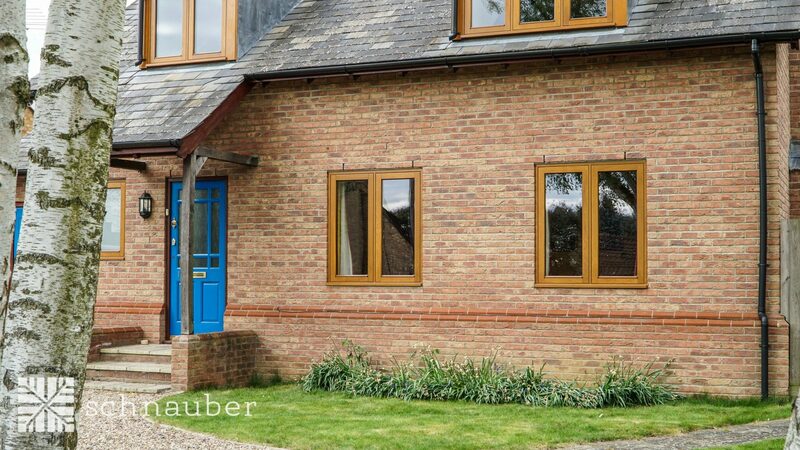 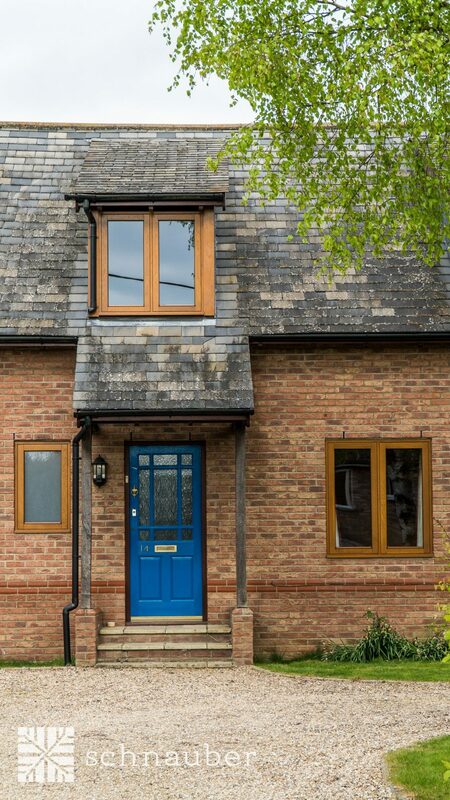 Regardless of your local climate in the UK, we are here to customise your timber Passivhaus House windows to suit your needs. 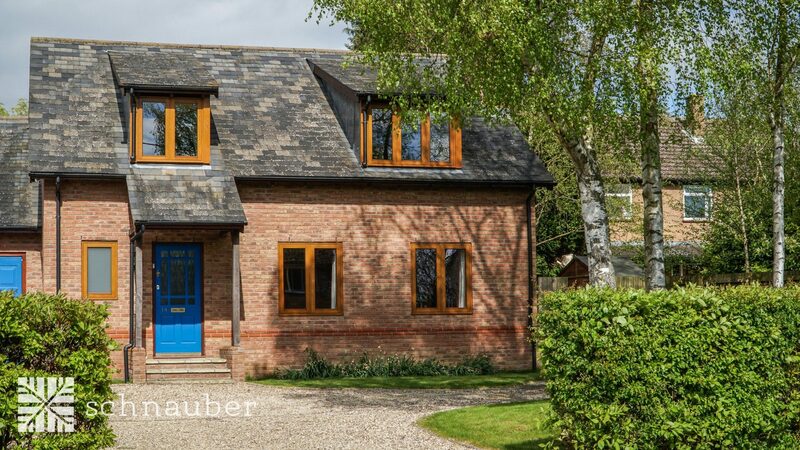 All Schnauber timber Passive House windows are designed to meet the rigorous Passivhaus House standards. 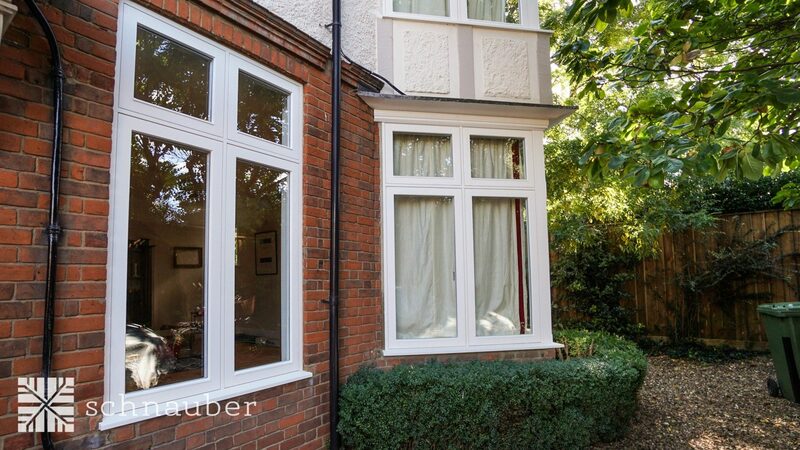 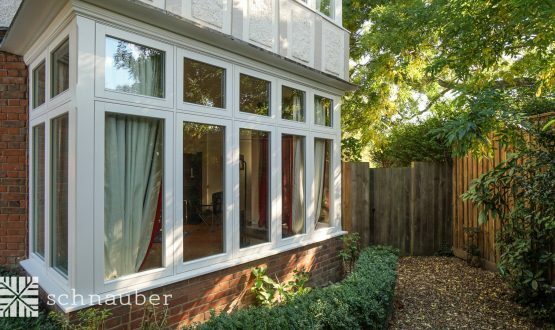 All Schnauber timber Passive House windows are designed to meet the rigorous Passive House standards. 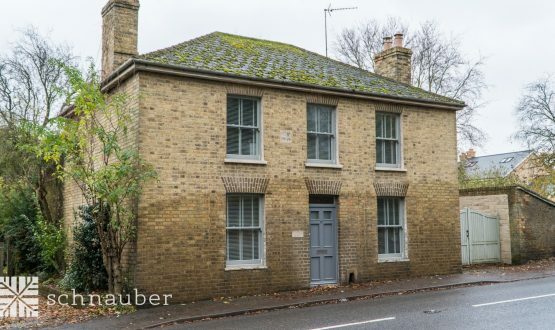 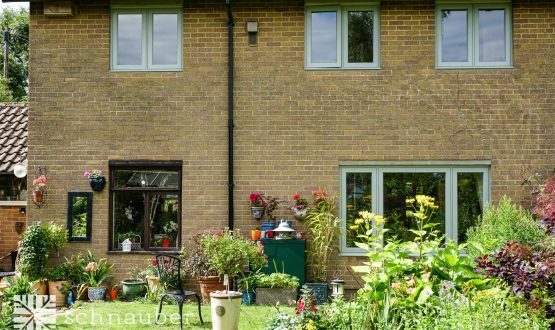 Passive House Timber windows What is a Passive House timber window? 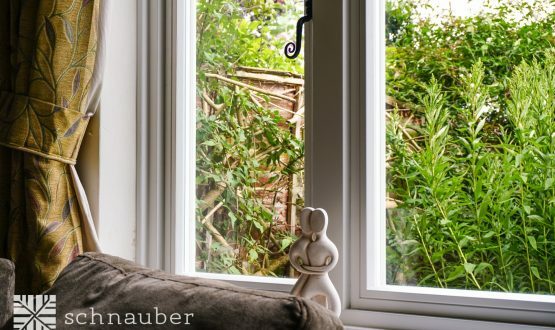 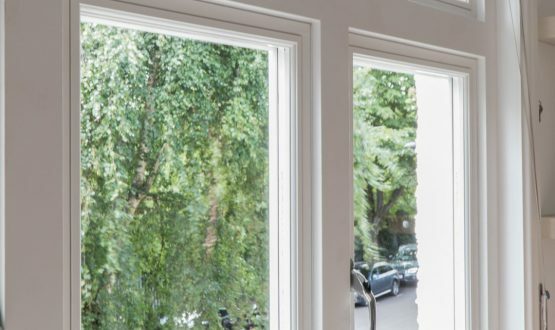 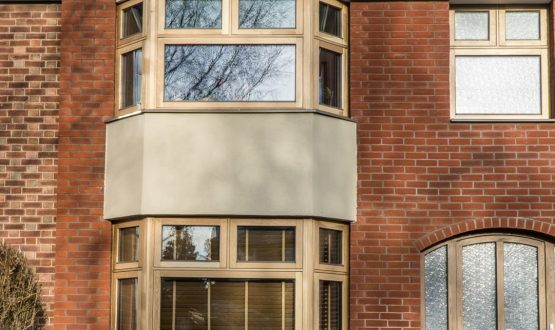 A Passive House timber window is a window that meets the rigorous German energy performance standard for the construction sector – Passivhaus Certification. 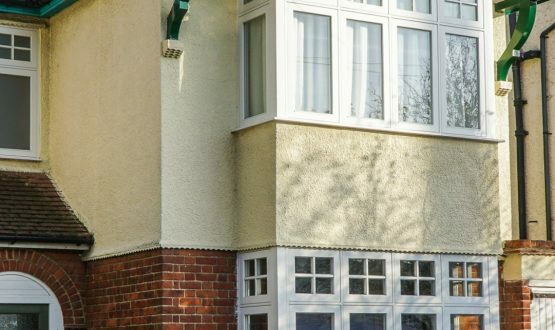 The voluntary standard assesses energy efficiency standards in buildings. 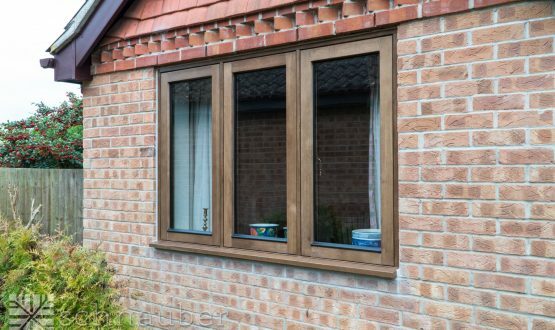 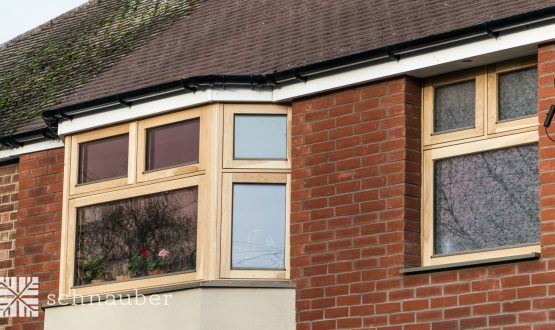 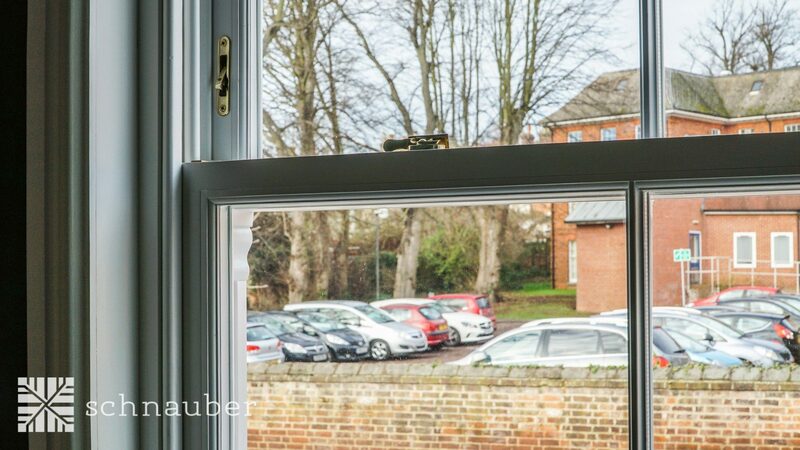 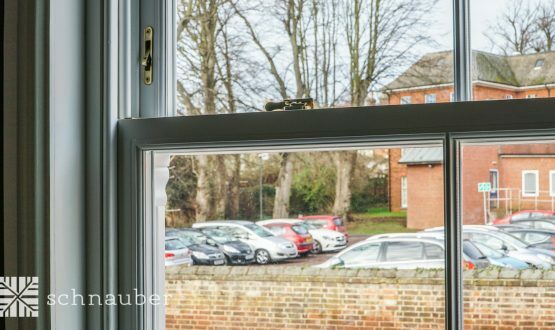 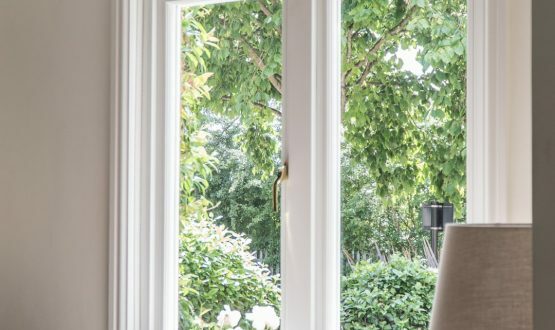 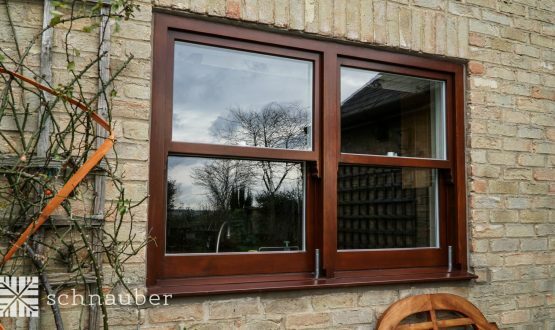 Schnauber’s Passive House Certified wood windows come with triple glazing as standard to provide increased thermal efficiency and air tightness. 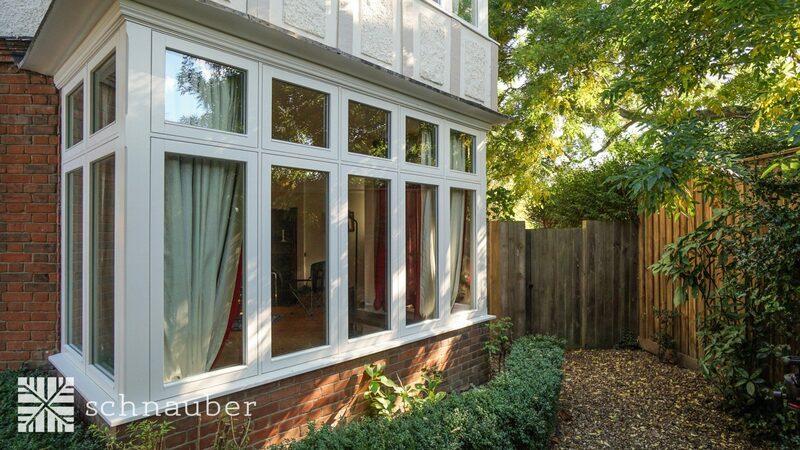 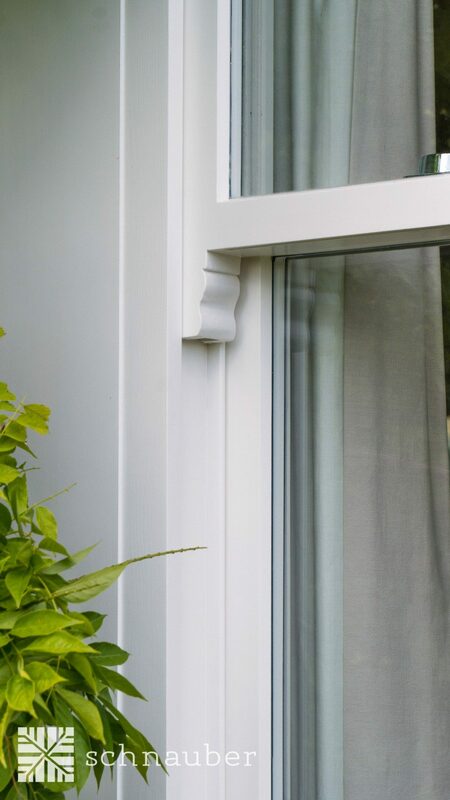 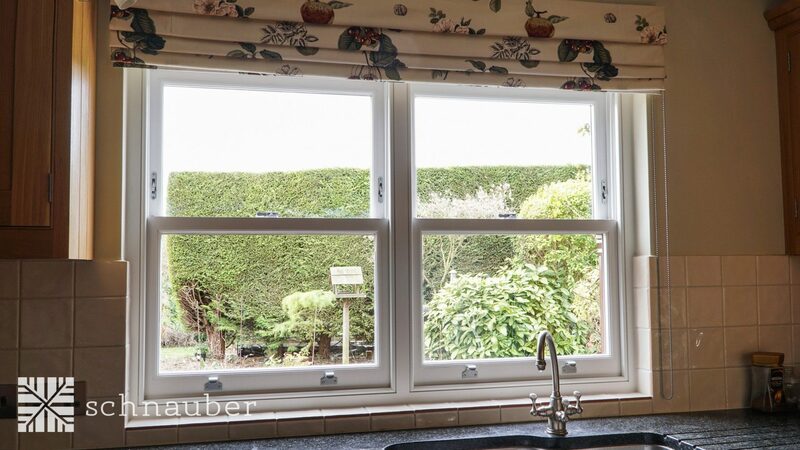 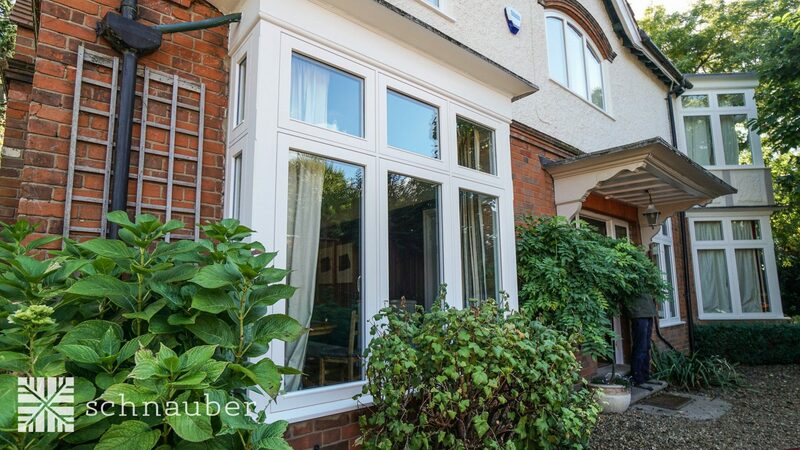 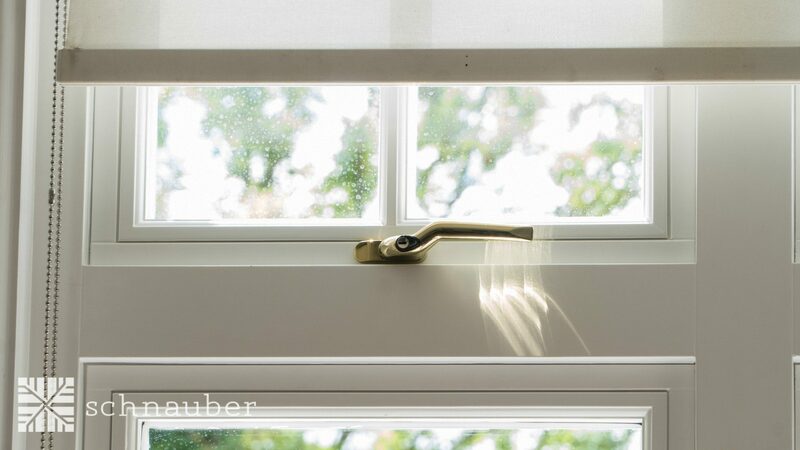 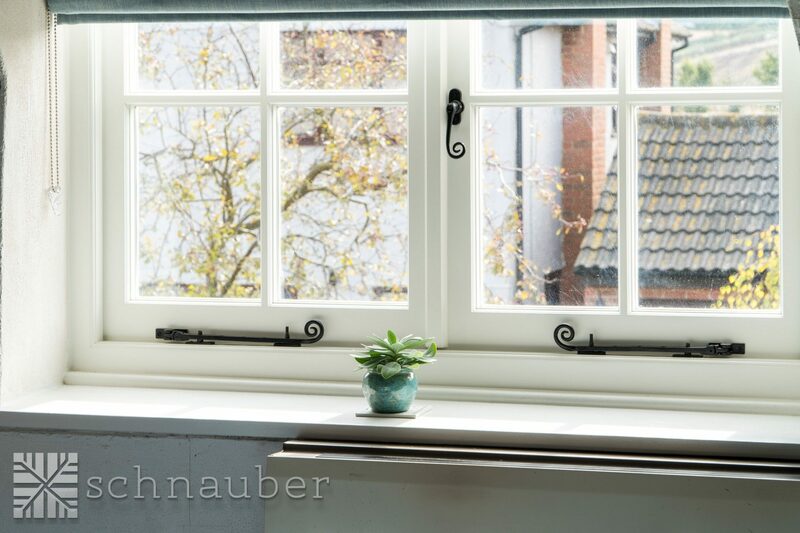 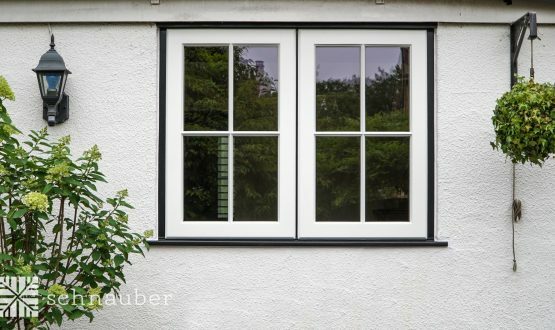 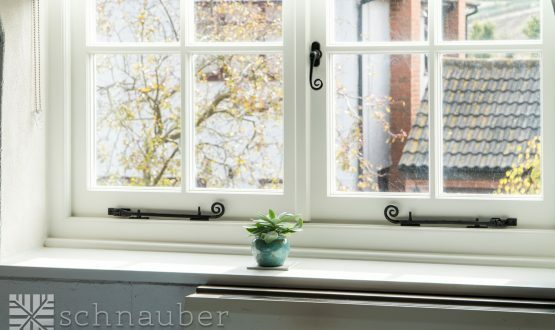 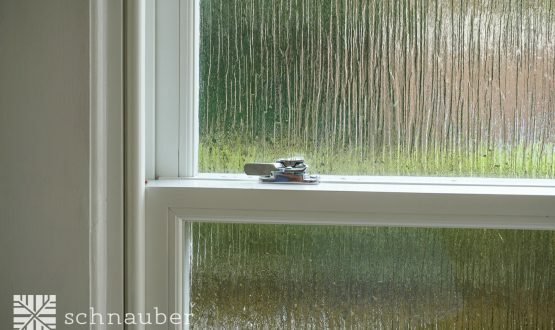 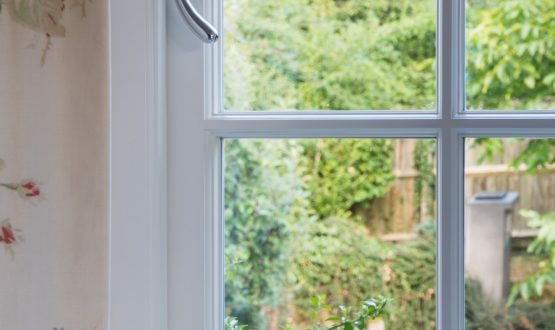 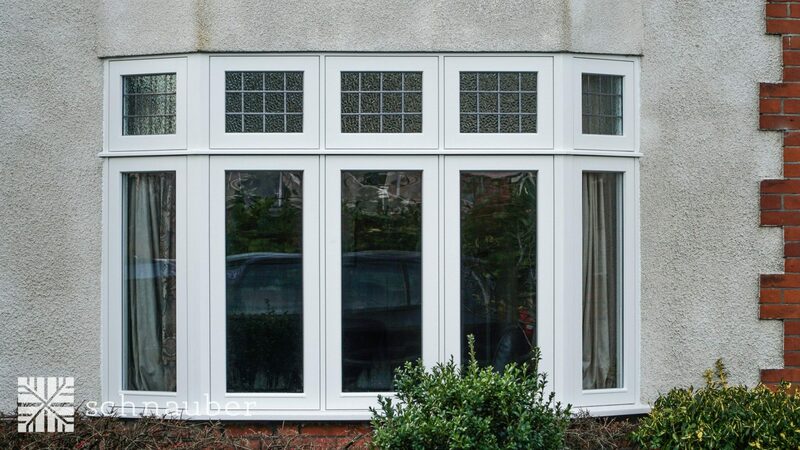 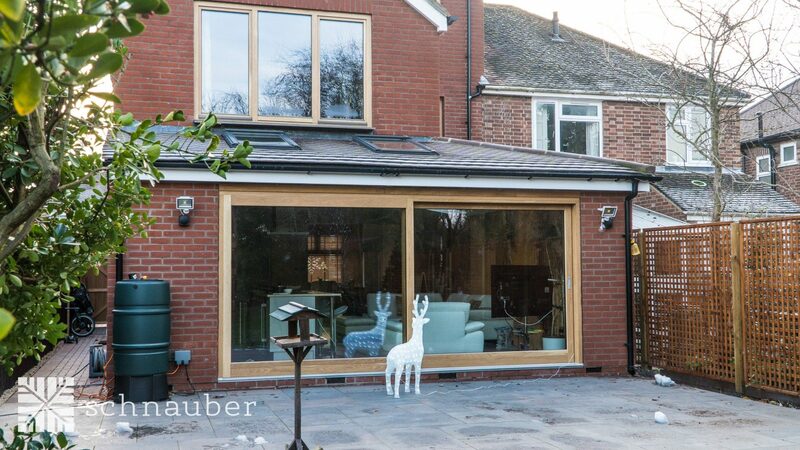 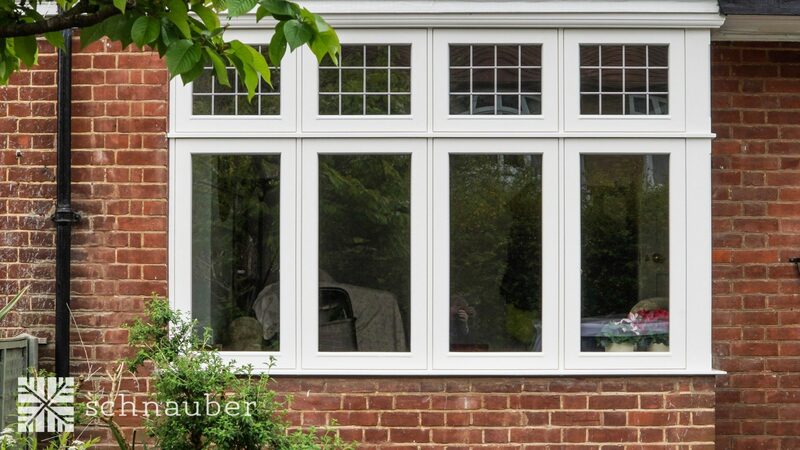 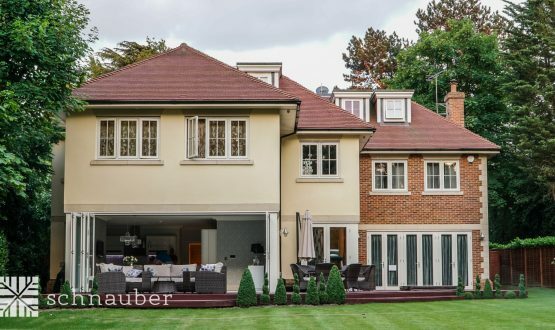 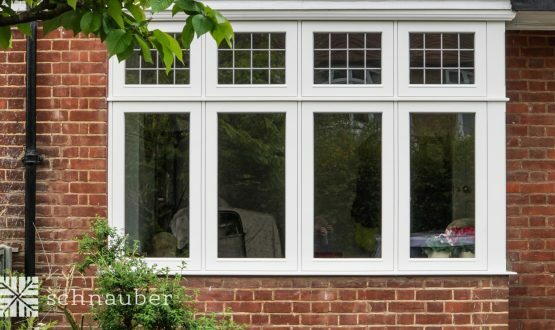 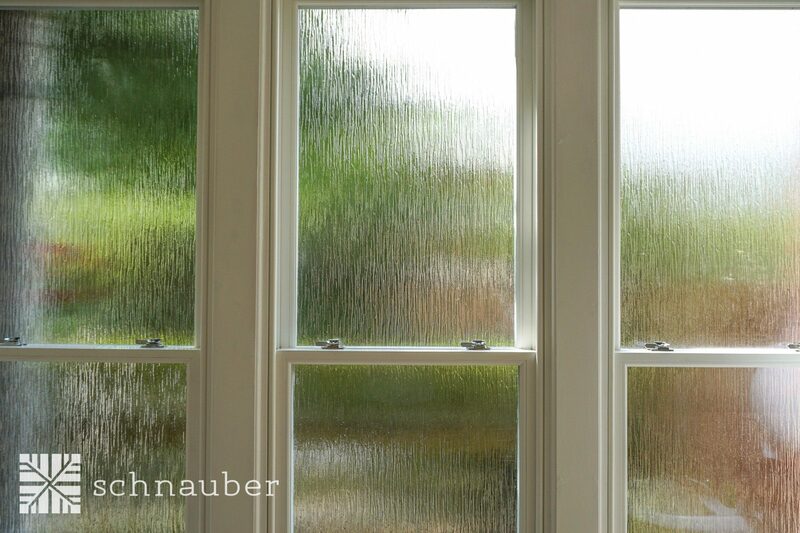 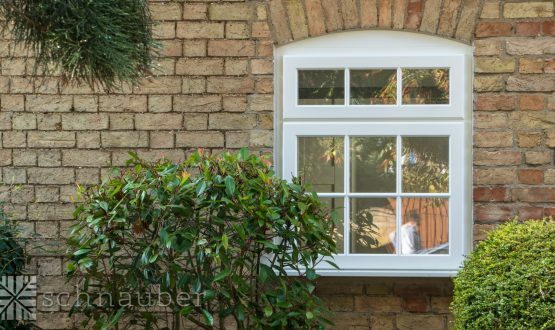 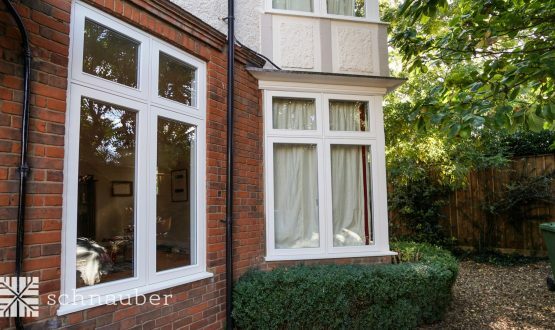 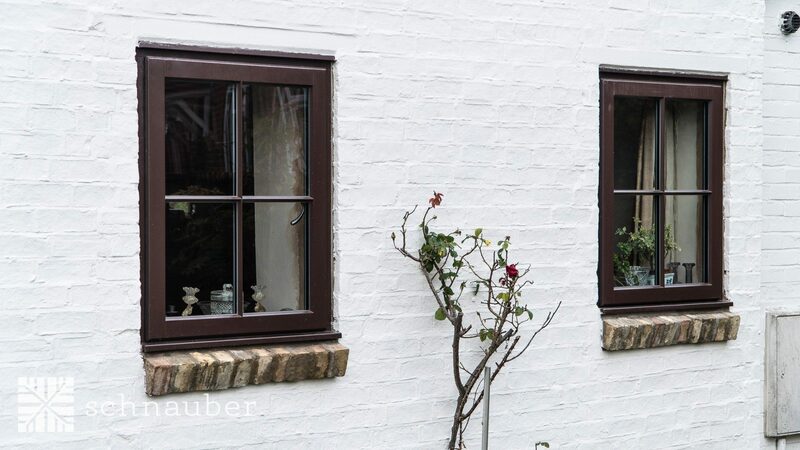 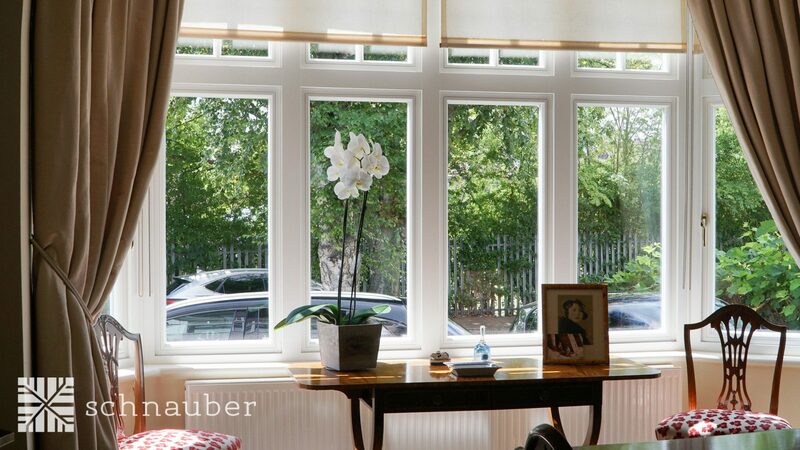 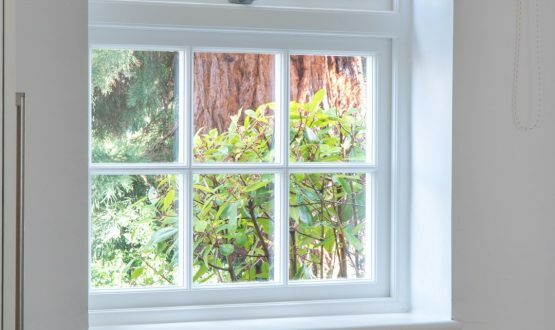 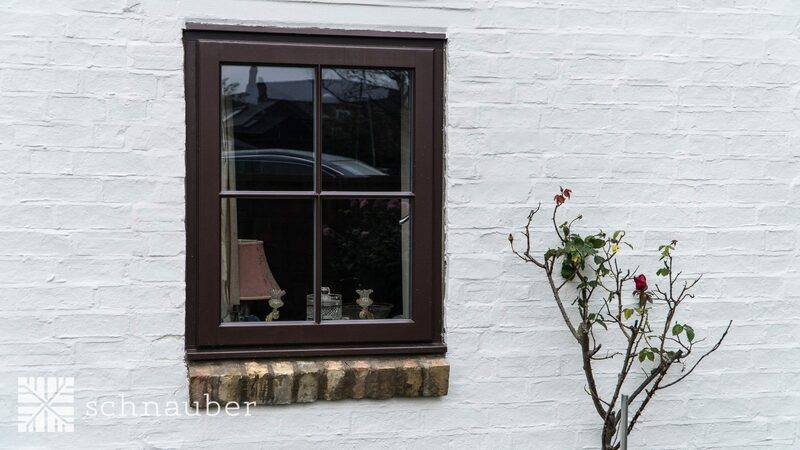 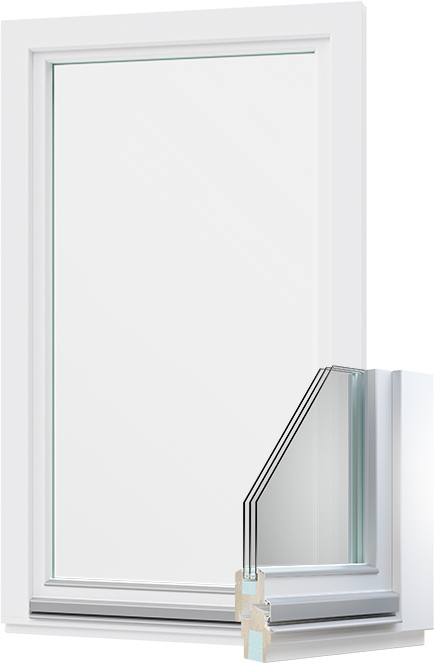 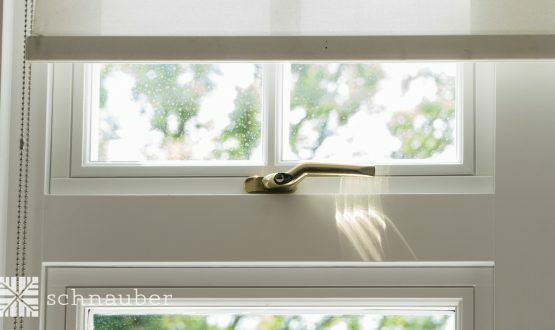 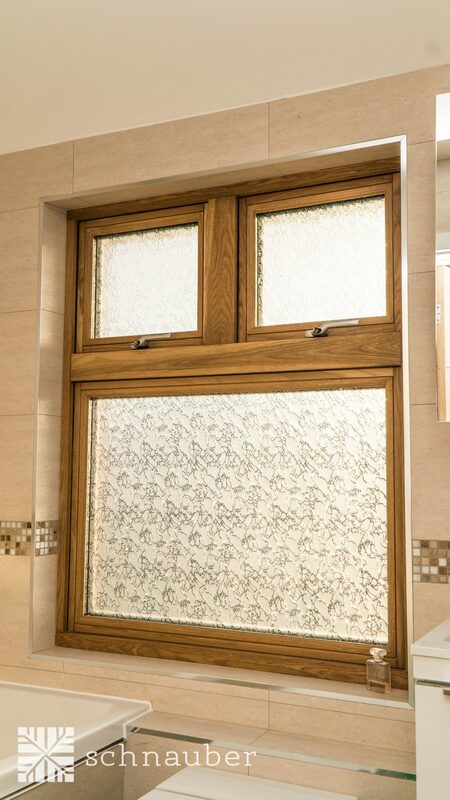 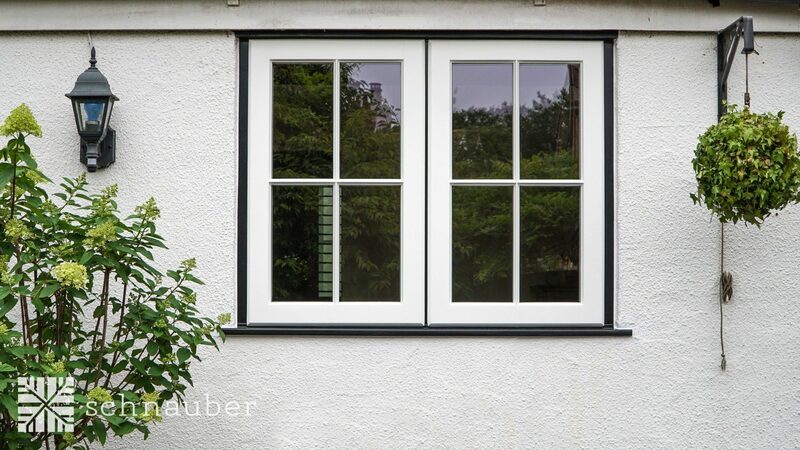 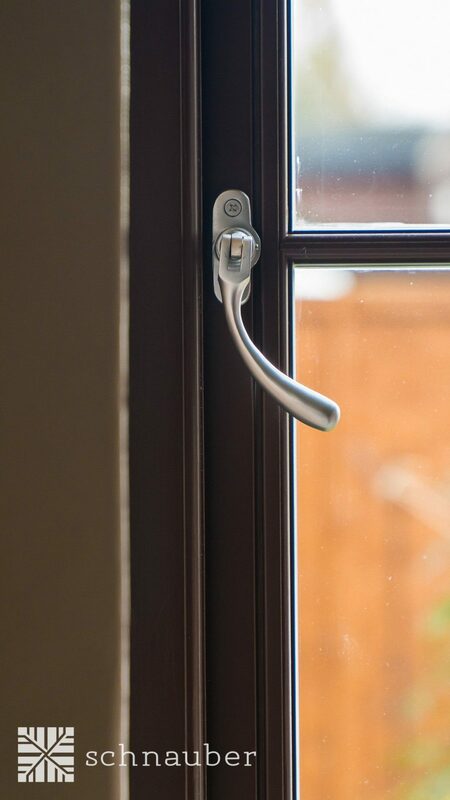 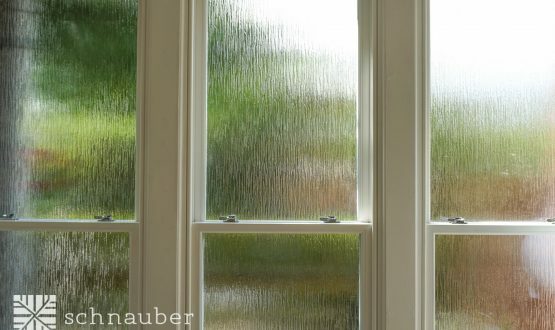 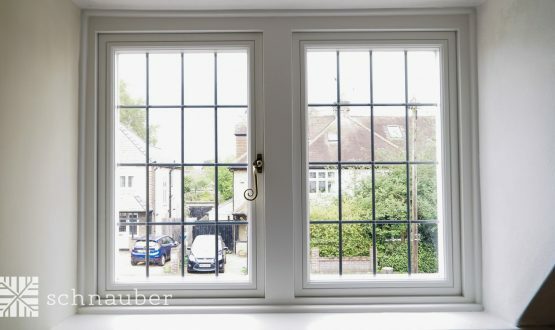 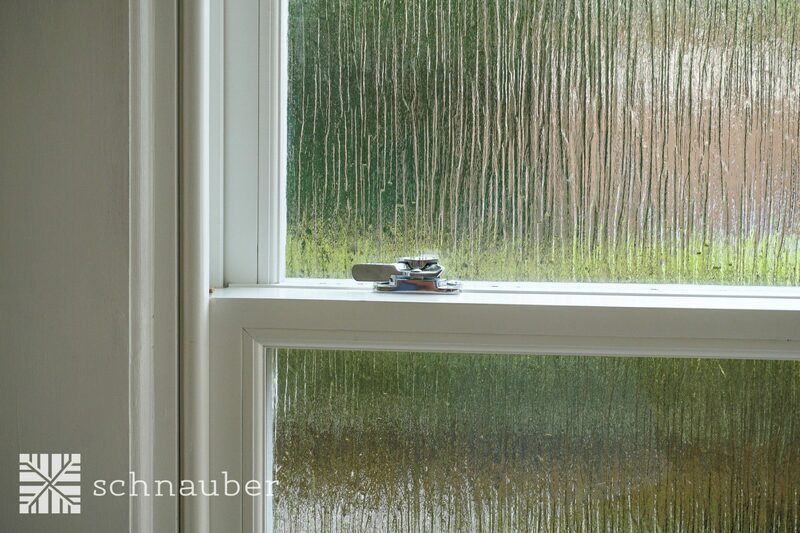 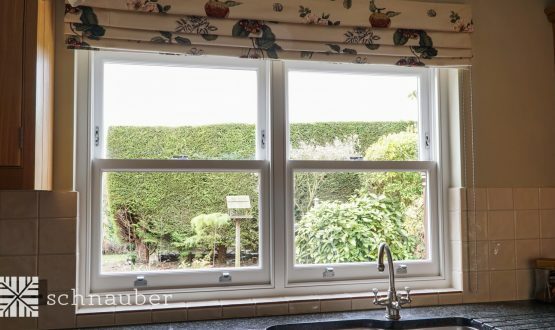 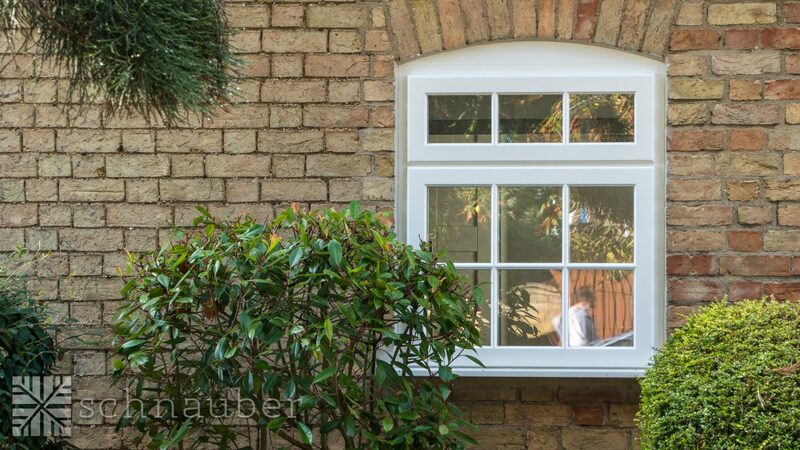 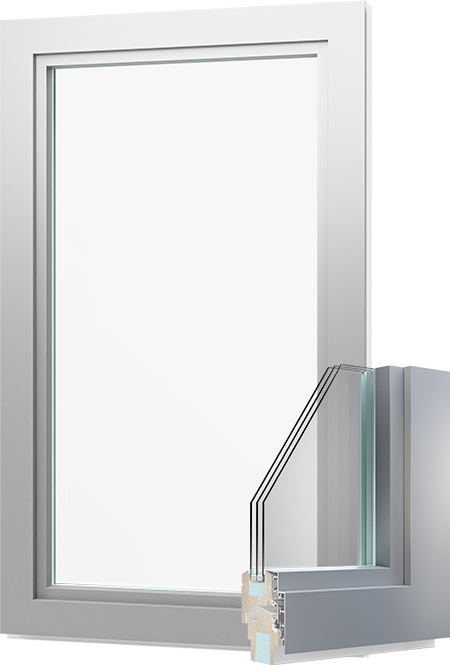 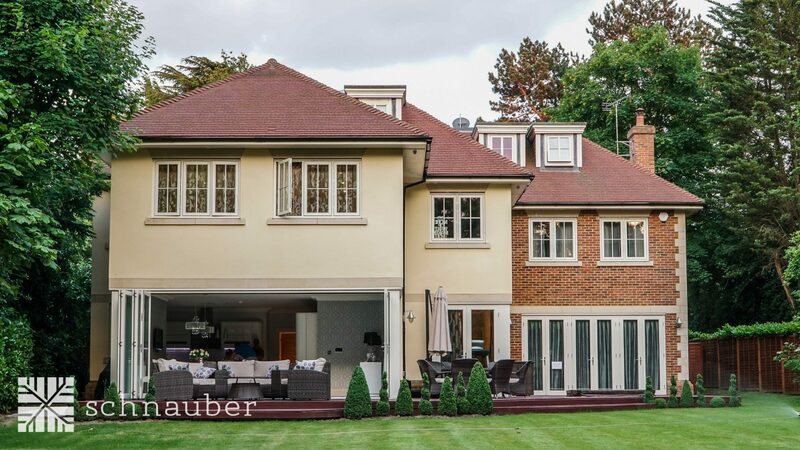 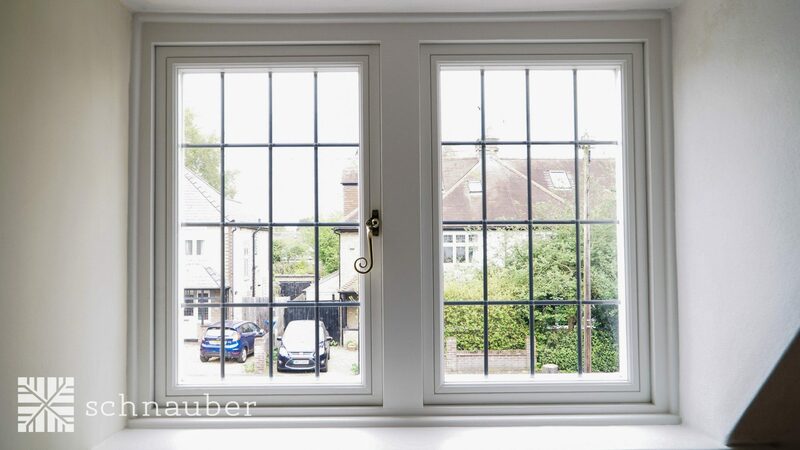 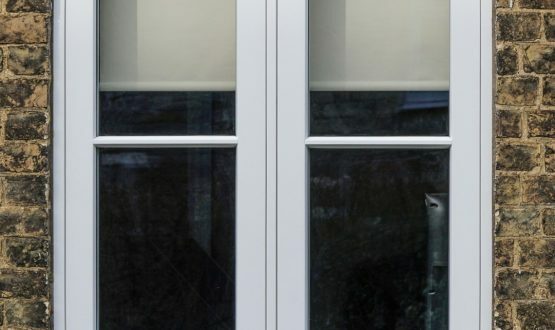 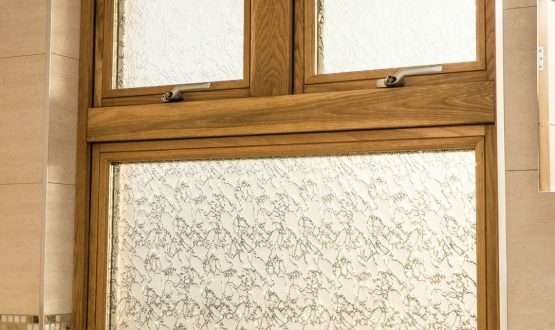 Schnauber use a highly advanced system of three distinct layers containing polyurethane and natural wood that results in U values ranging from 0.79 W/m2K to 0.66 W/m2K using triple glazing. 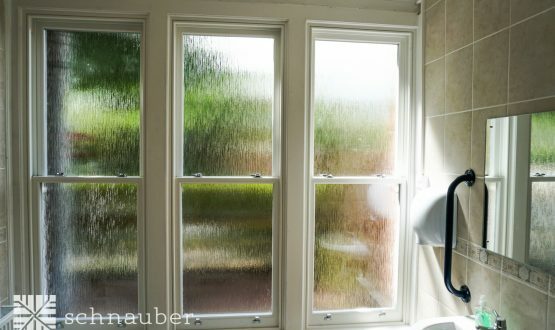 Where would I install a Passive House window? 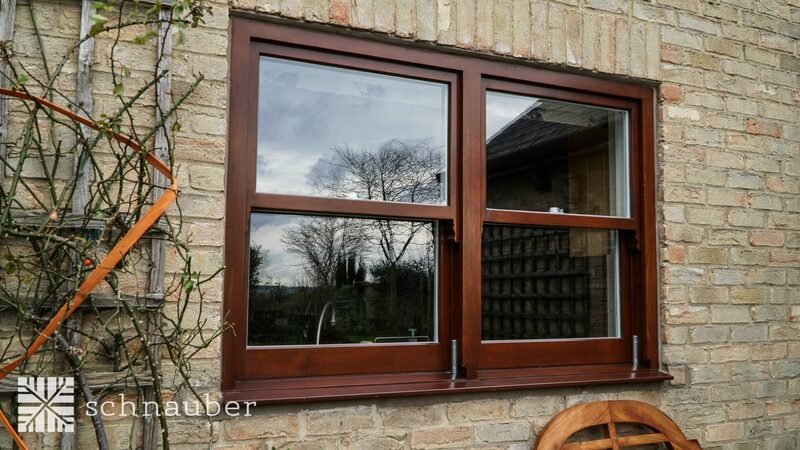 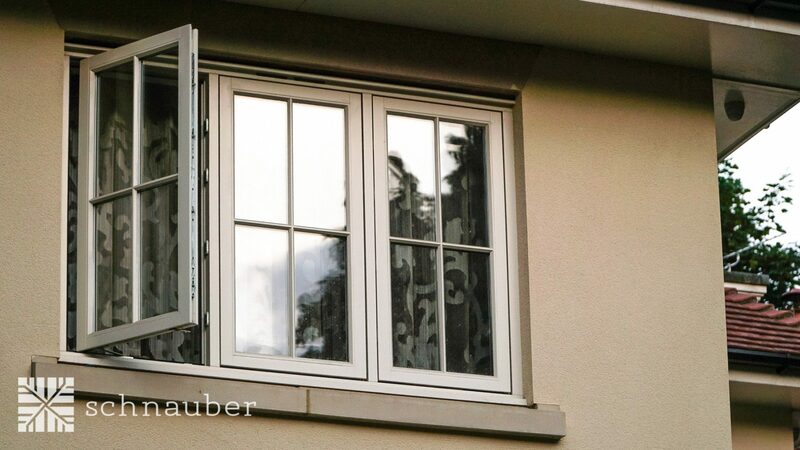 Schnauber’s Passive House windows are available in the tilt and turn style. 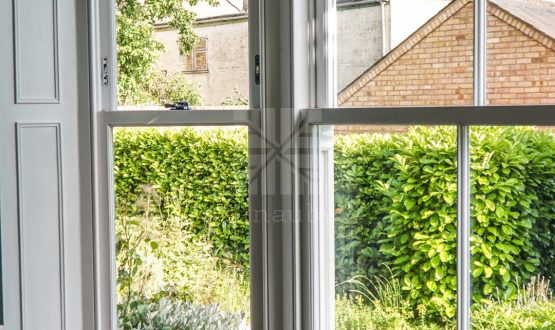 In certain high end residential developments and commercial/industrial projects Passive House certified windows maybe specified by the architect or developer. 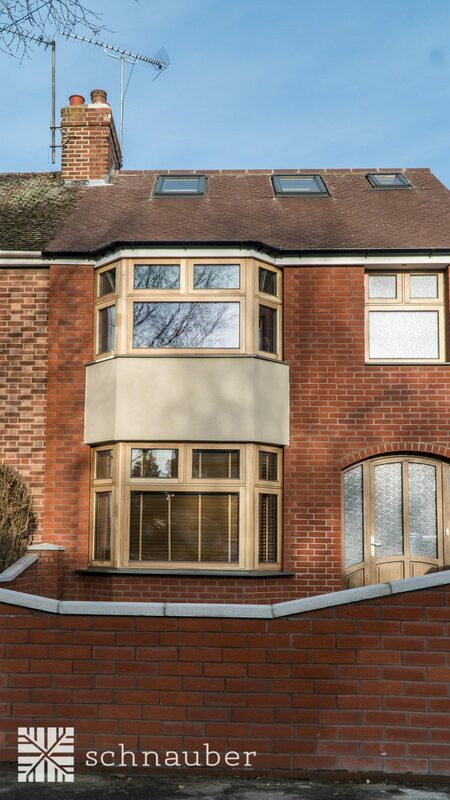 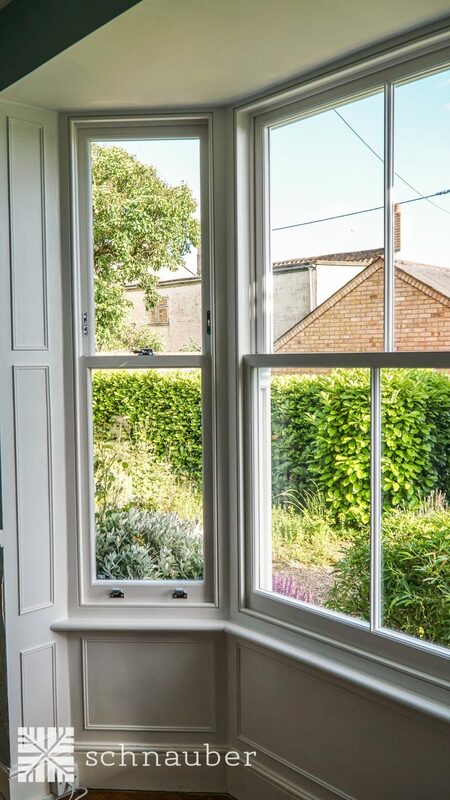 Passive House wooden windows can be installed in new build or refurbishment developments. 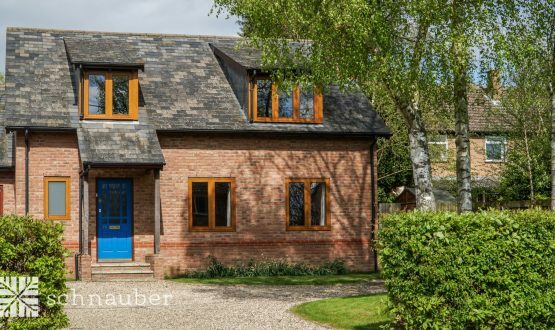 Why would I choose Passive House timber windows? 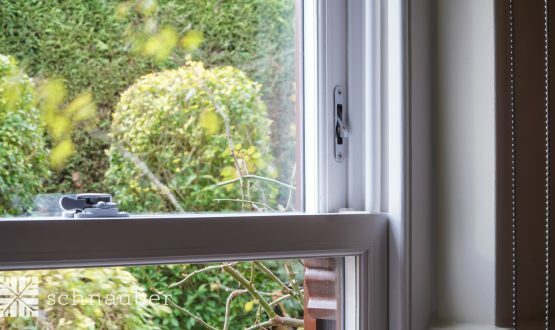 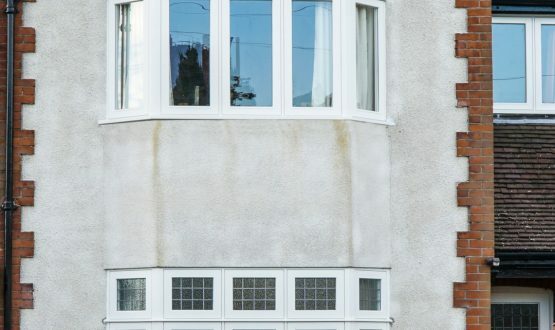 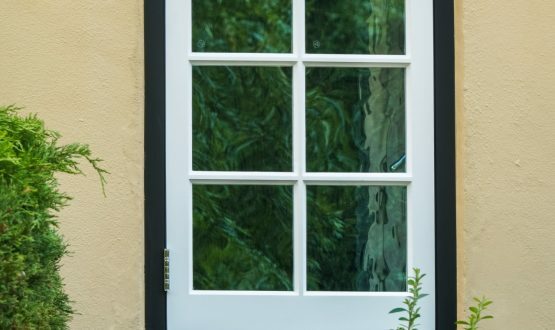 If you are looking for an environmentally friendly window to keep your carbon footprint to a minimum the Passive House window is the right choice for you. 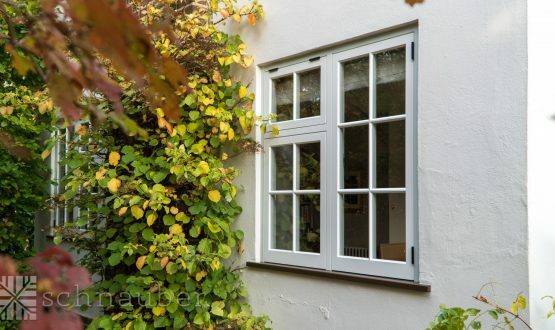 Choose this window type for the aesthetic quality of a timber framed window combined with the high performance of an internationally renowned standard - Passive House. 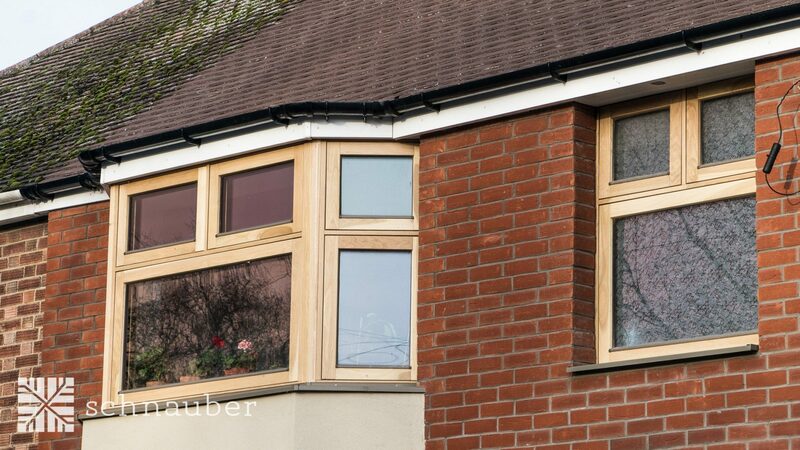 If you would like to increase the comfort level in your home and significantly reduce energy bills. 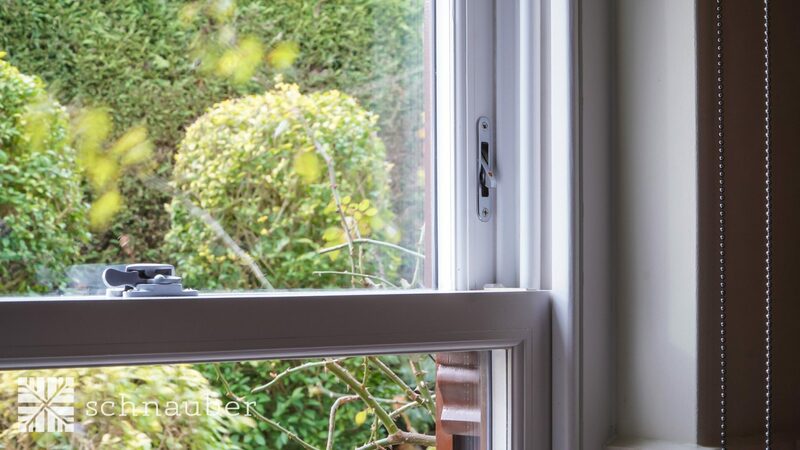 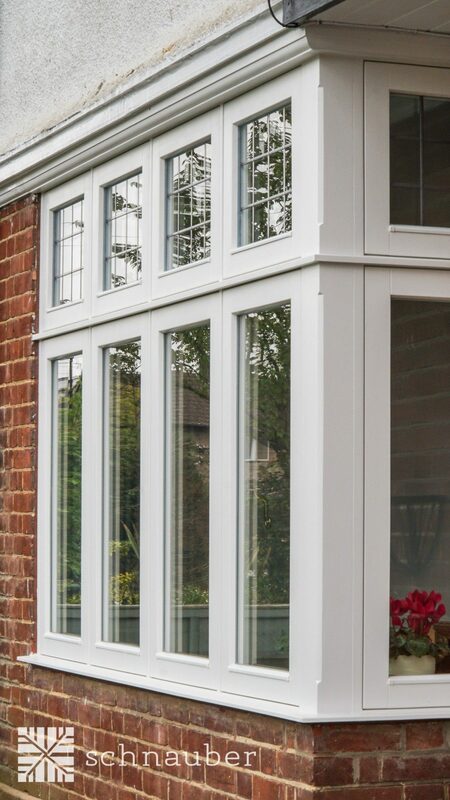 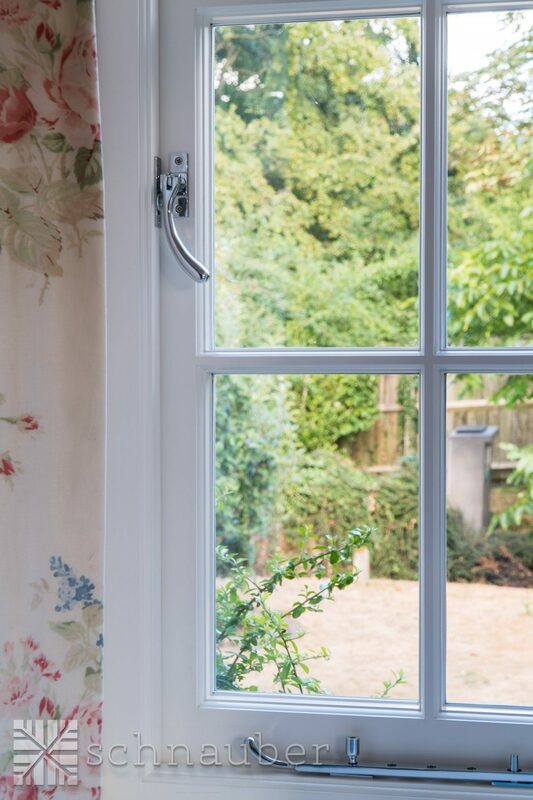 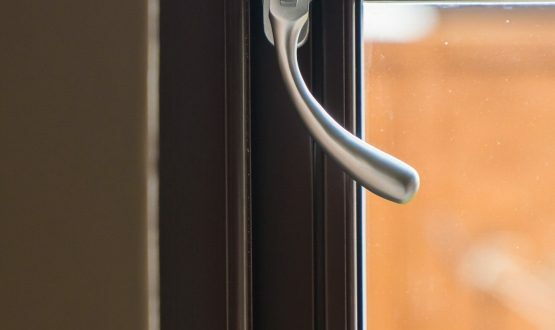 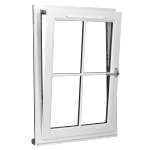 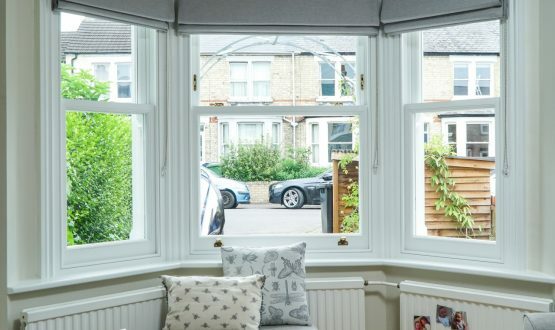 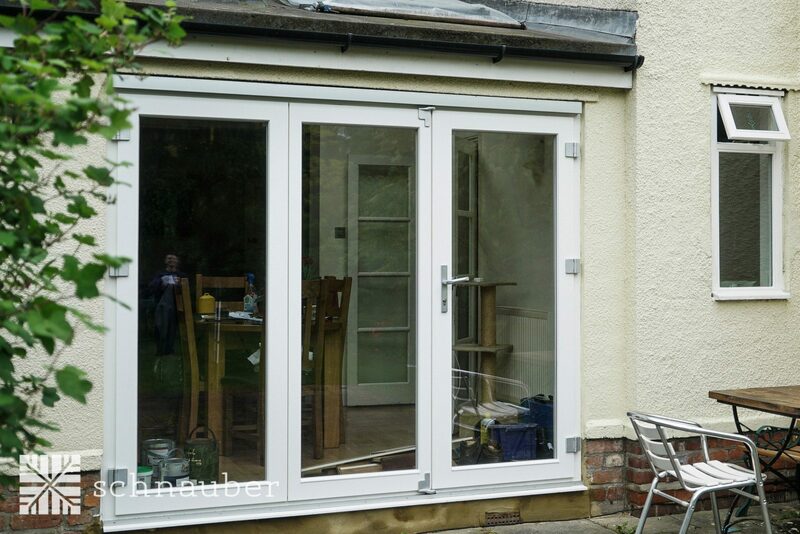 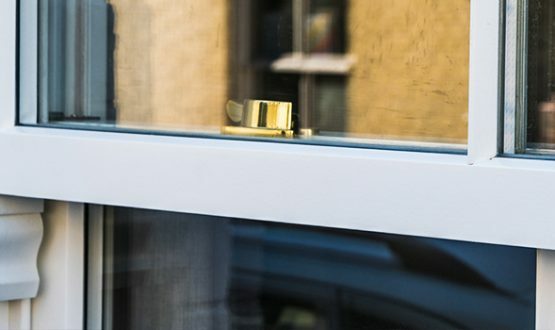 As a standard very low ‘U’ value of 0.77 W/m2K is achieved because they are supplied with high performance triple glazing filled with an insulating inert gas, have insulated frames and minimise thermal bridging. 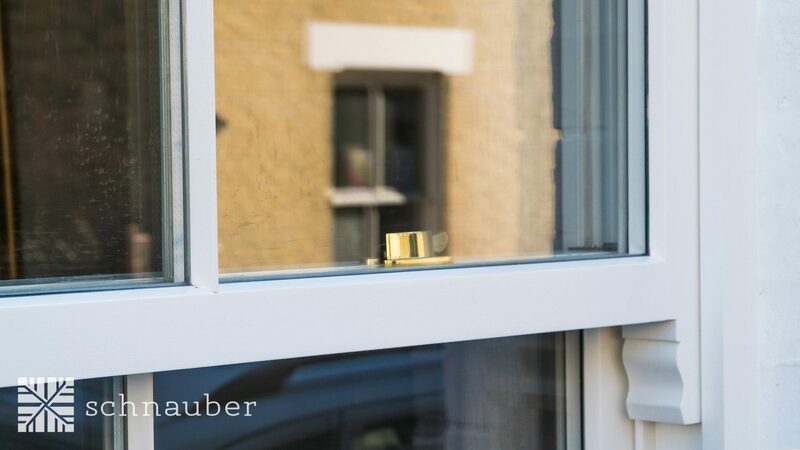 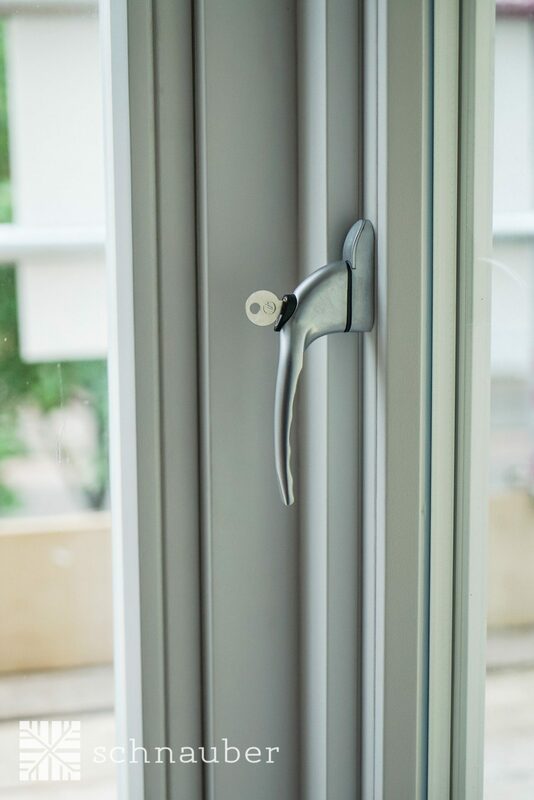 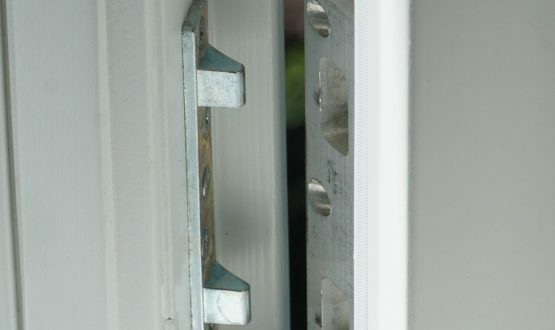 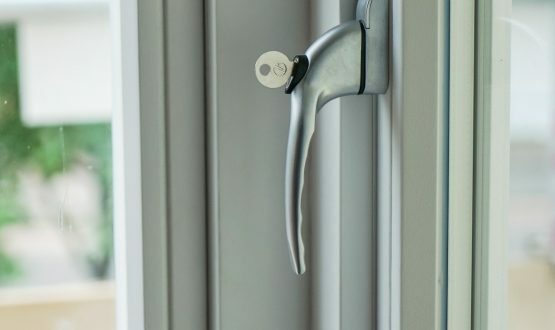 All Schnauber Passive House windows are supplied with innovative locking mechanisms to ensure that your property stays safe and secure. 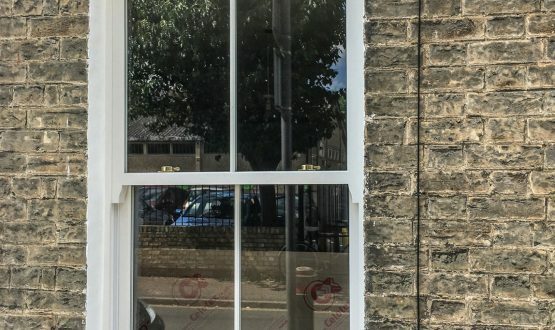 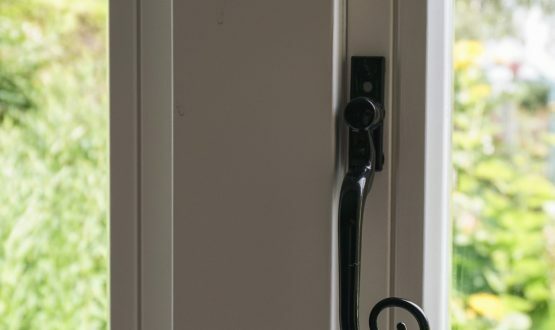 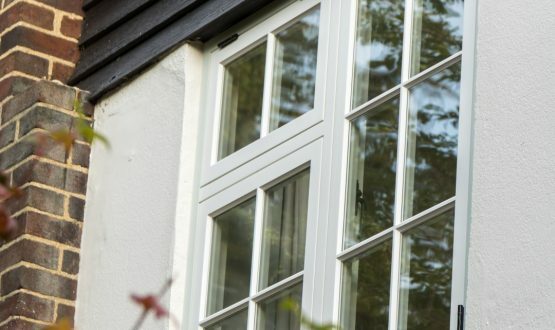 What options are available for my wooden Passive House windows? 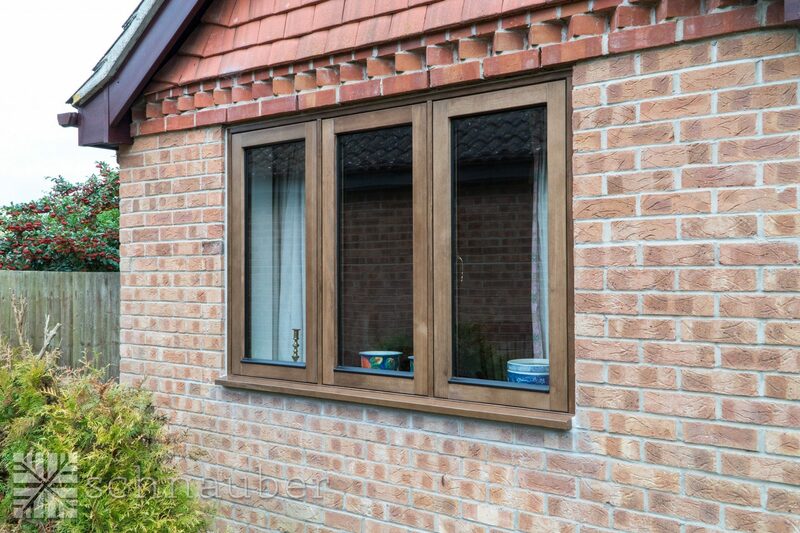 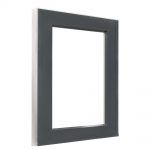 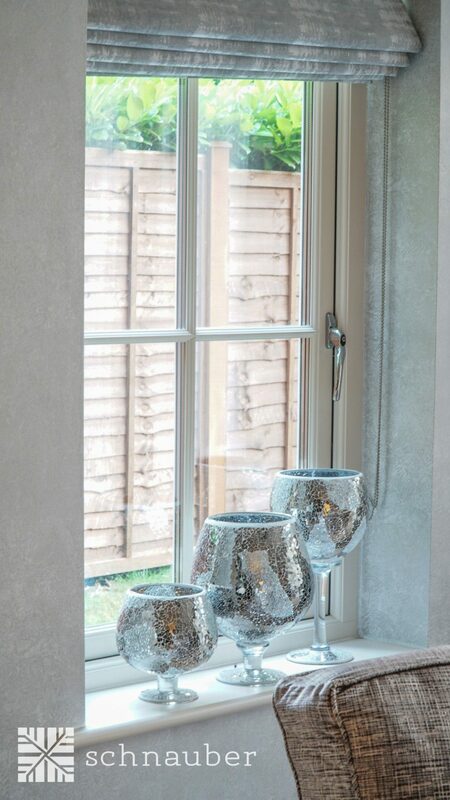 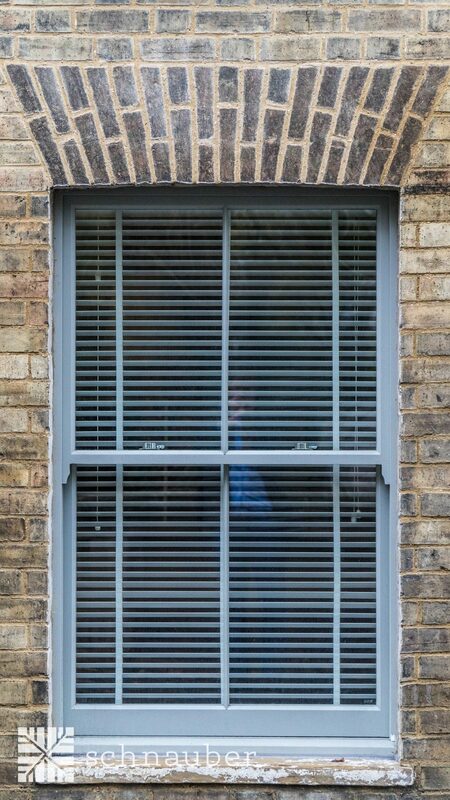 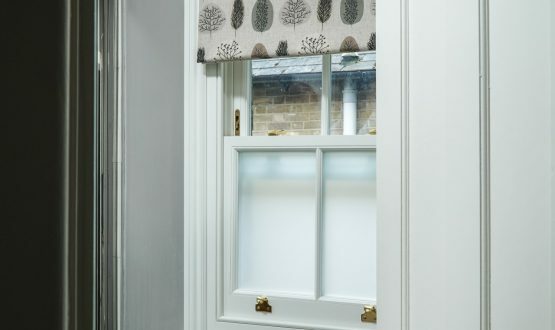 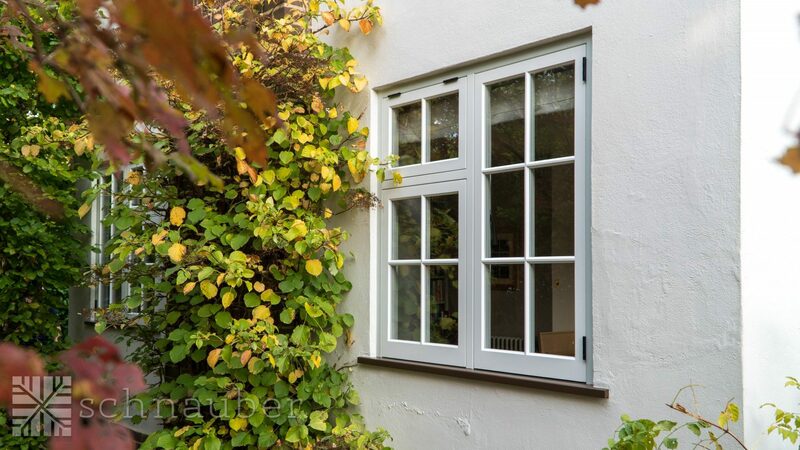 Available in a choice of hardwood, softwood or CLT and LVT finishes or as an aluminium clad window. 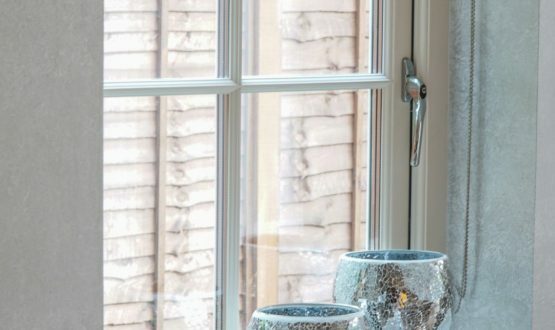 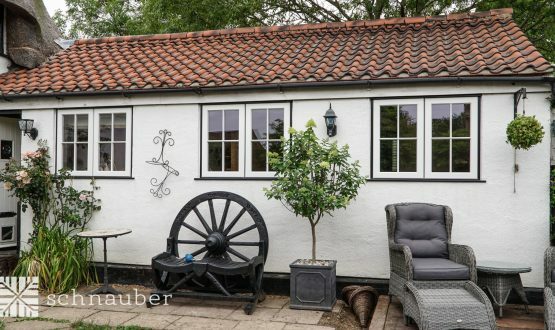 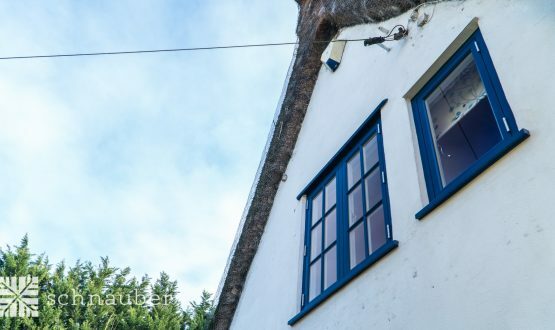 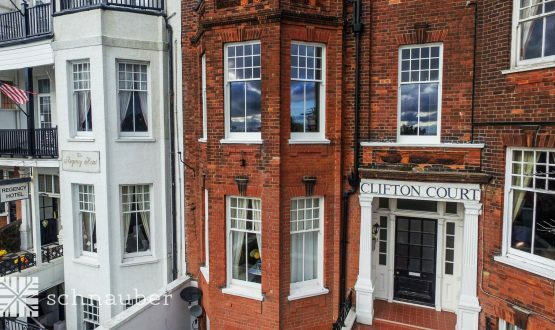 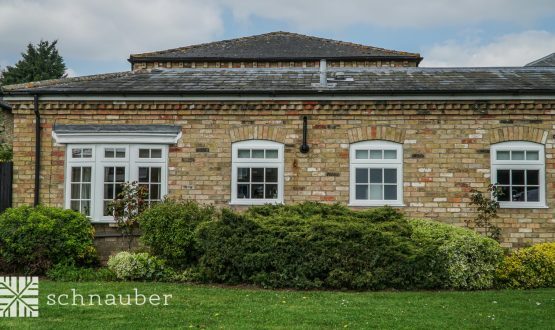 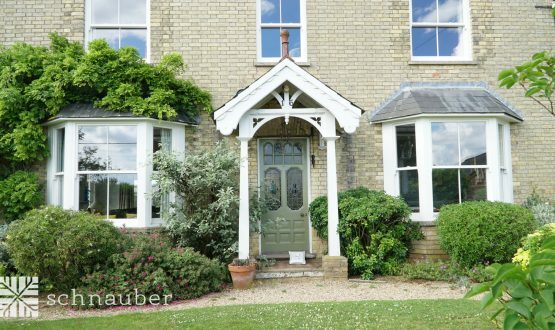 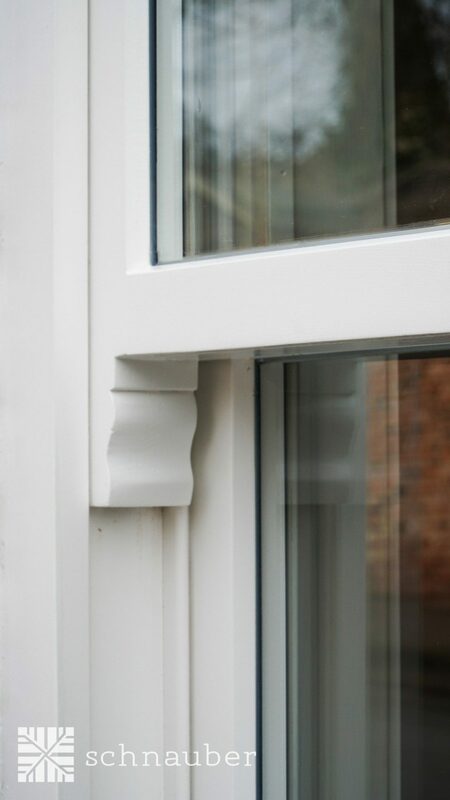 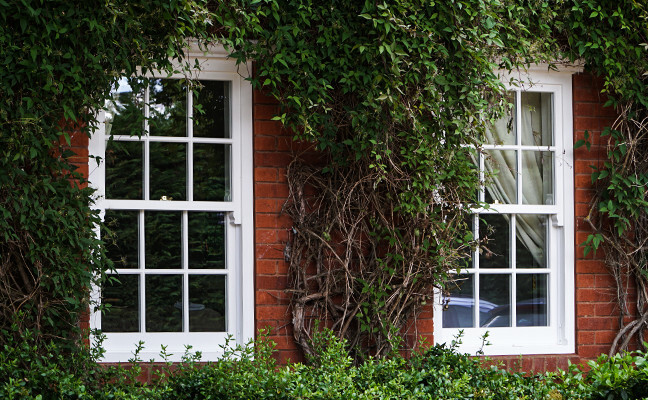 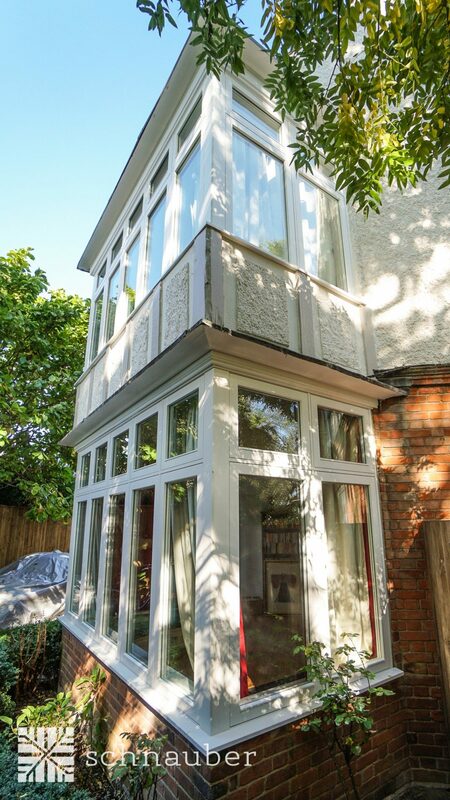 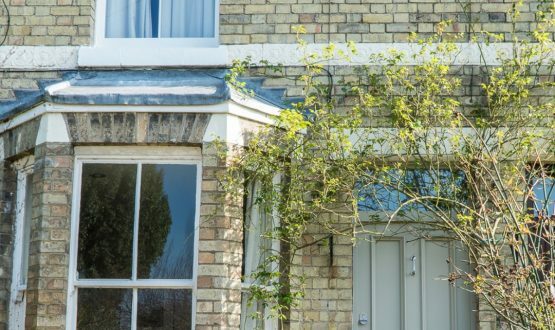 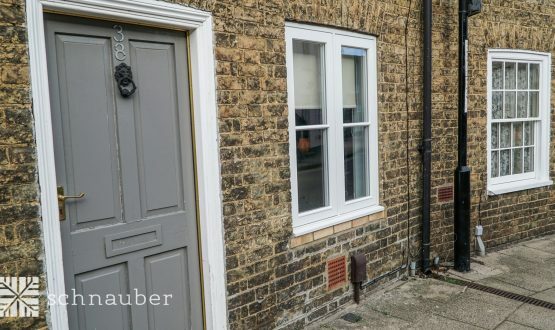 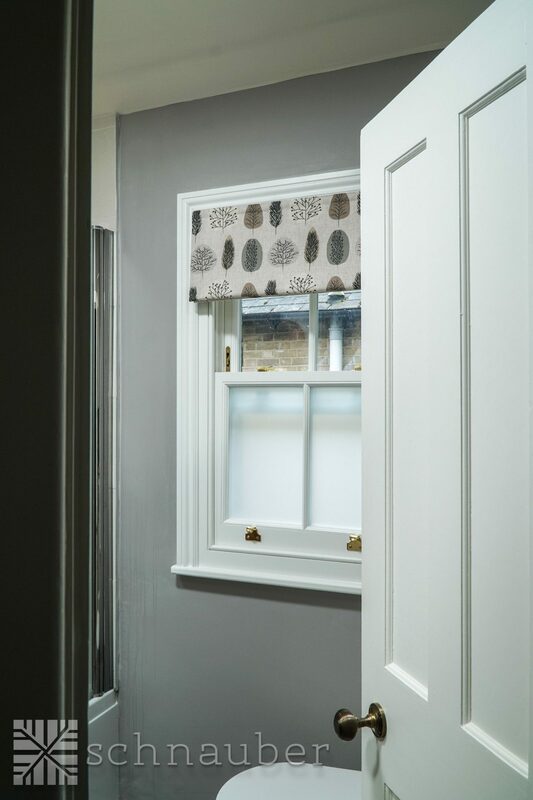 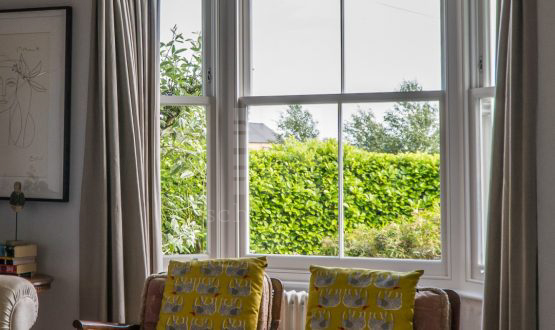 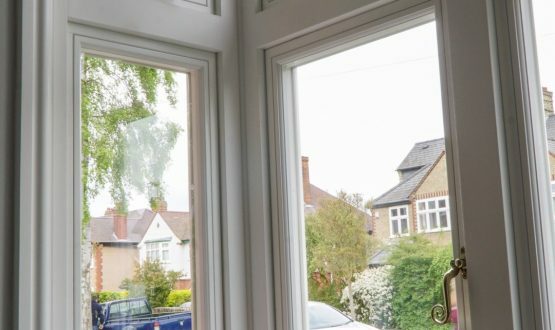 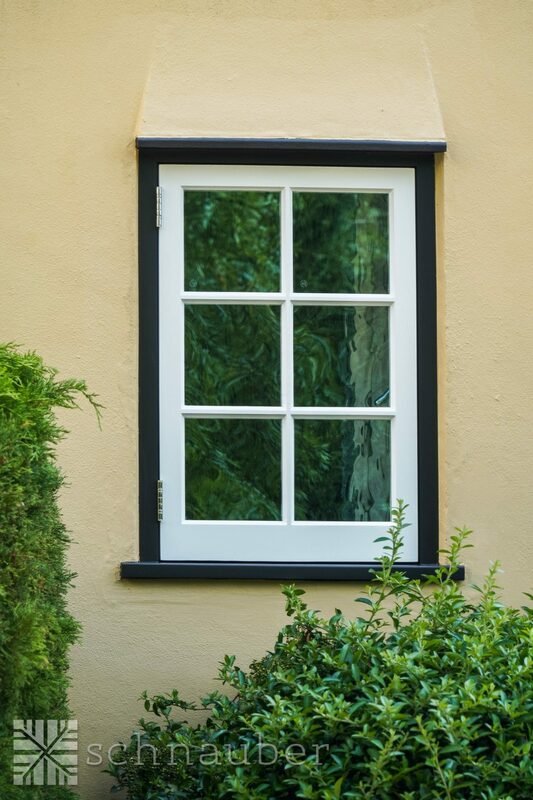 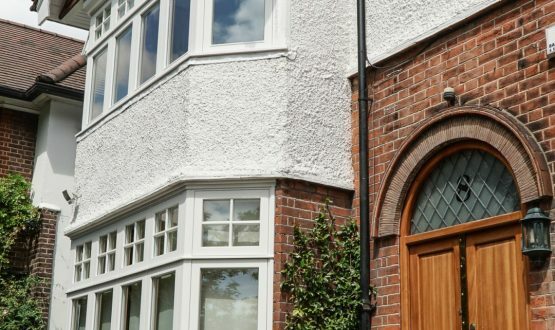 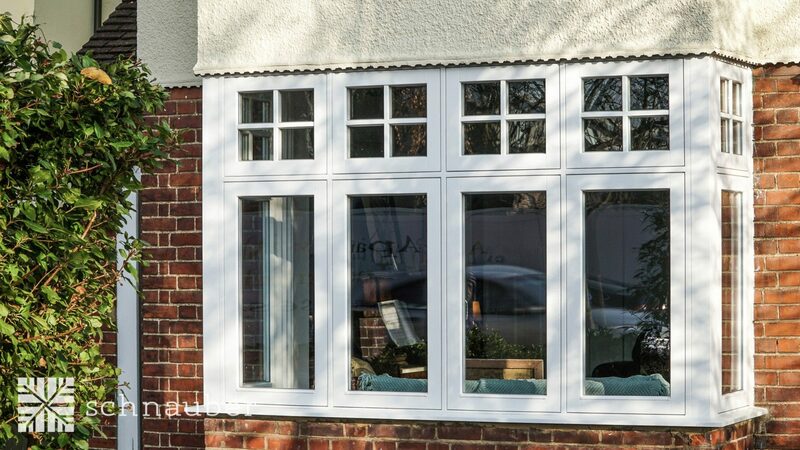 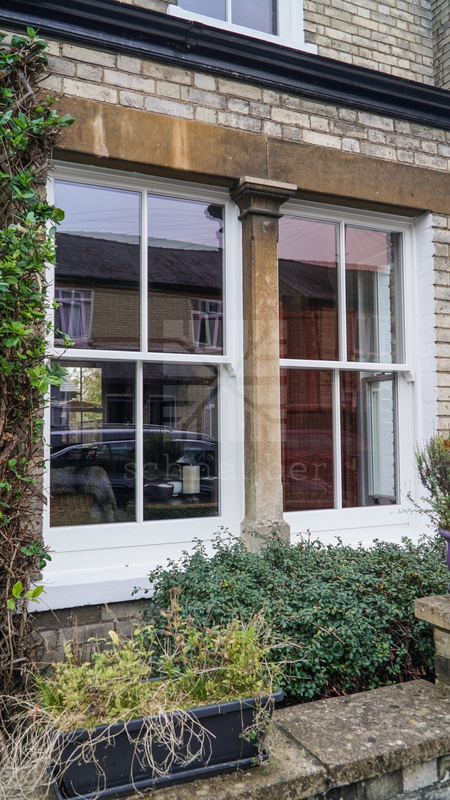 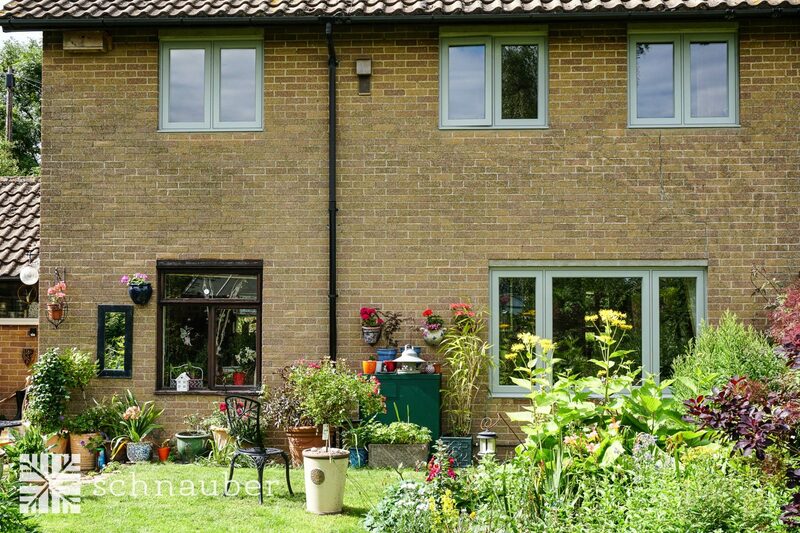 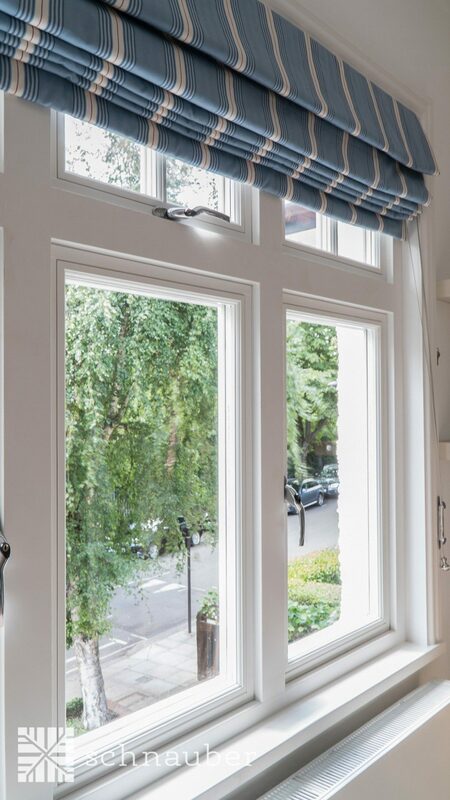 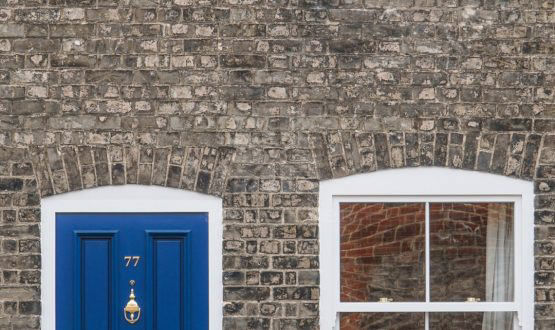 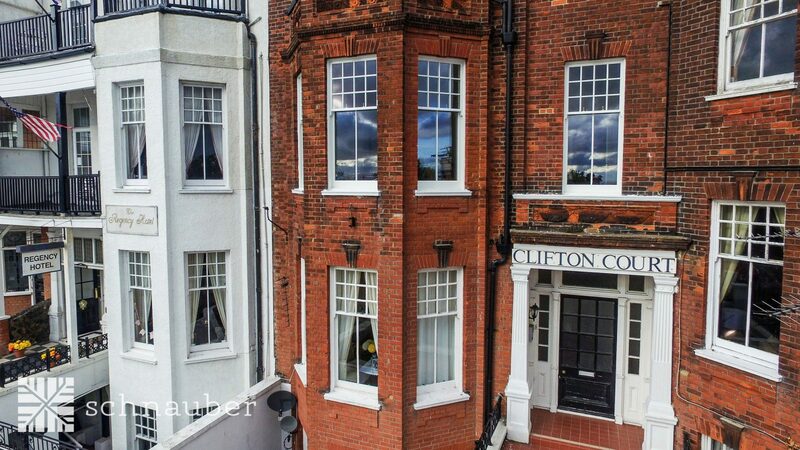 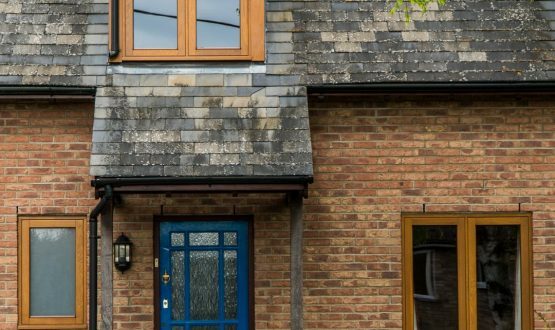 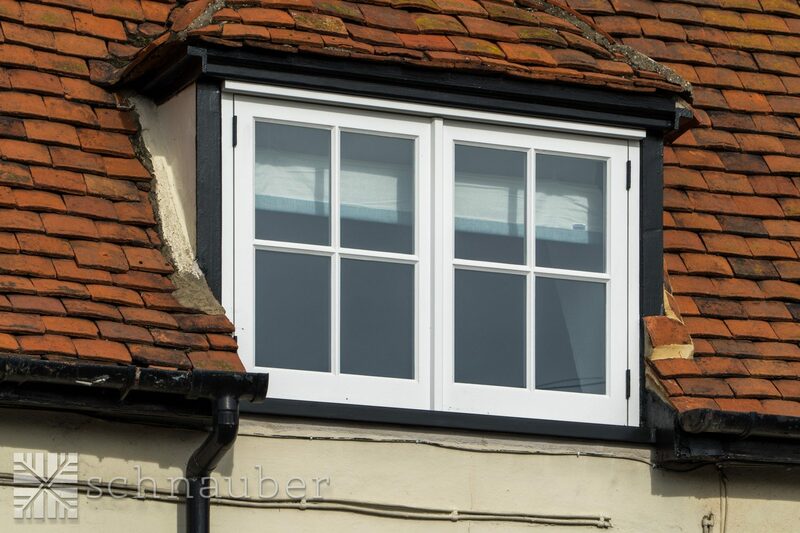 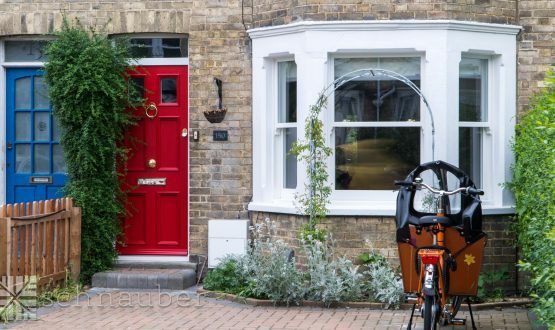 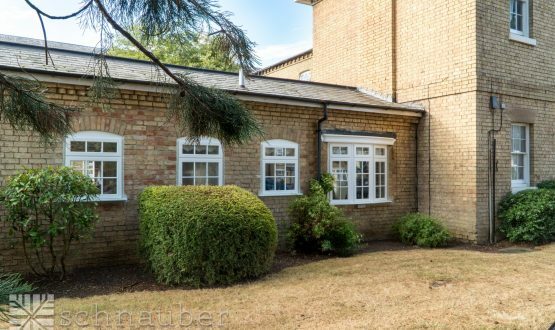 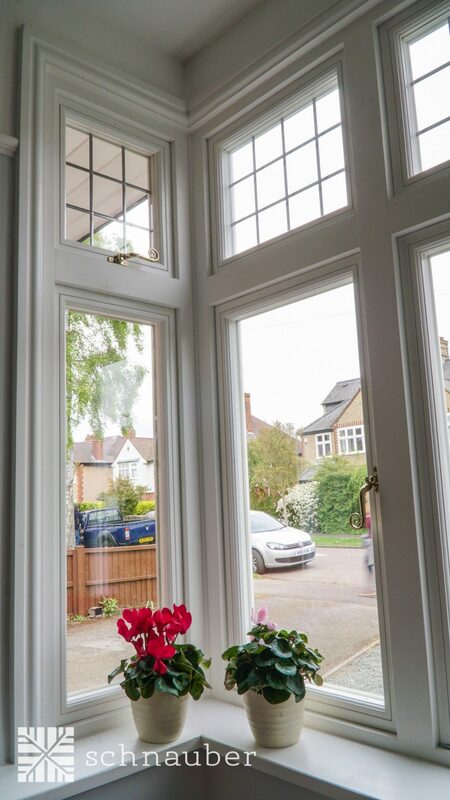 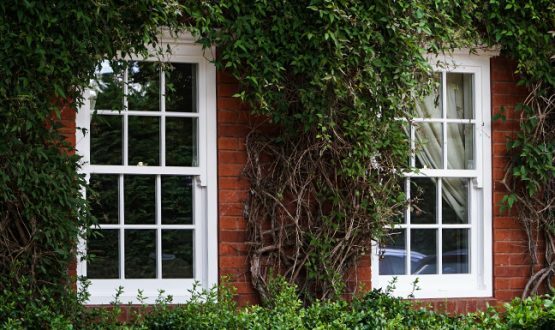 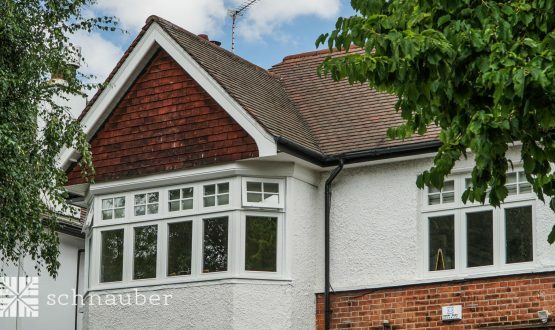 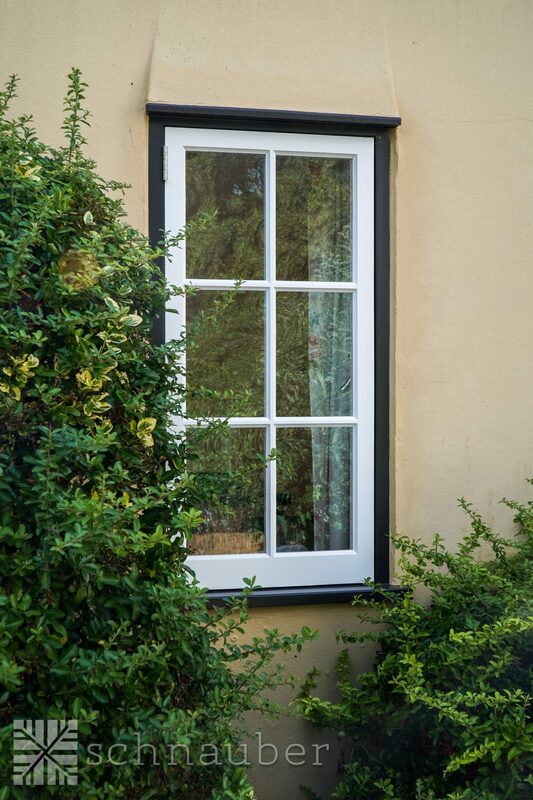 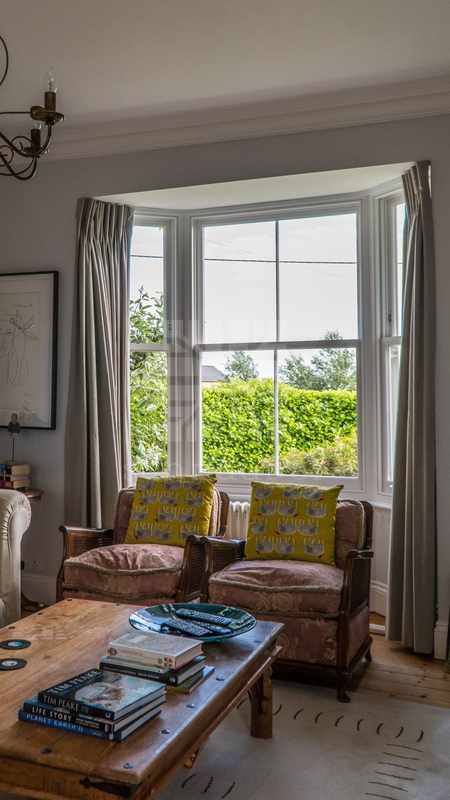 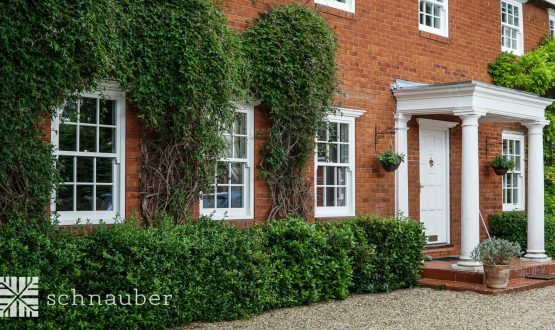 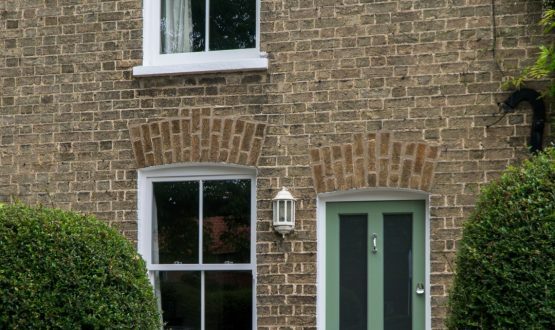 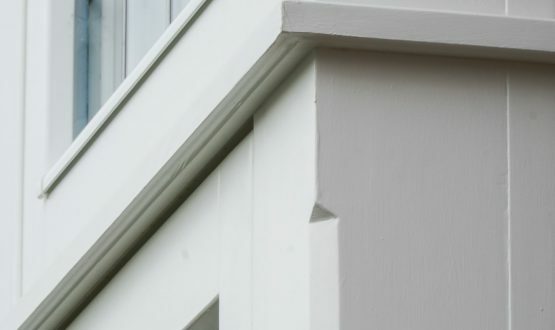 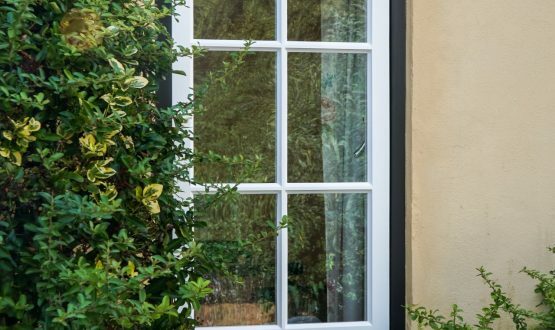 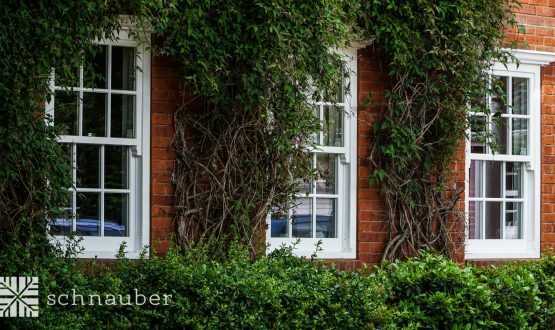 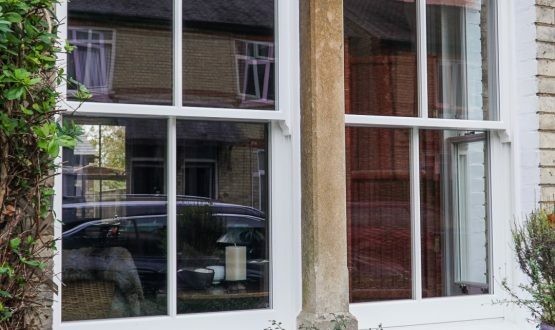 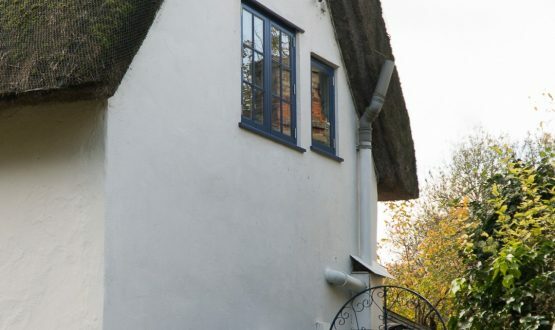 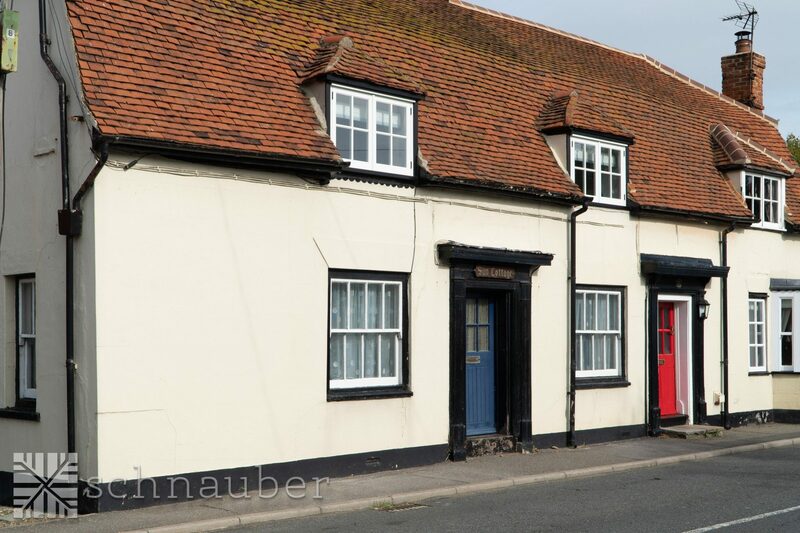 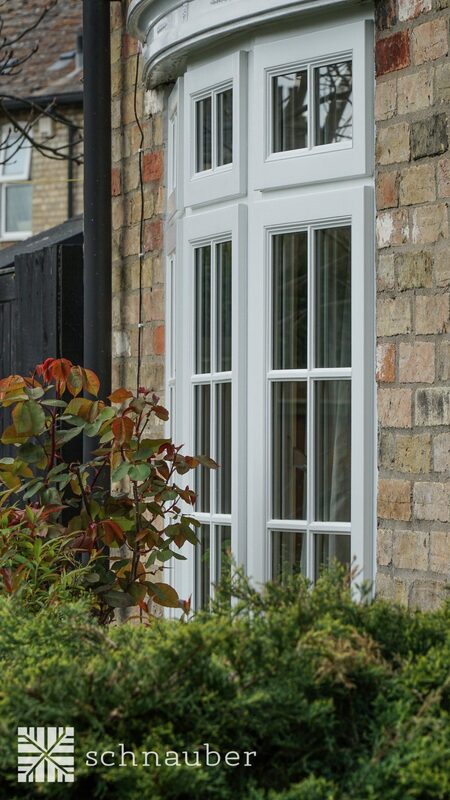 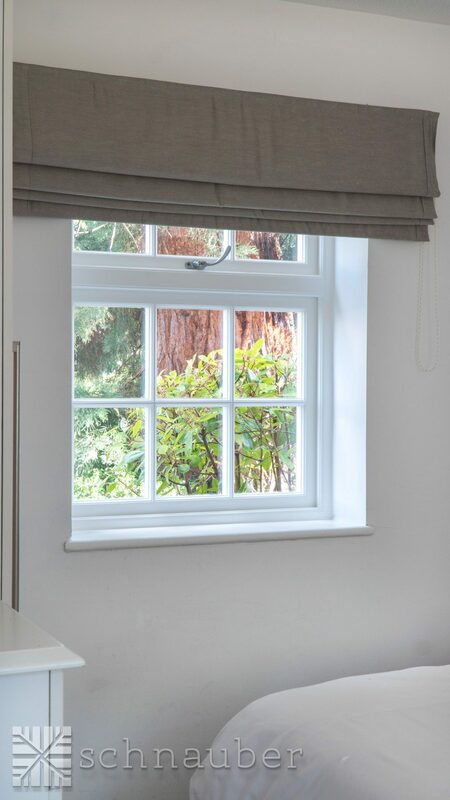 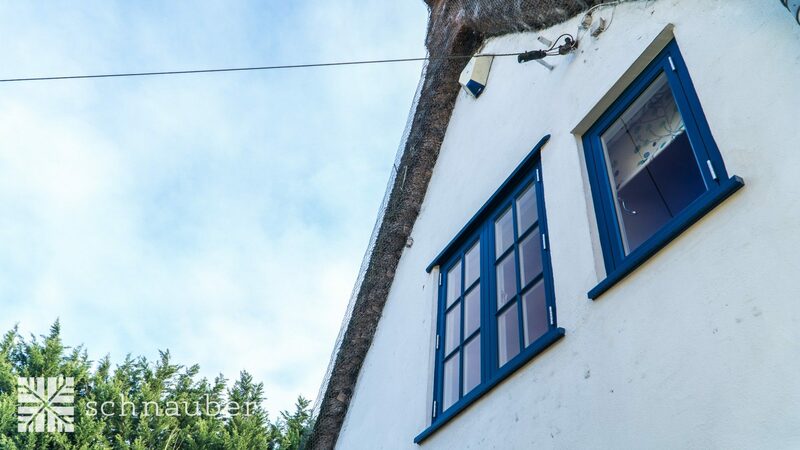 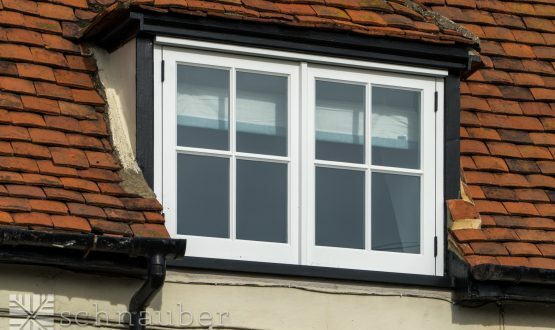 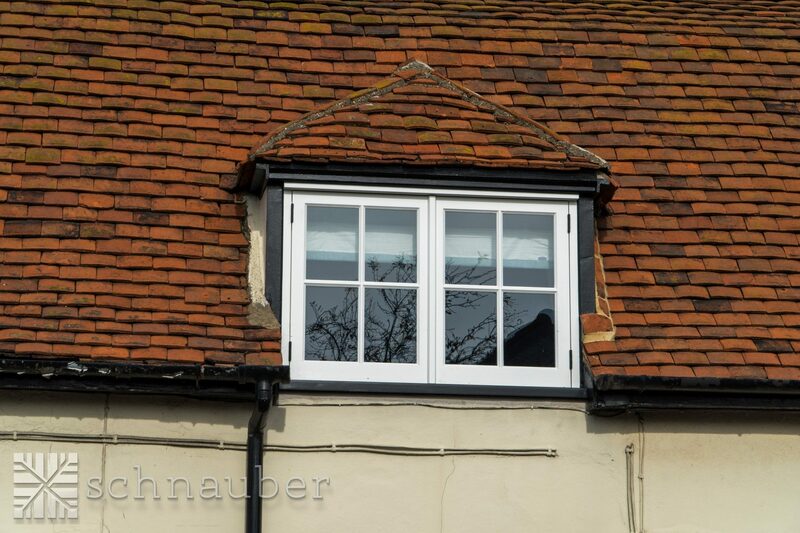 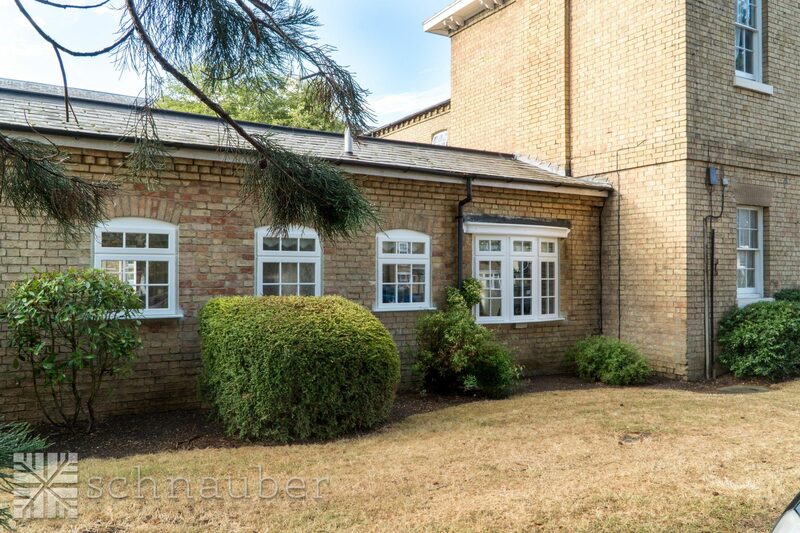 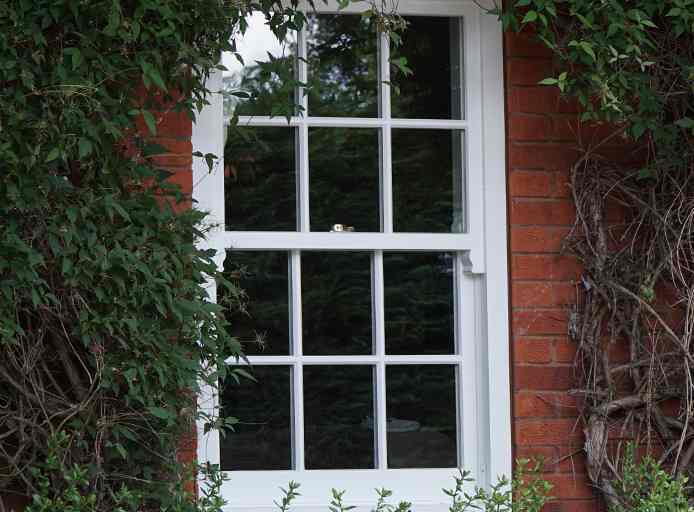 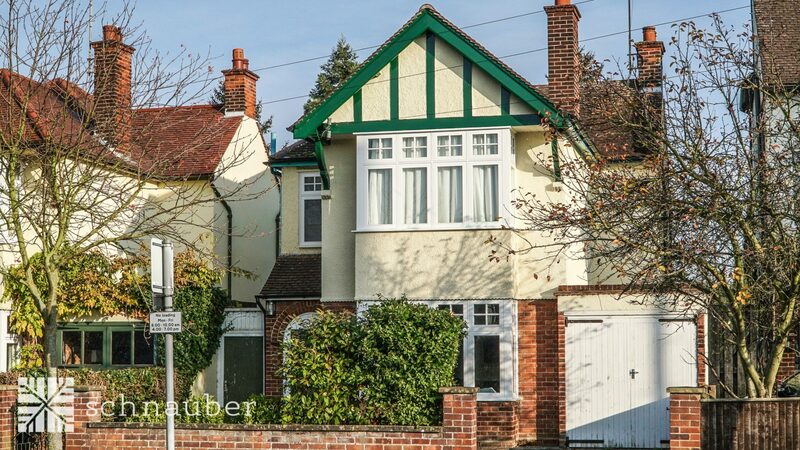 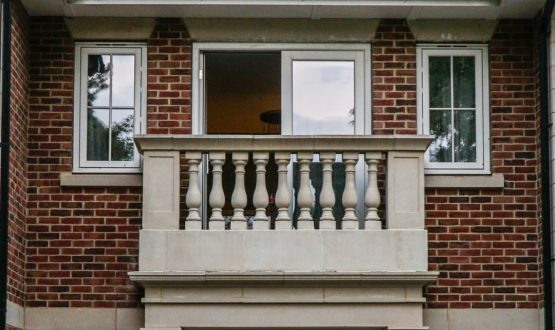 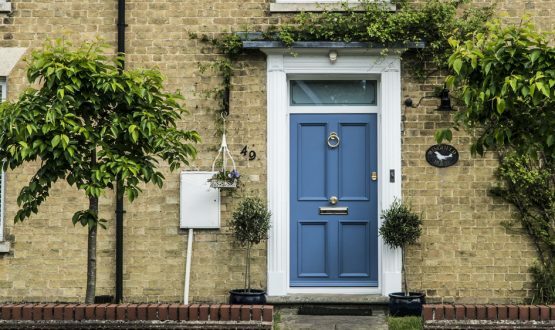 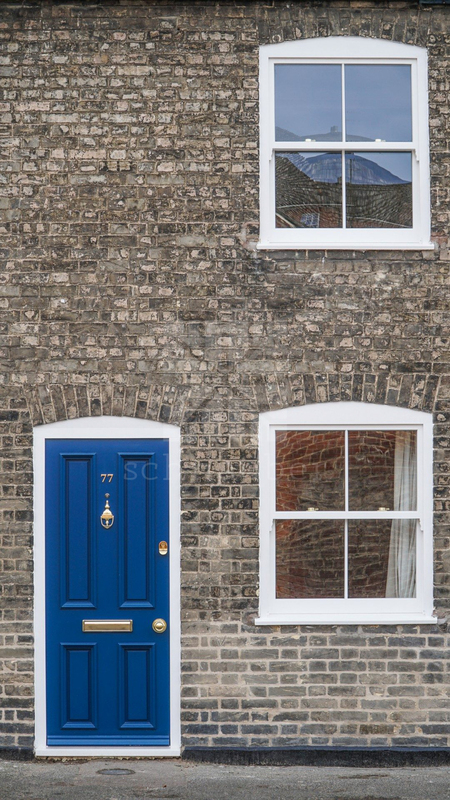 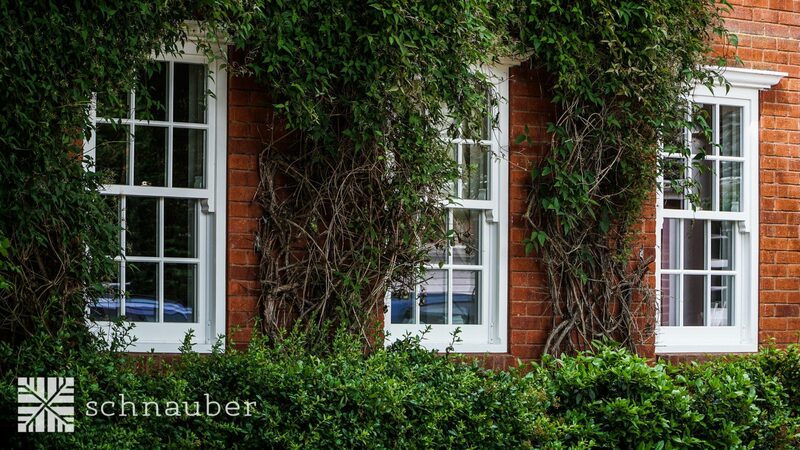 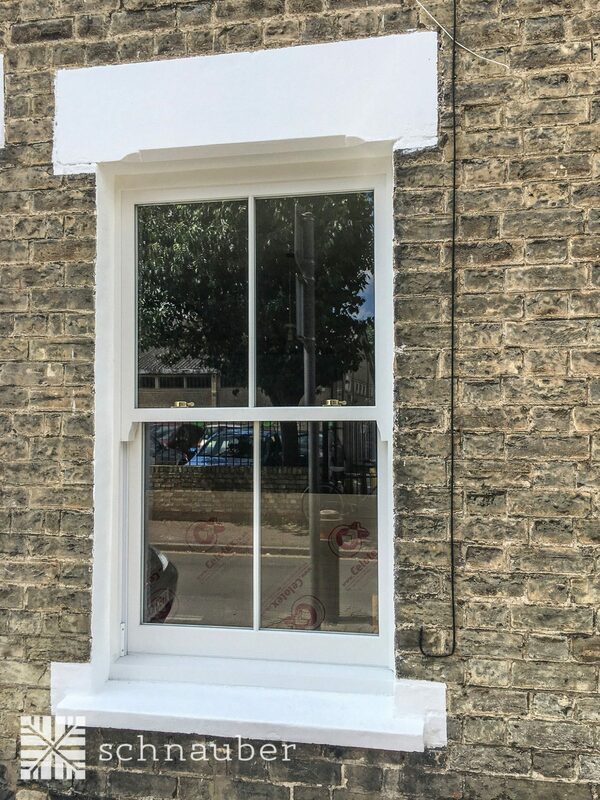 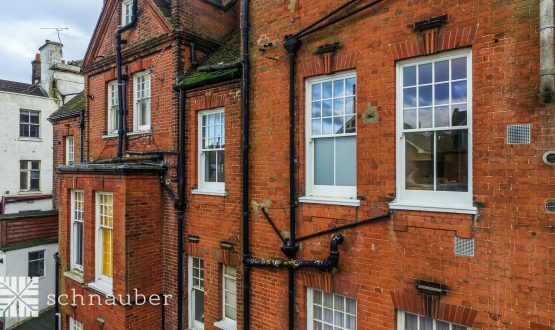 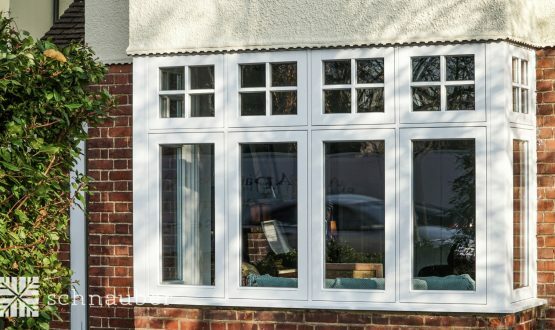 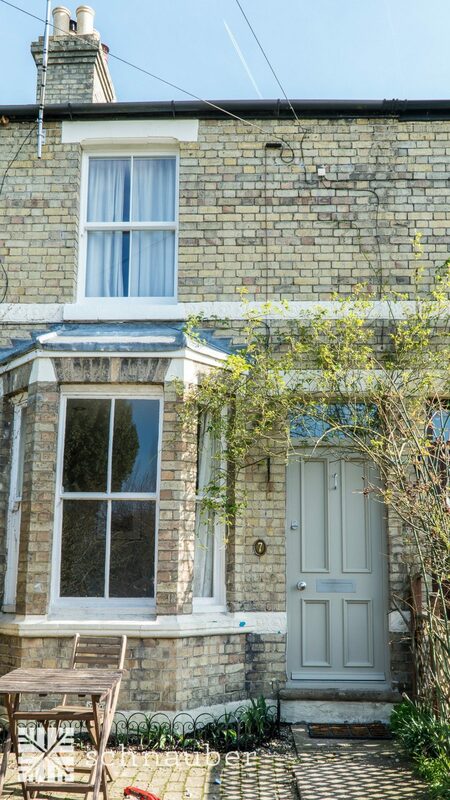 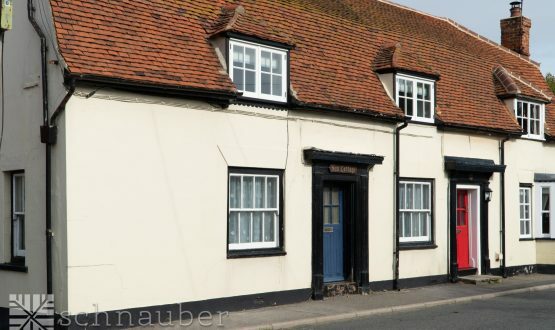 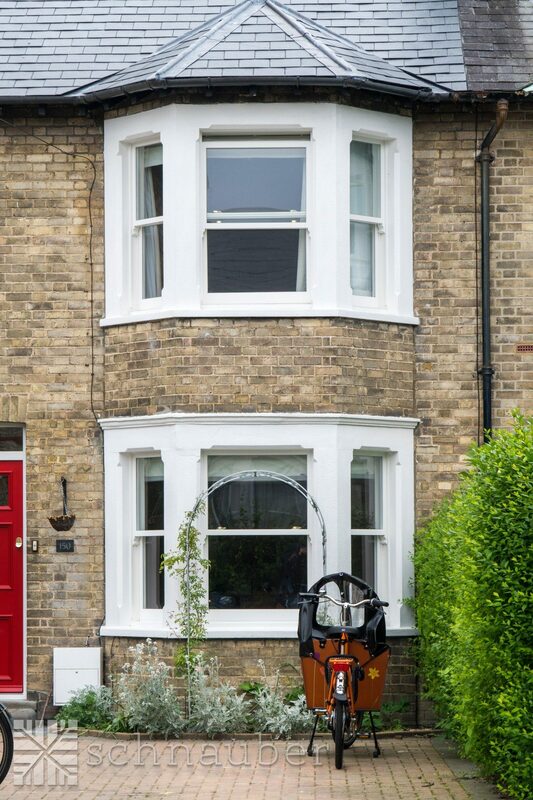 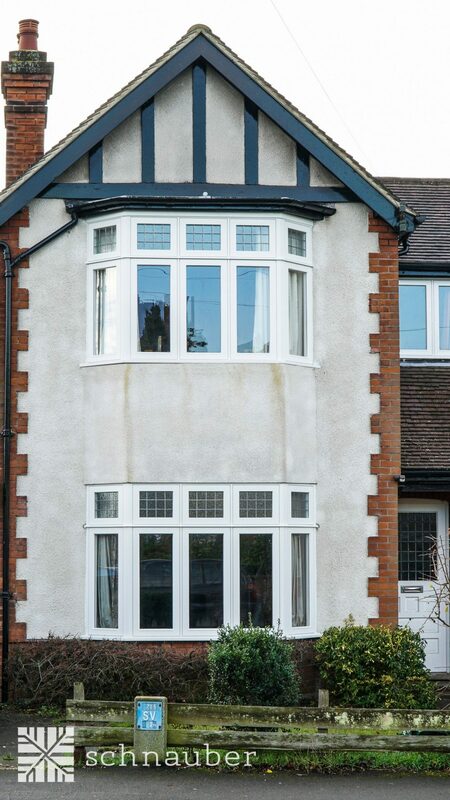 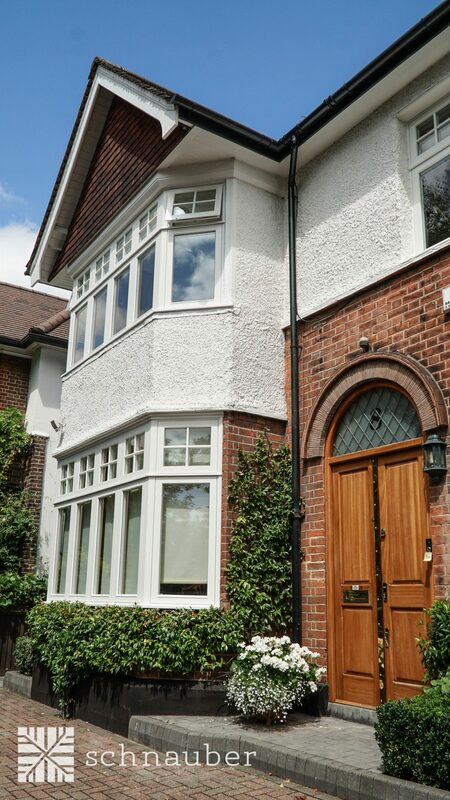 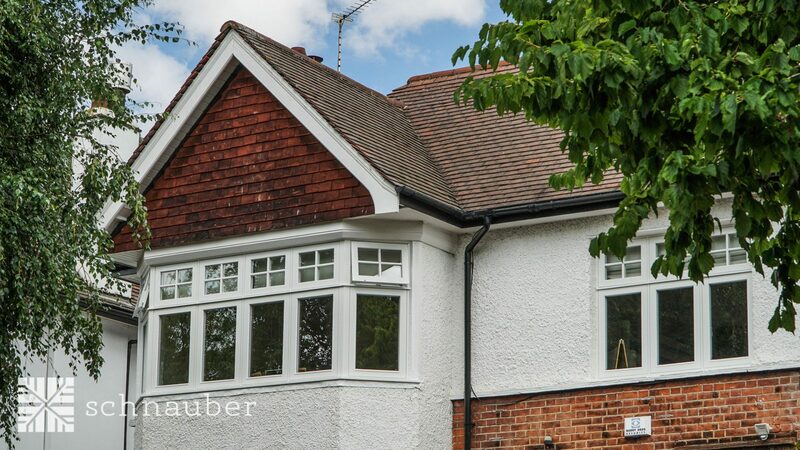 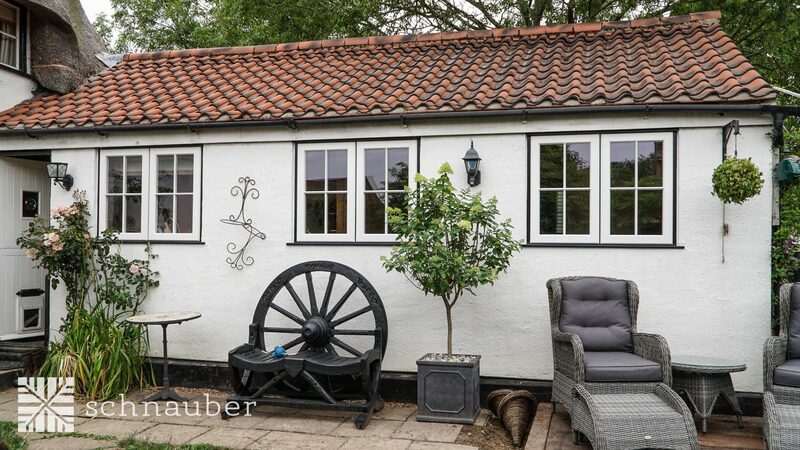 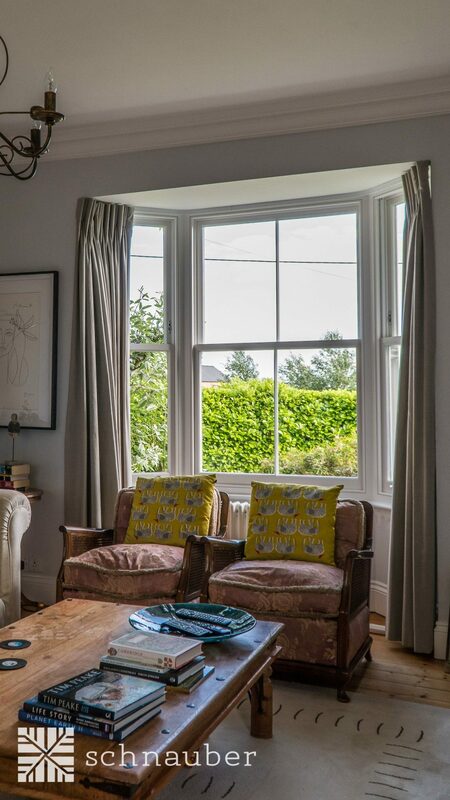 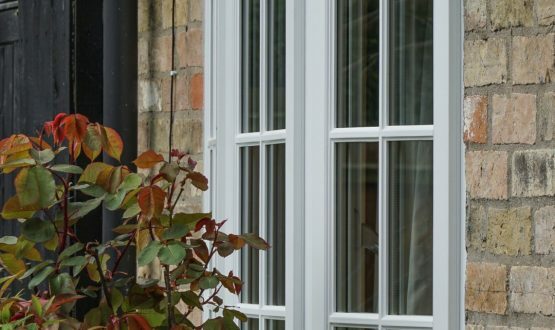 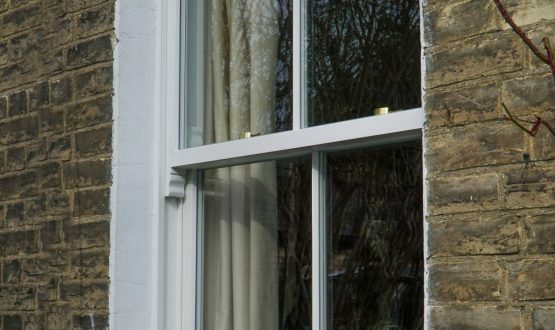 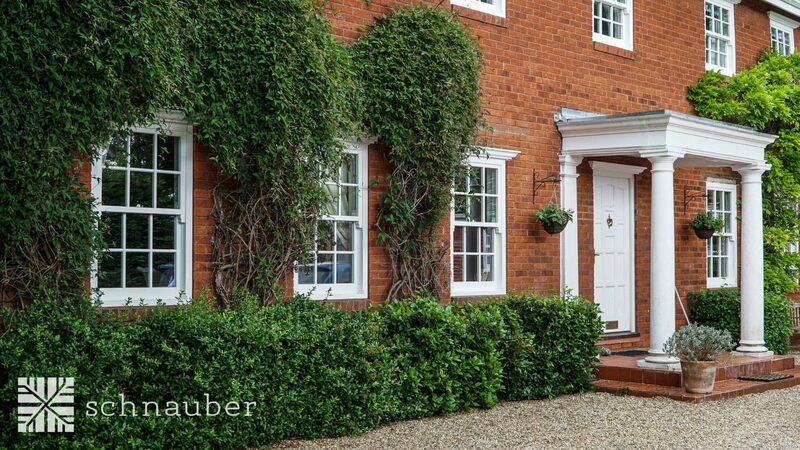 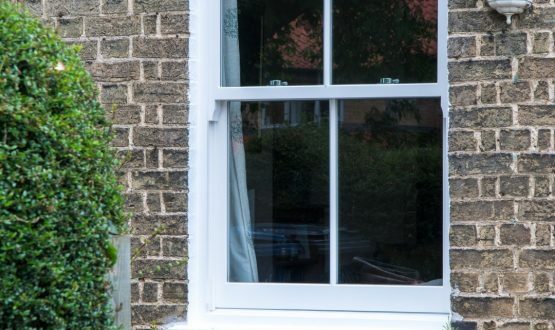 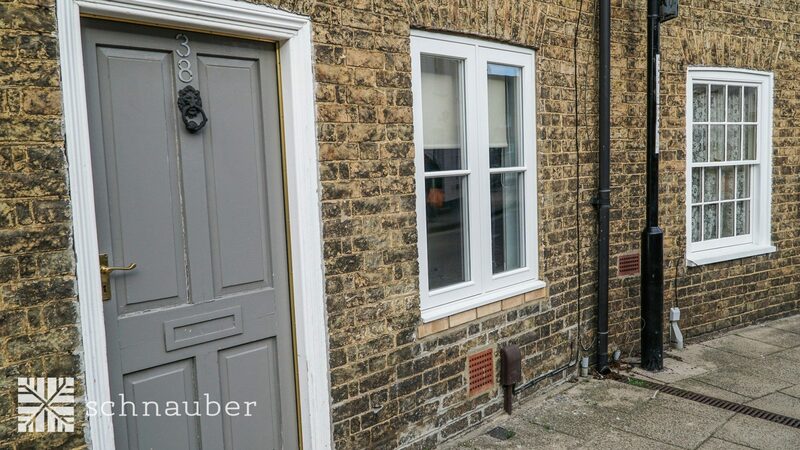 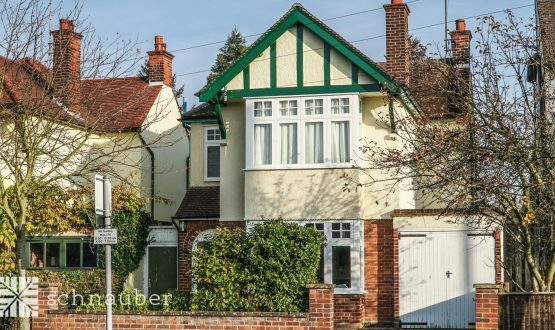 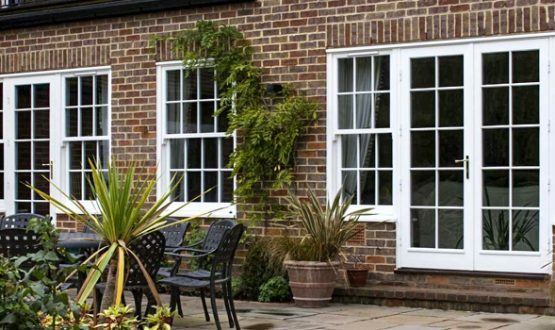 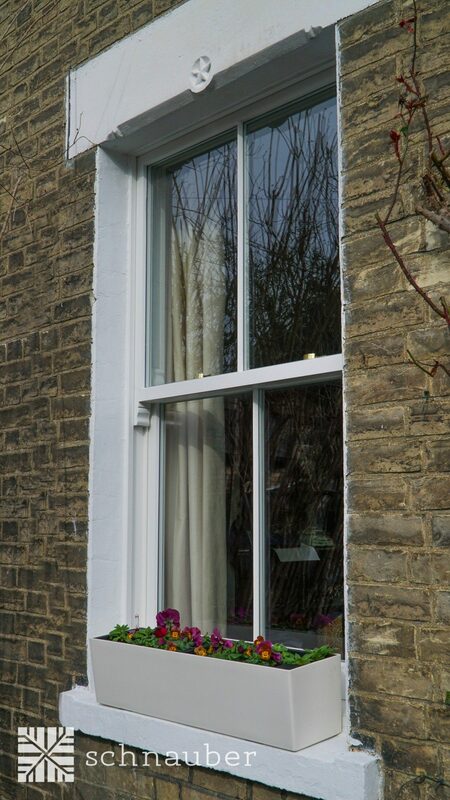 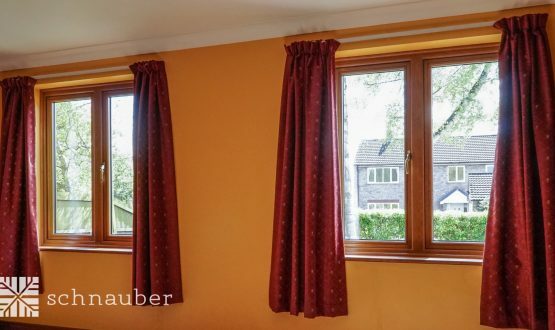 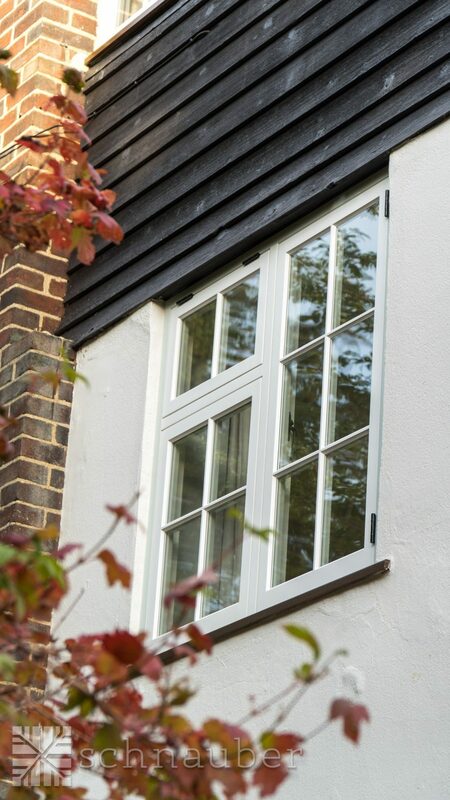 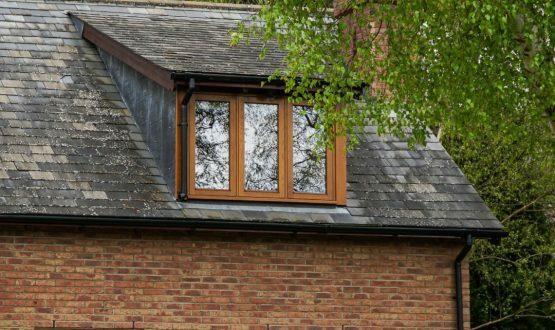 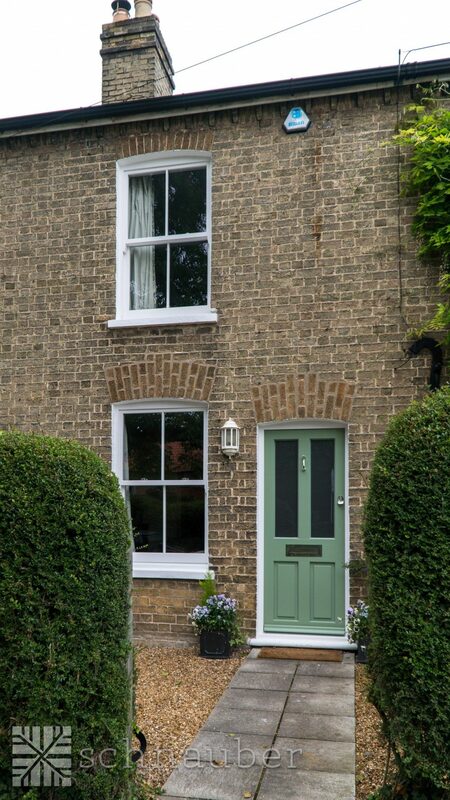 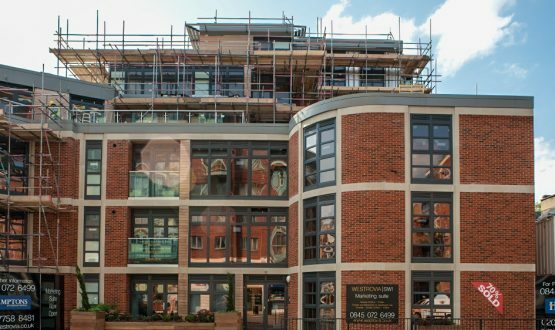 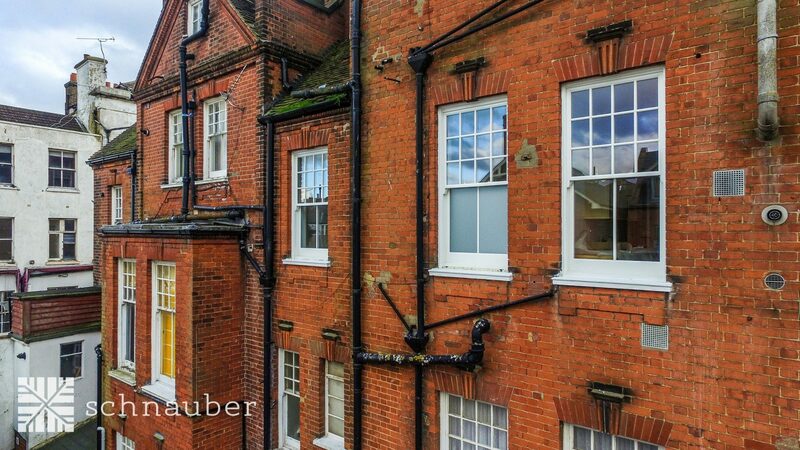 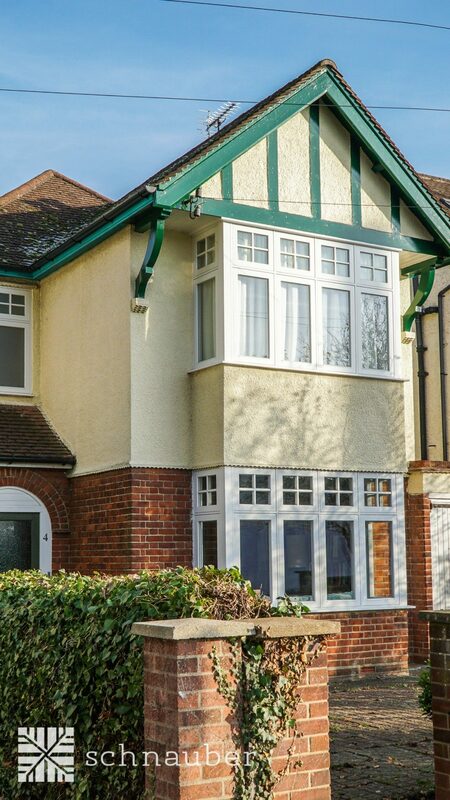 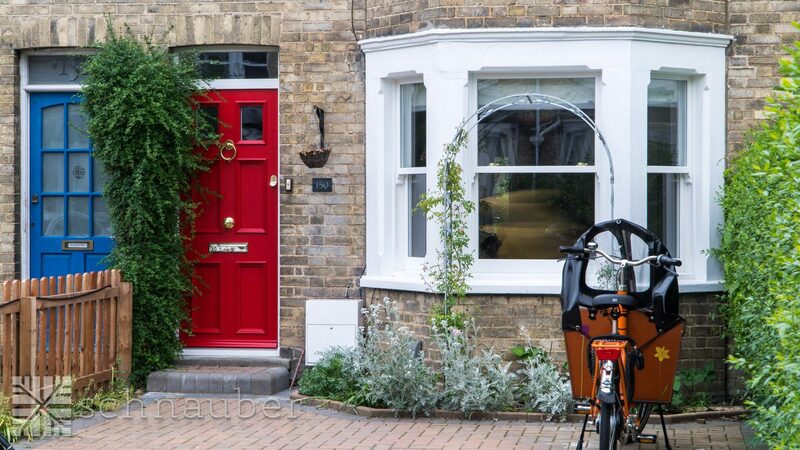 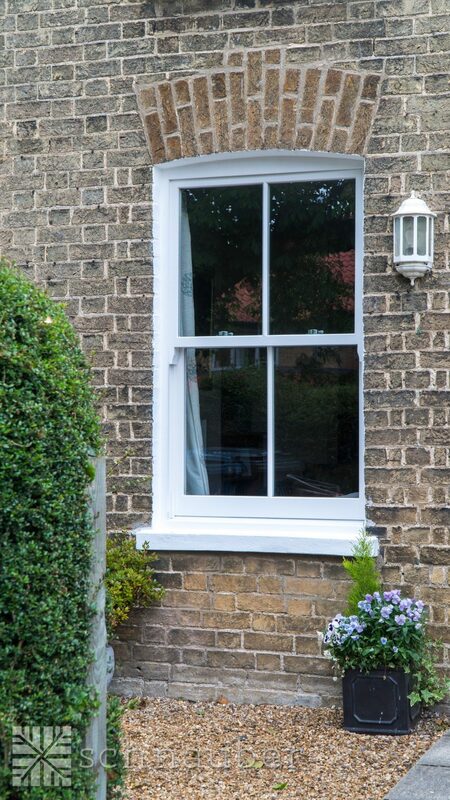 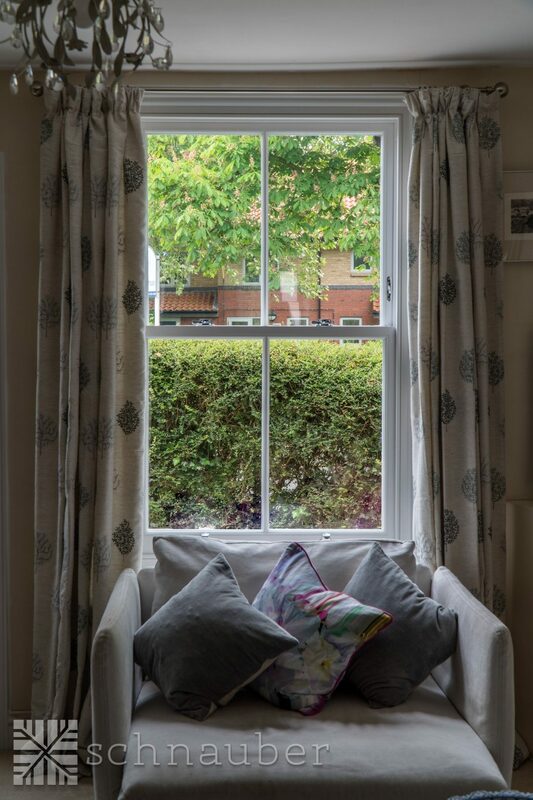 The timber windows are either painted or stained internally in an unlimited range of colours using the latest environmentally friendly water resistant paint technology. 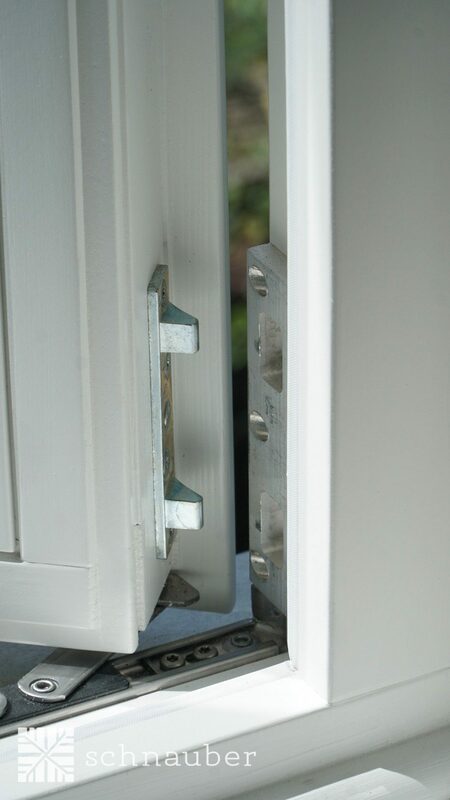 Wide selection of ironmongery including hinges, handles and fittings. 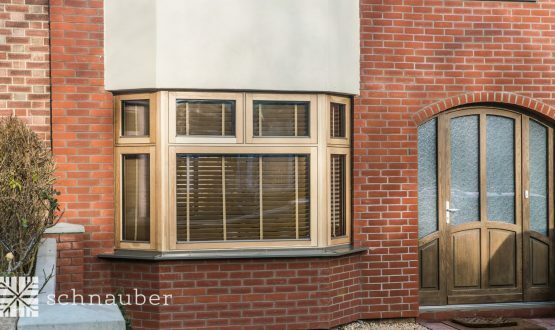 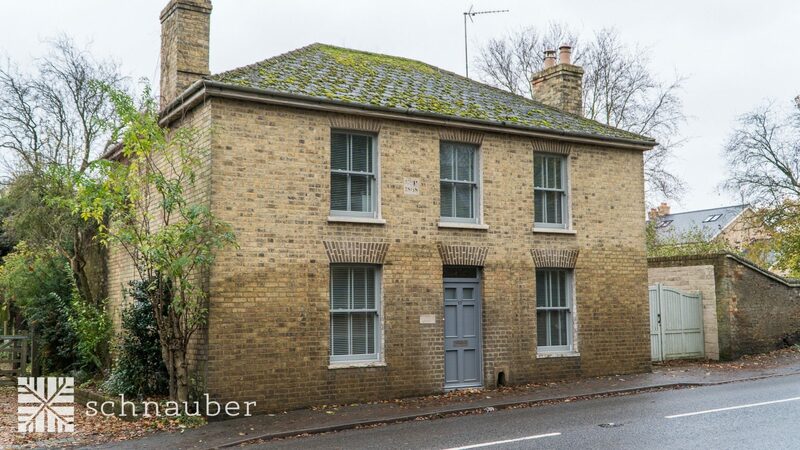 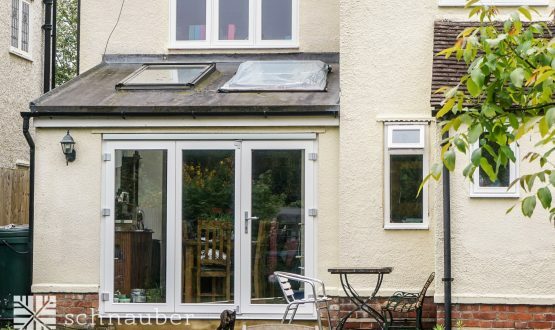 Are Schnauber’s timber Passive House windows environmentally friendly? 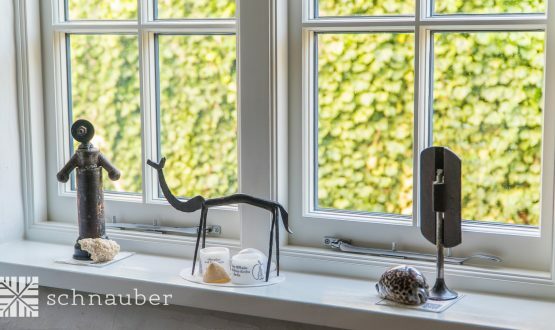 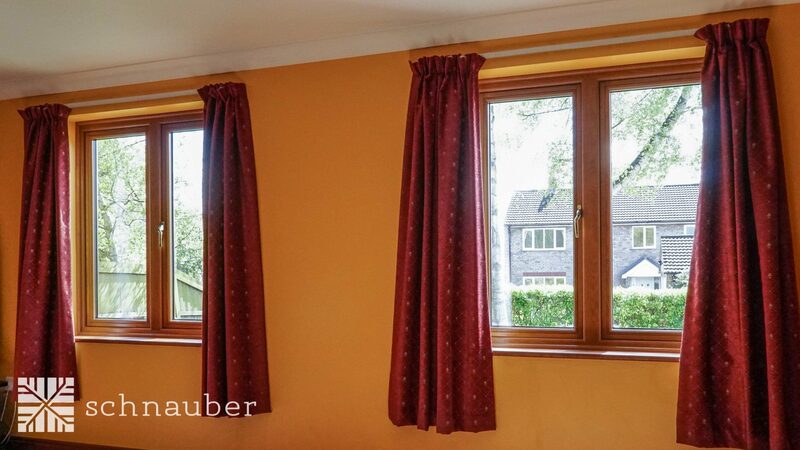 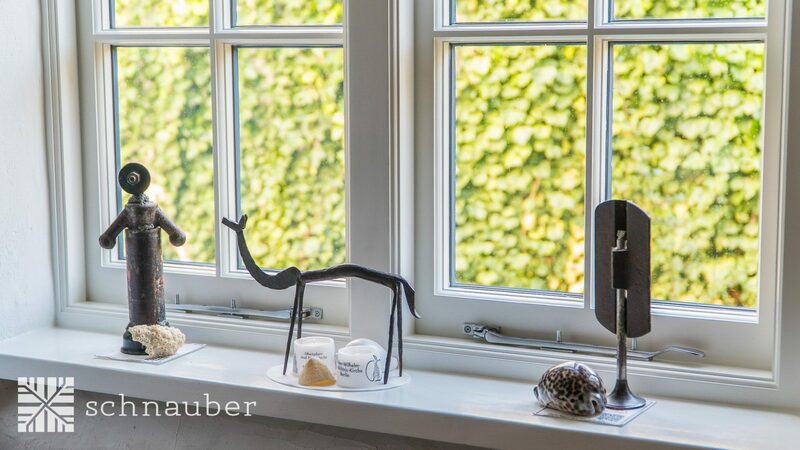 The Passive House windows manufactured by Schnauber all meet the requirements of the German Passivhaus Certification and are the most environmentally friendly windows available. 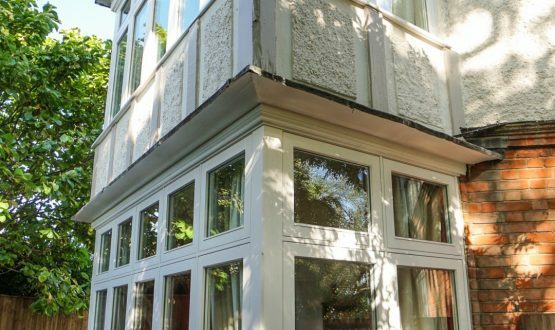 How long will it take to install new Passive House windows? 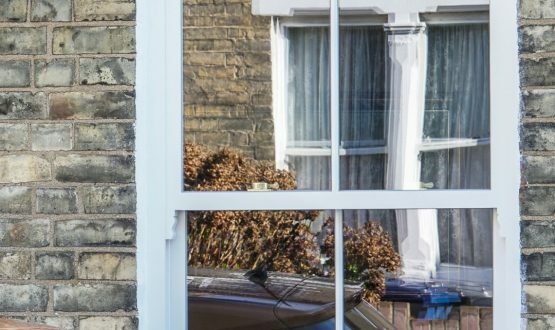 In a typical 3-4 bedroom home having windows replaced upstairs and downstairs it typically takes our team around 5-8 days. 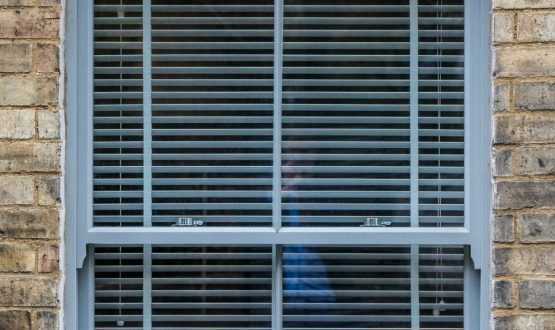 How easy are Passive House windows to maintain once they have been installed? 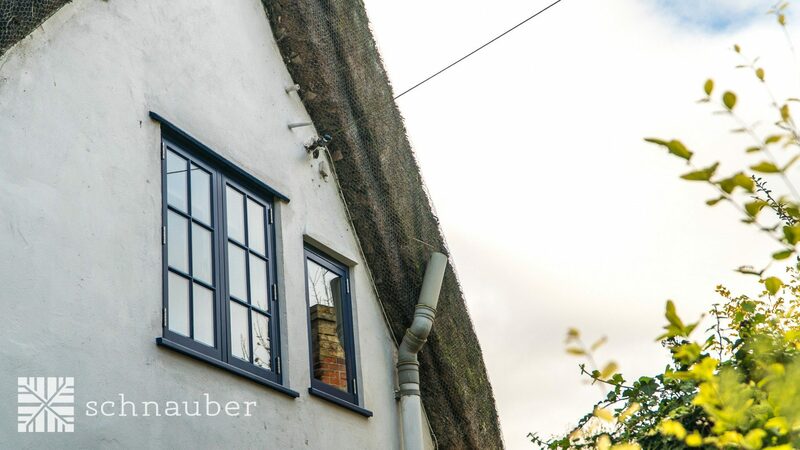 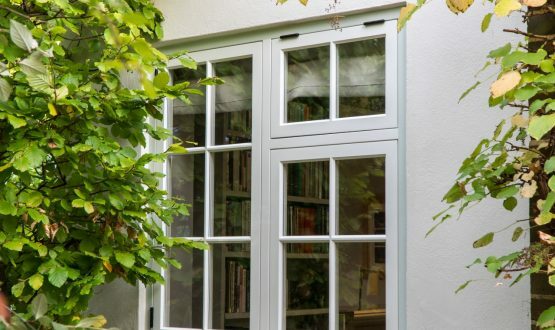 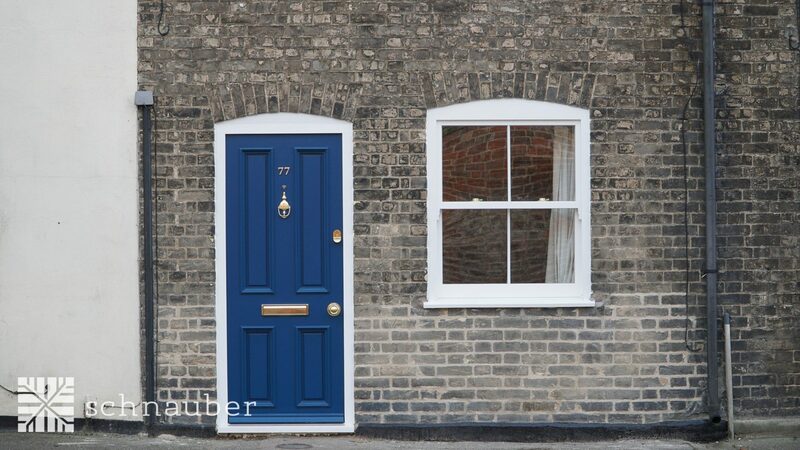 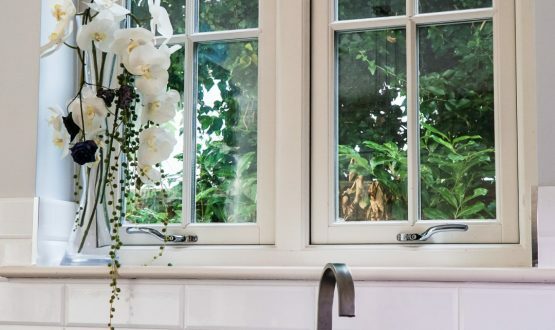 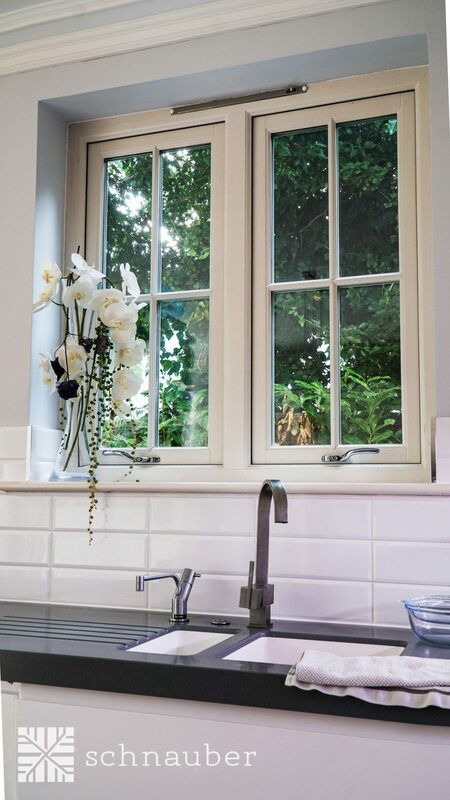 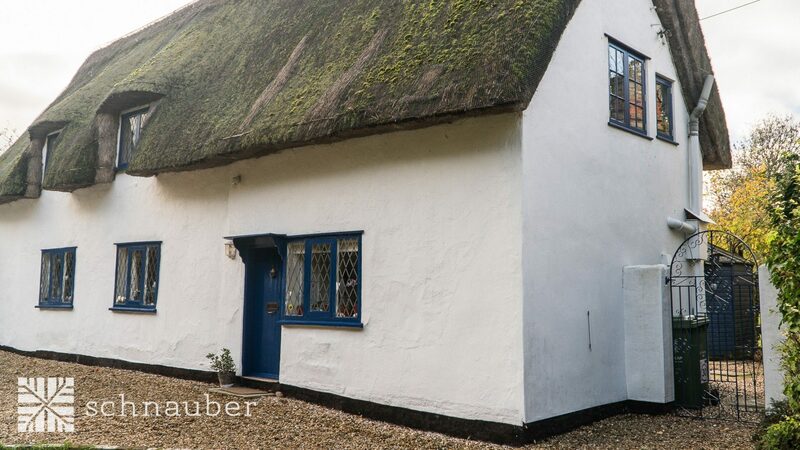 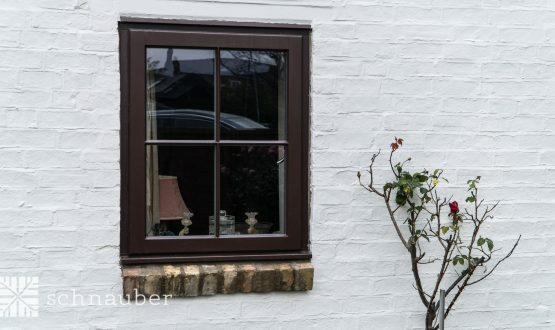 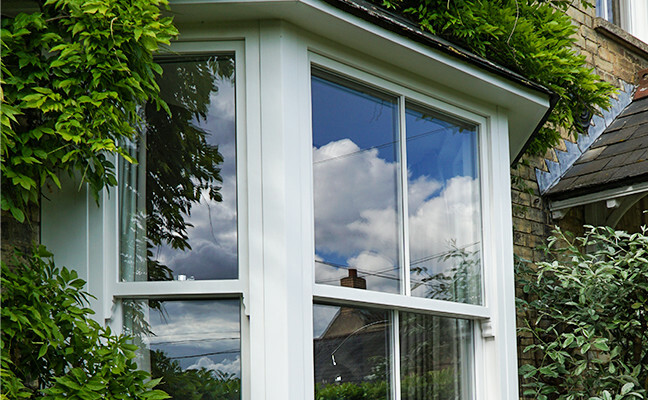 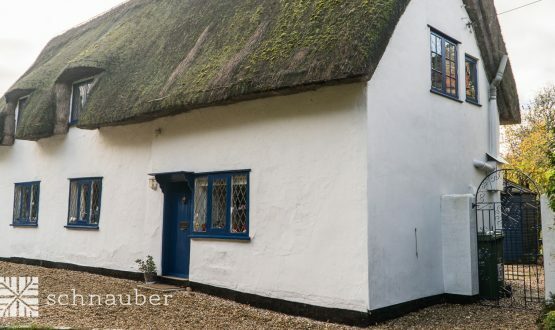 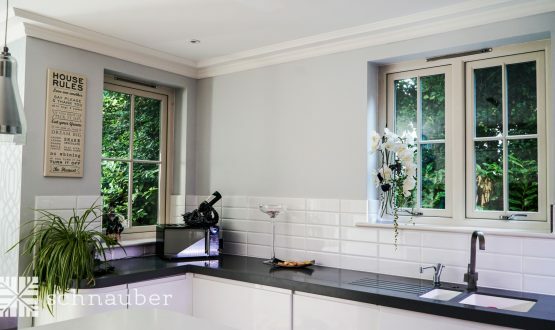 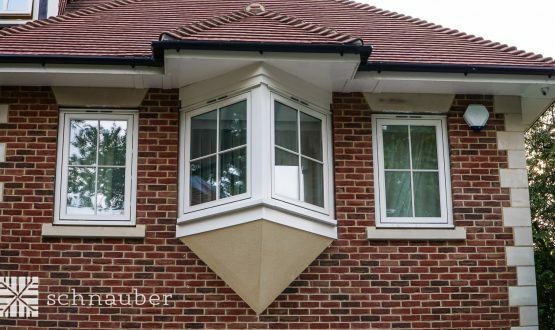 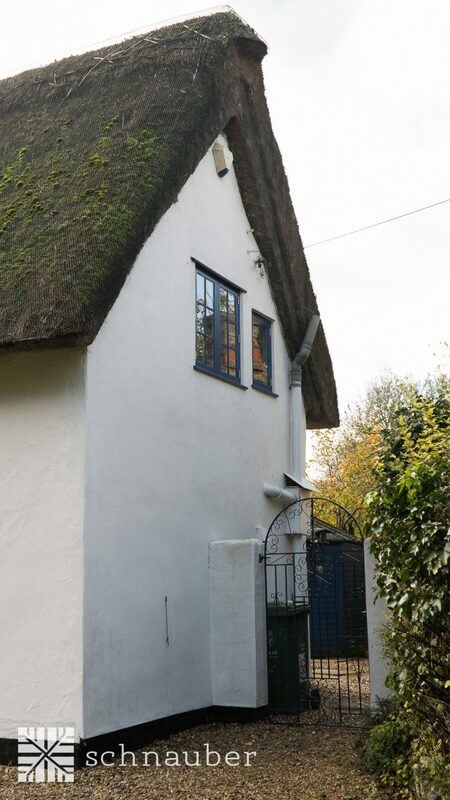 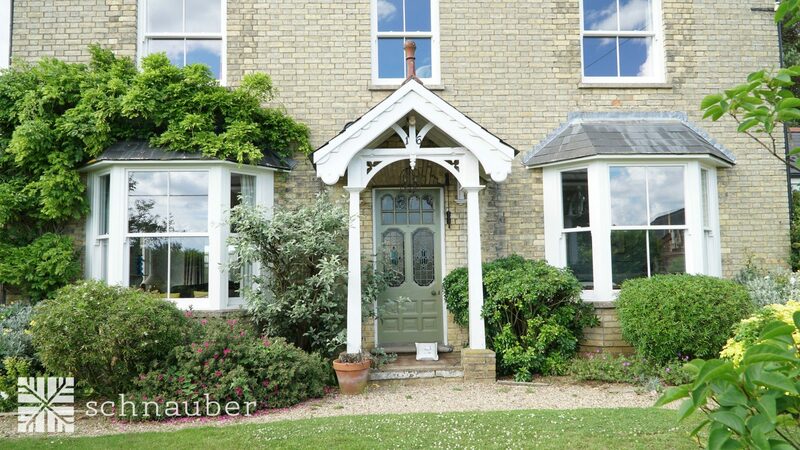 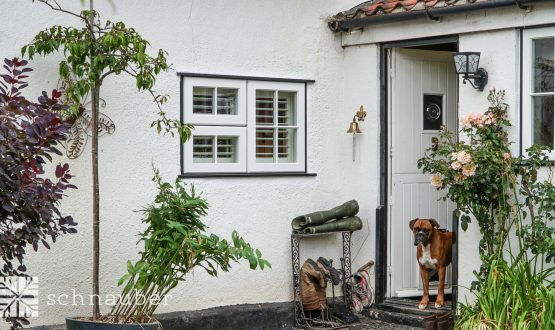 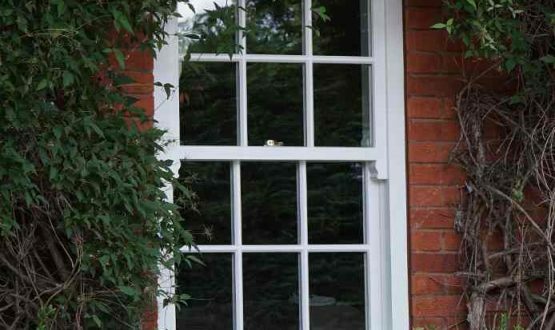 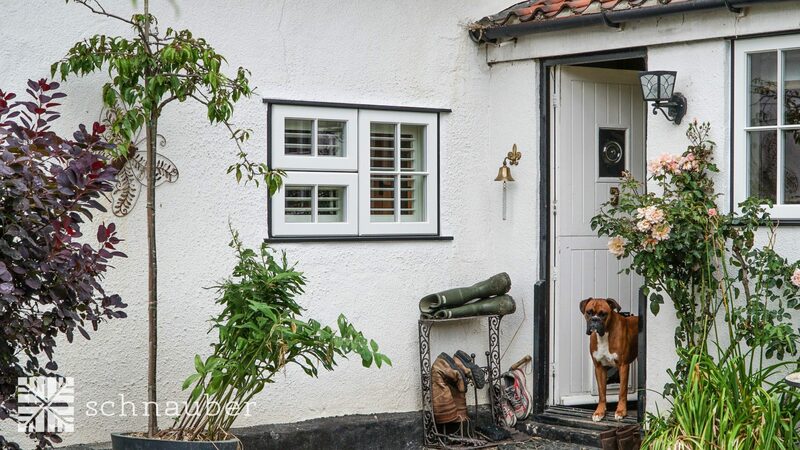 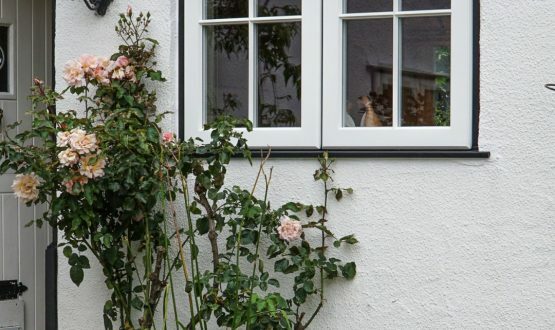 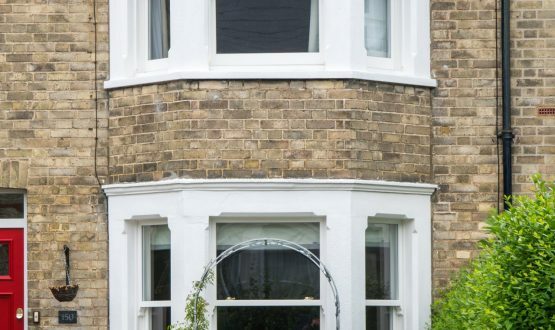 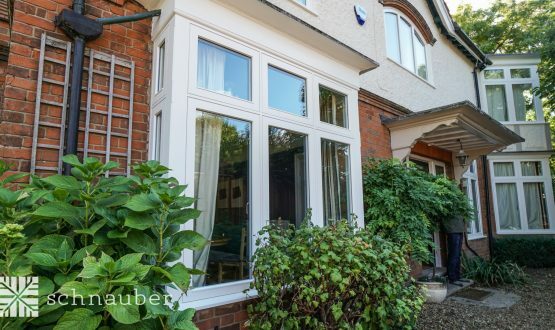 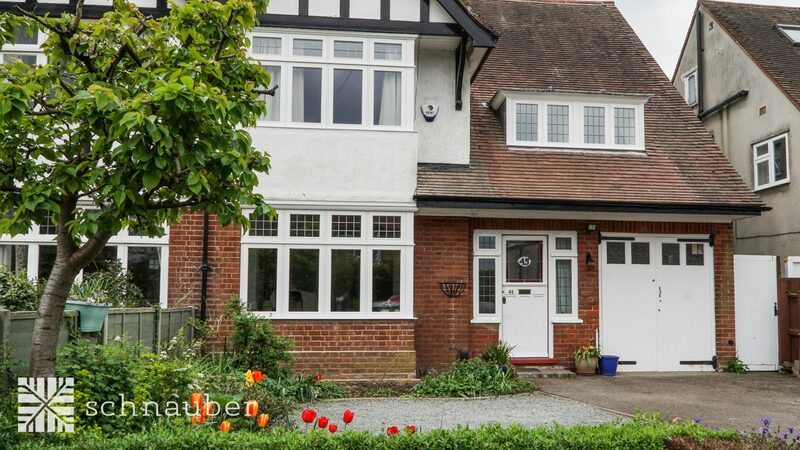 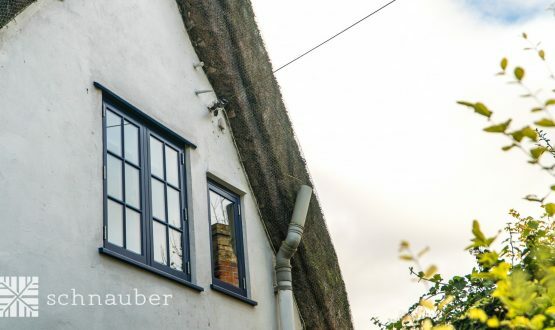 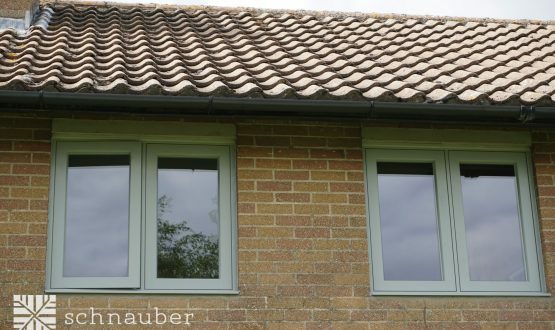 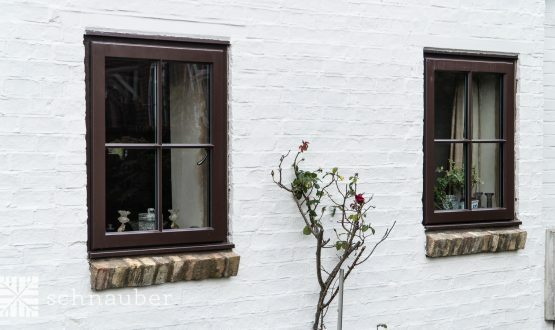 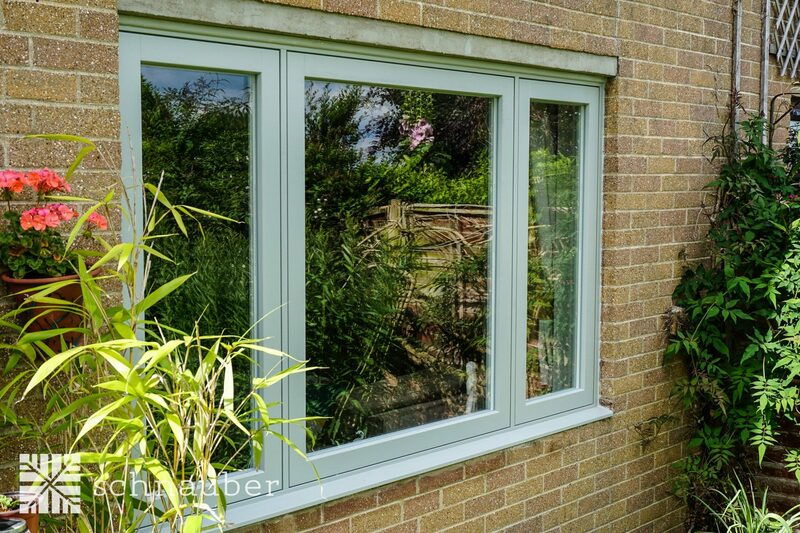 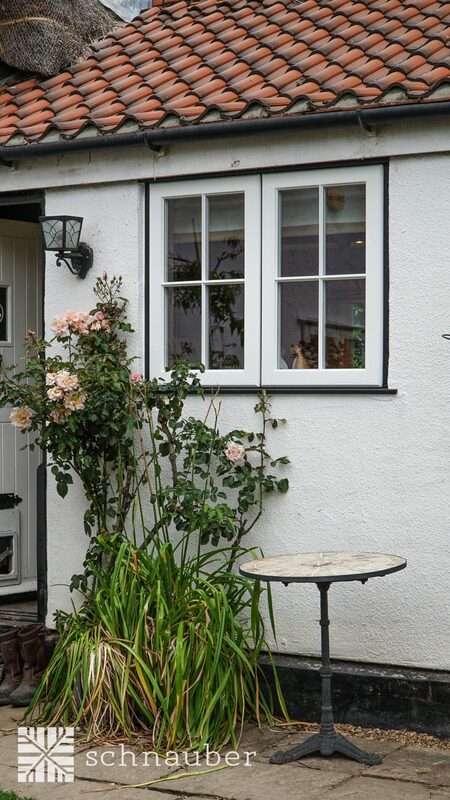 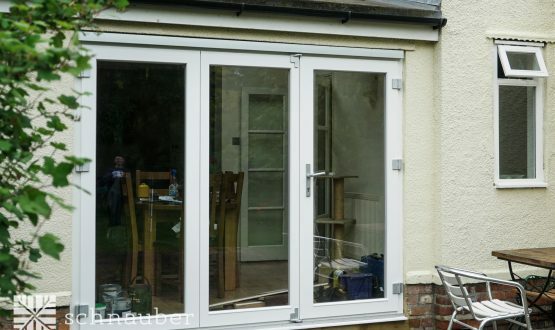 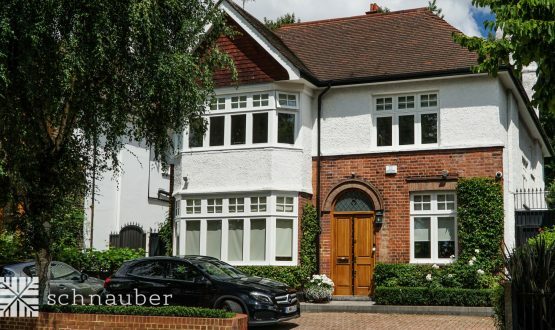 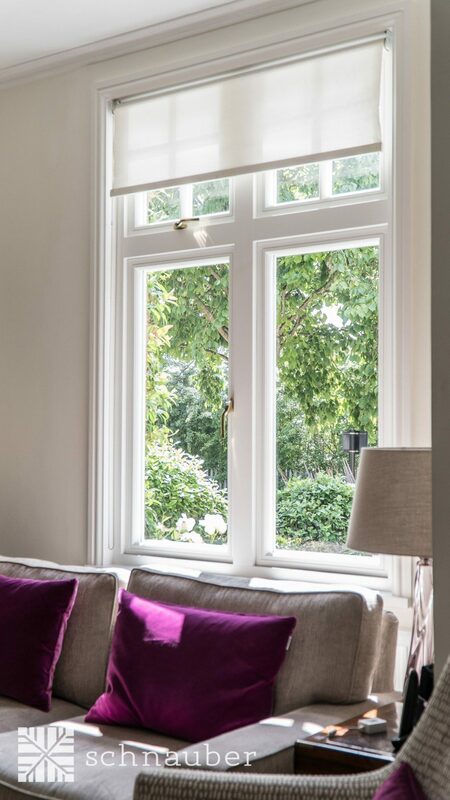 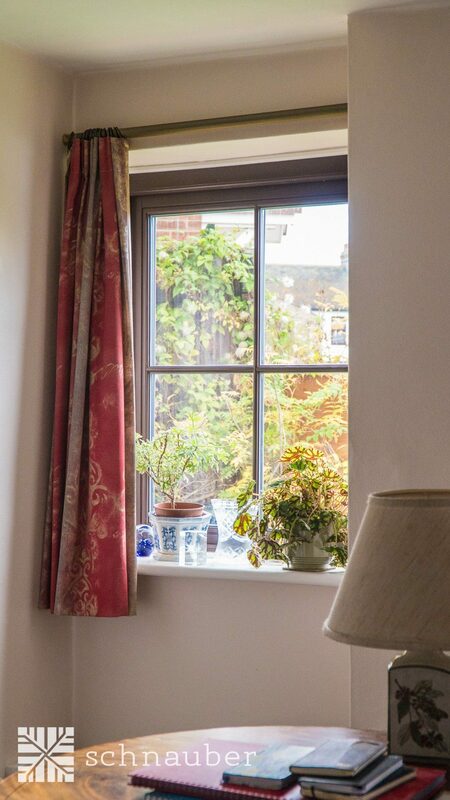 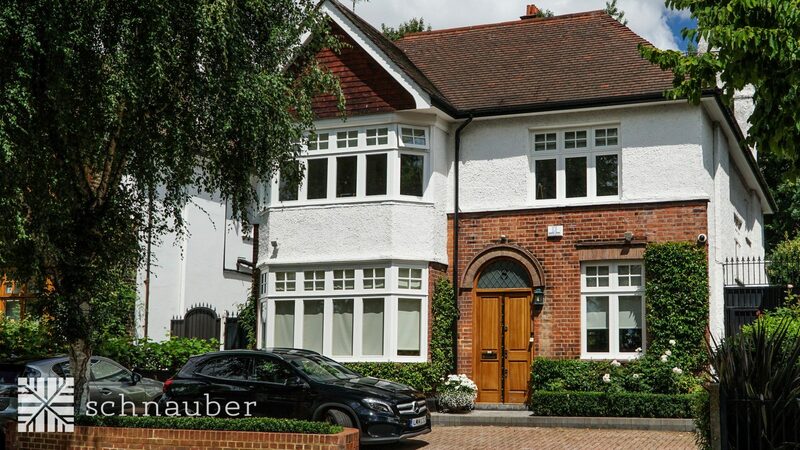 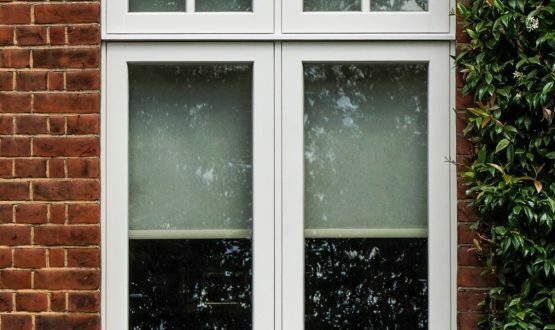 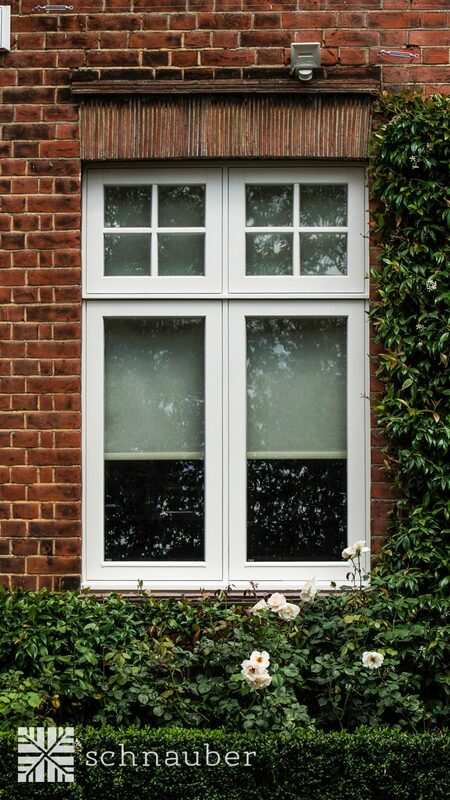 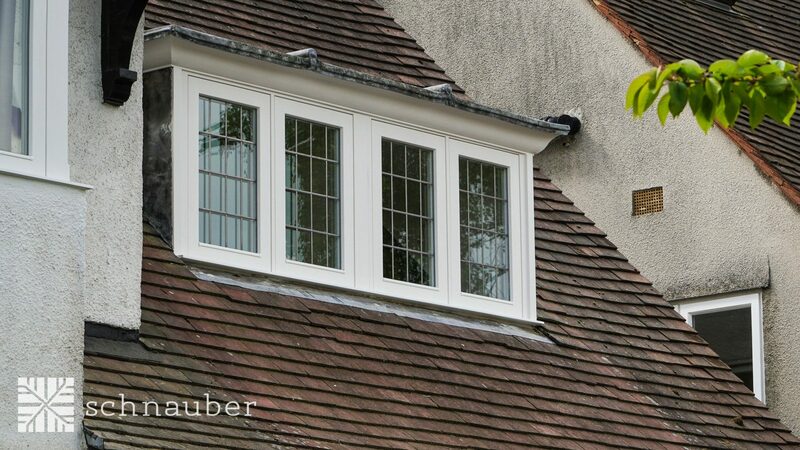 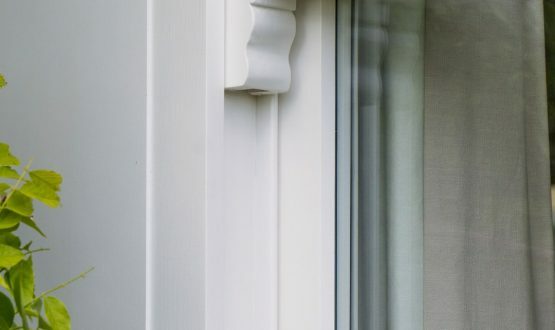 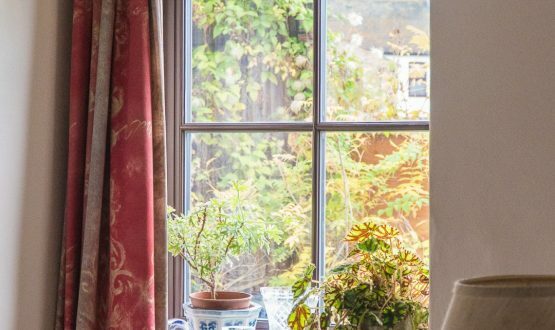 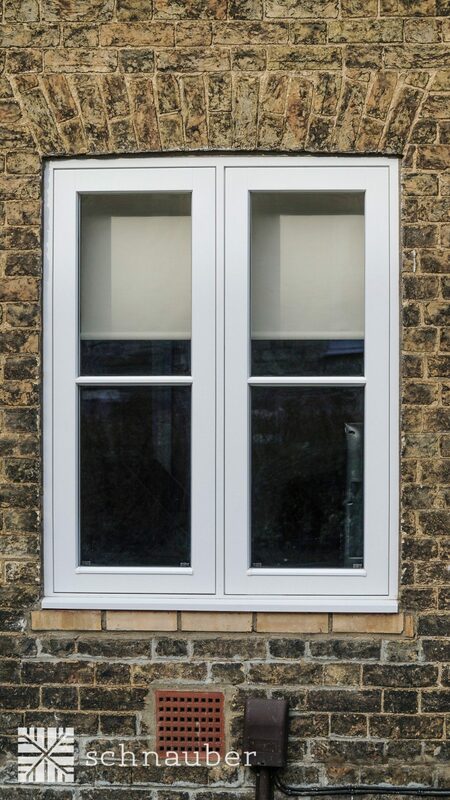 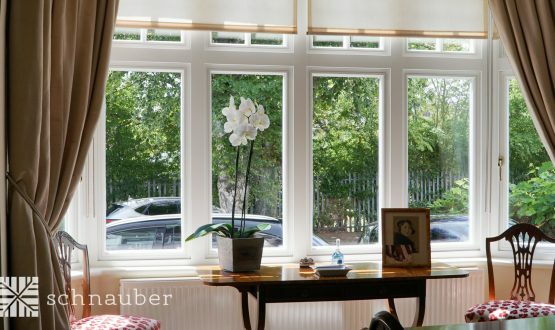 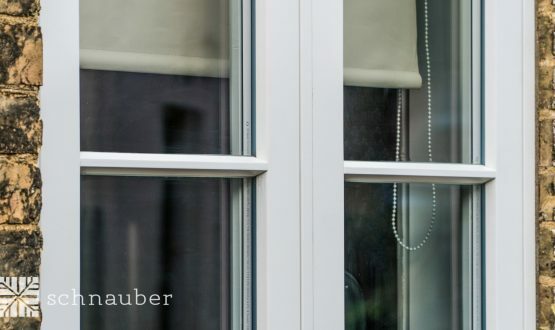 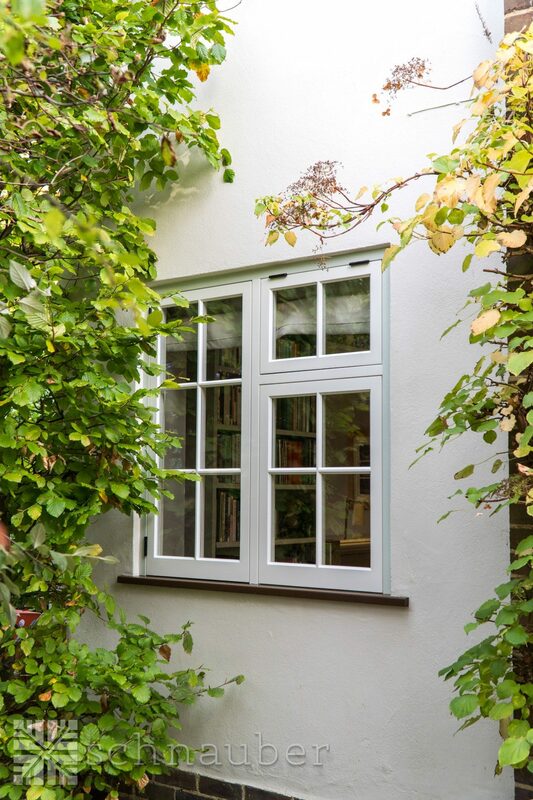 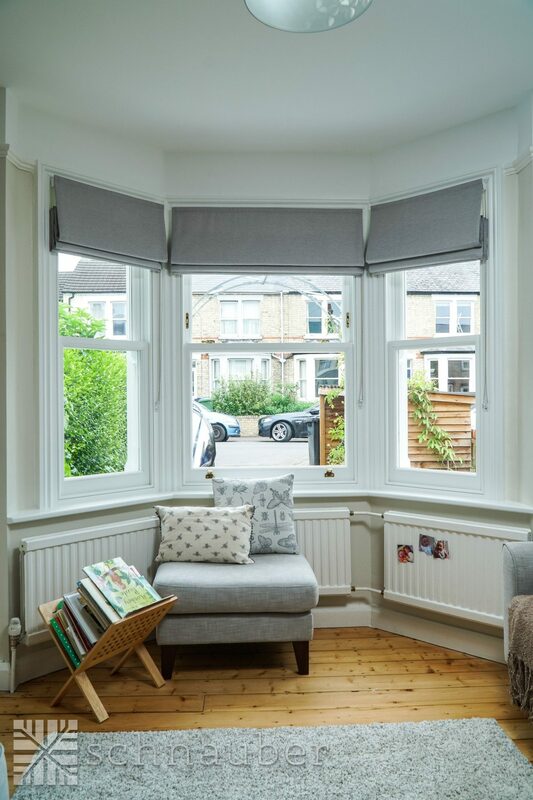 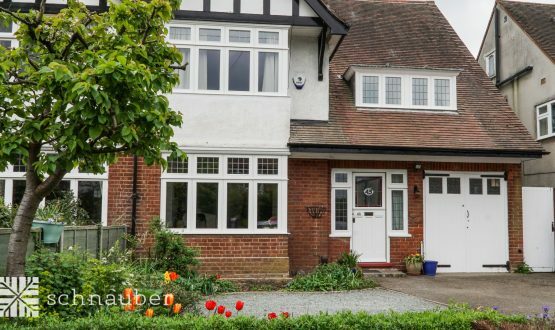 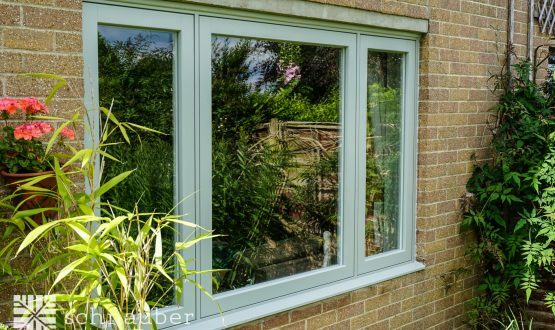 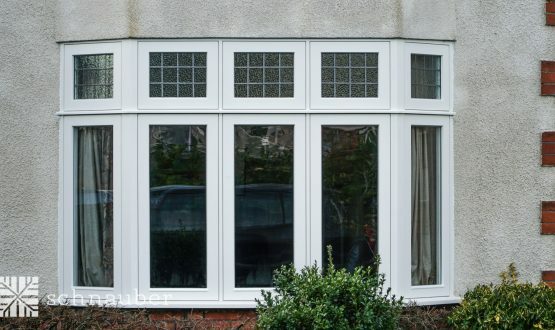 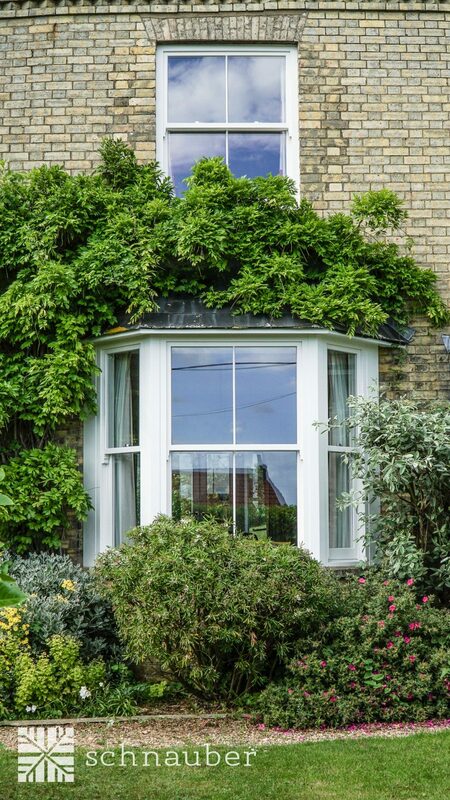 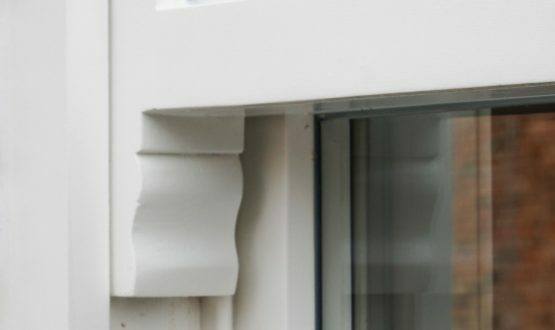 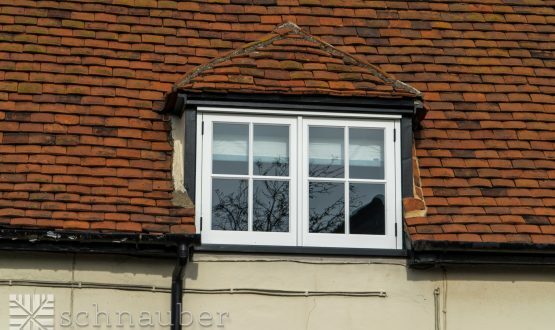 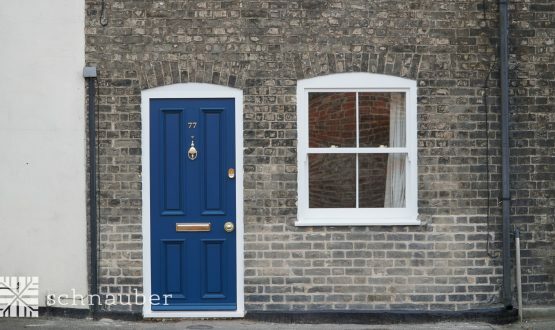 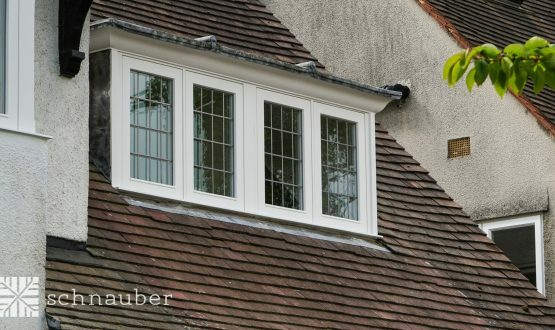 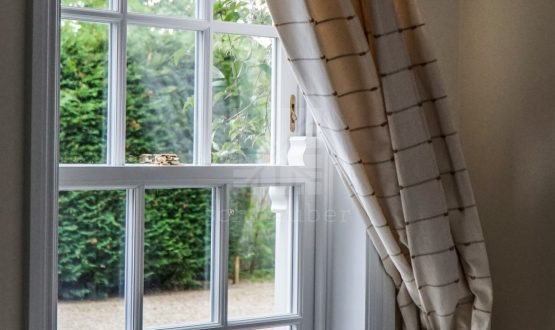 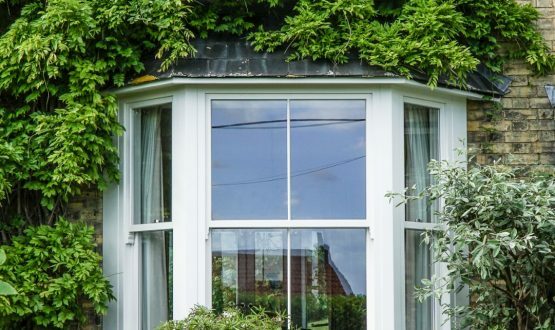 All Schnauber windows are low maintenance, however the level of maintenance will vary depending upon the type of window selected from 5-10 years for timber windows to maintenance free for the aluminium clad timber window. 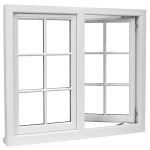 Ease of cleaning will depend upon the style of window that has been chosen. 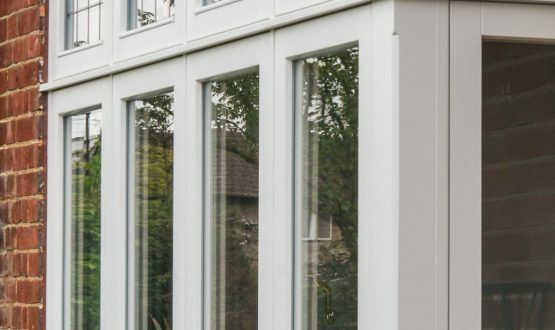 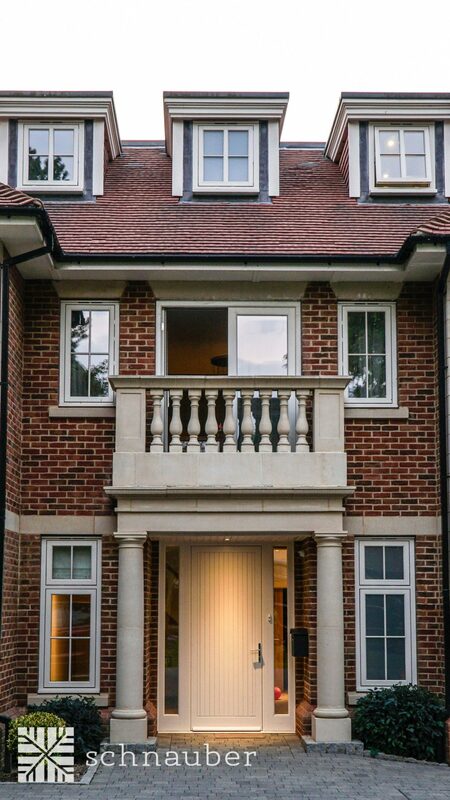 This range of windows are to be specified for those who understand the reduced environmental impact and monetary savings to be made from high performance and are serious about achieving good architecture.